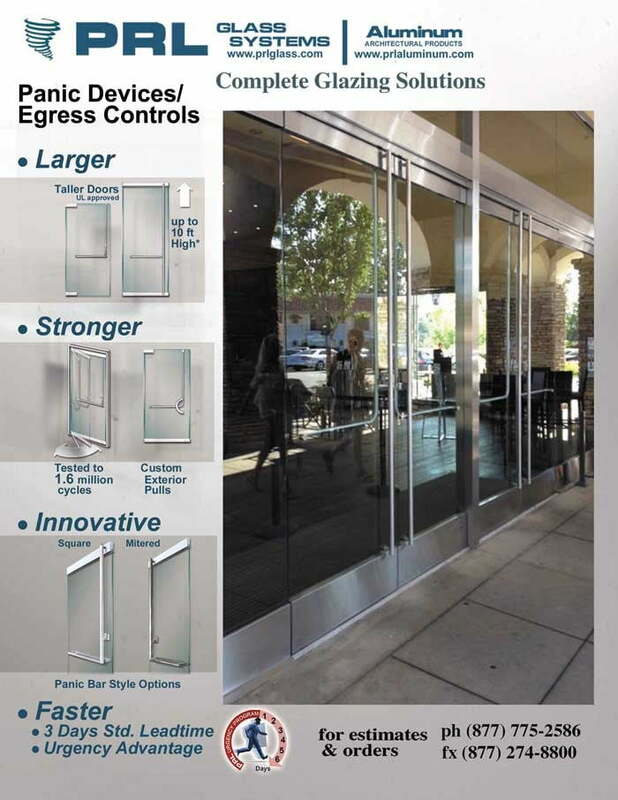 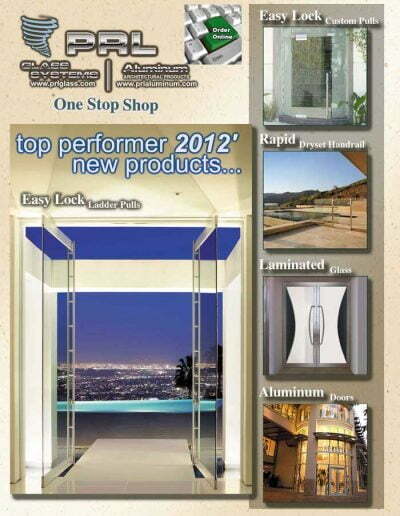 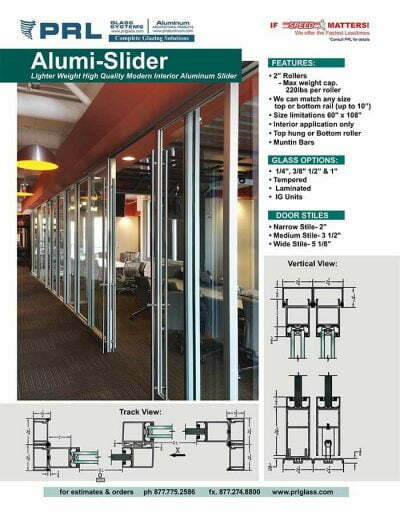 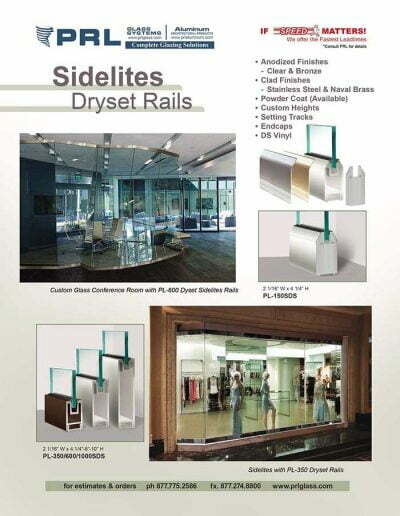 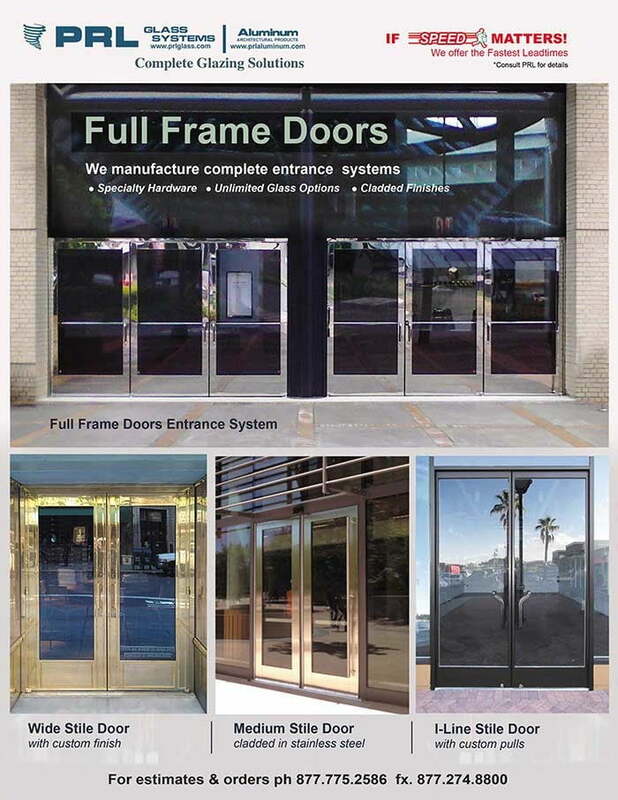 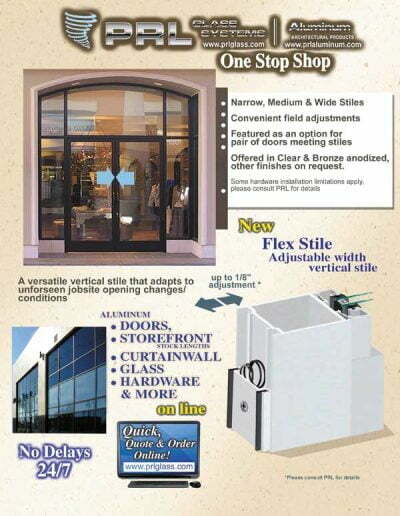 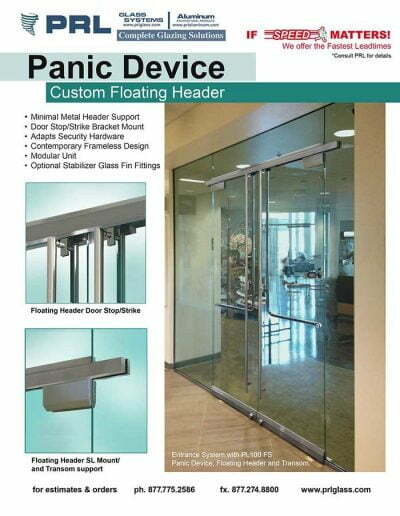 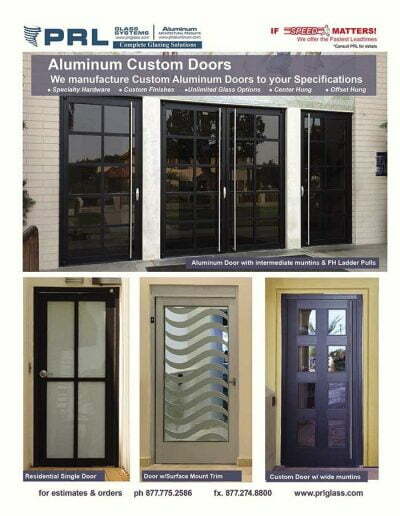 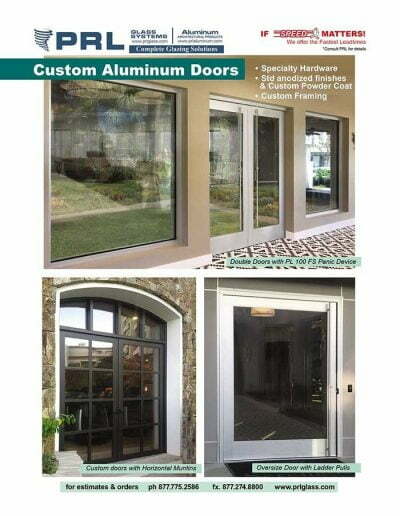 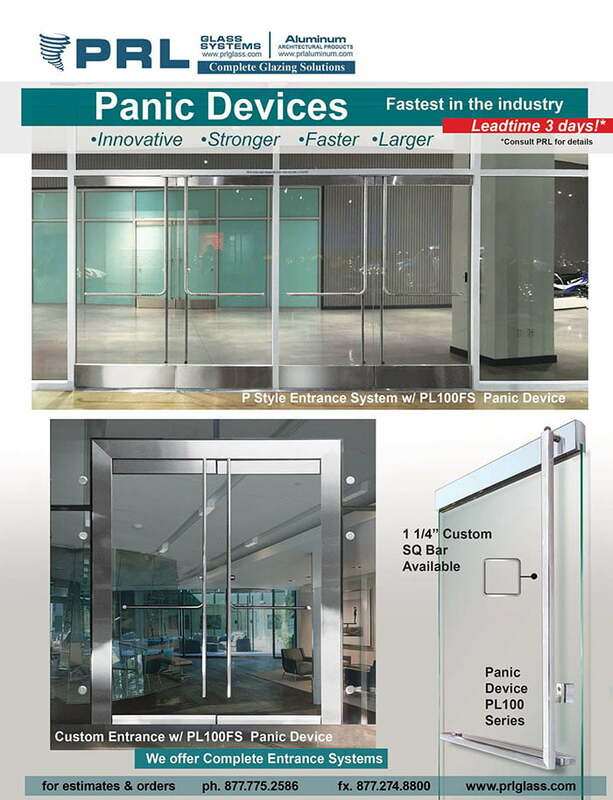 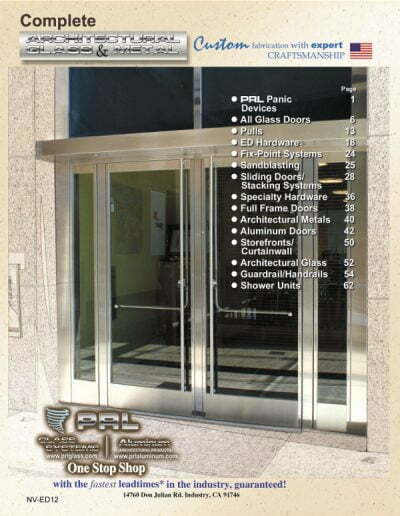 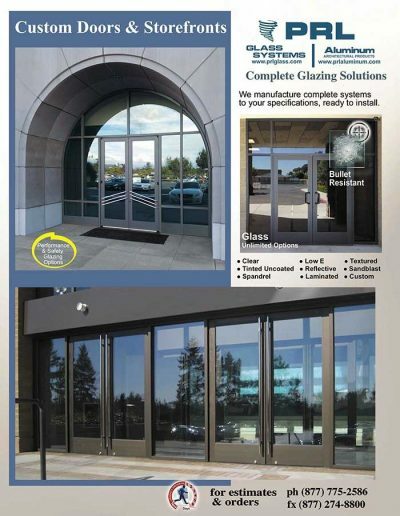 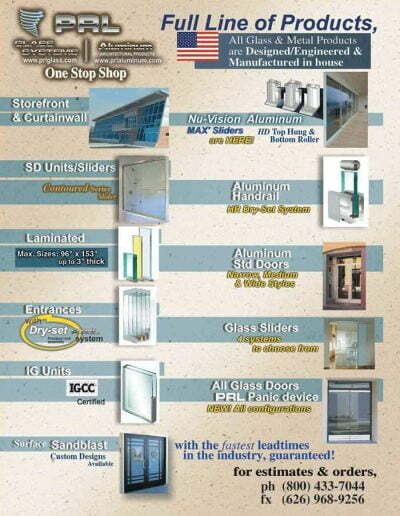 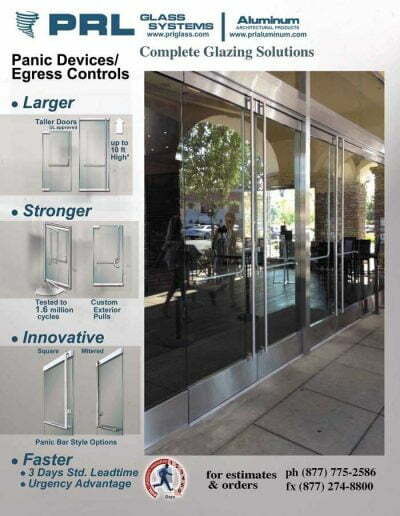 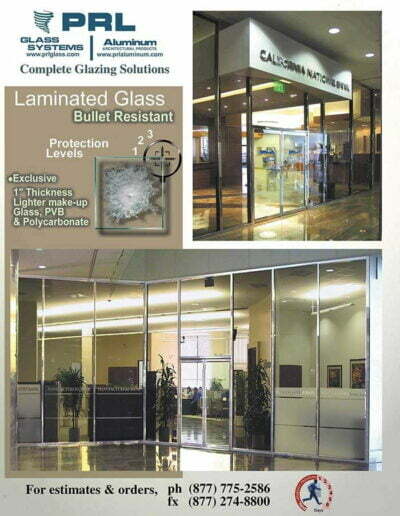 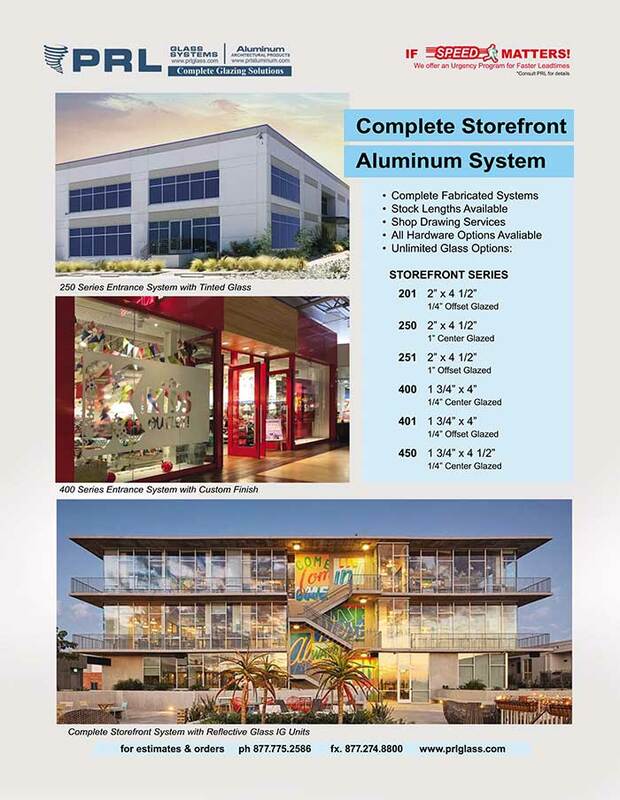 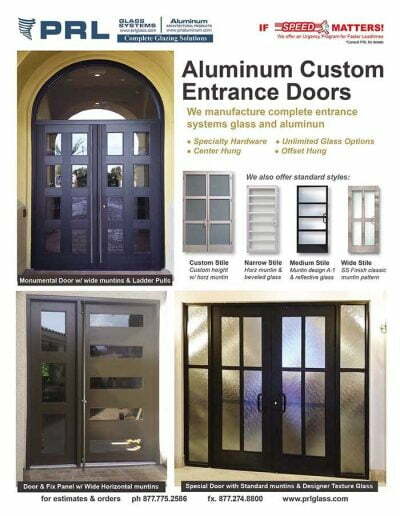 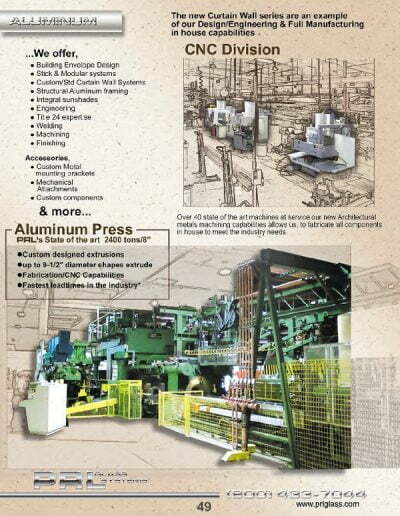 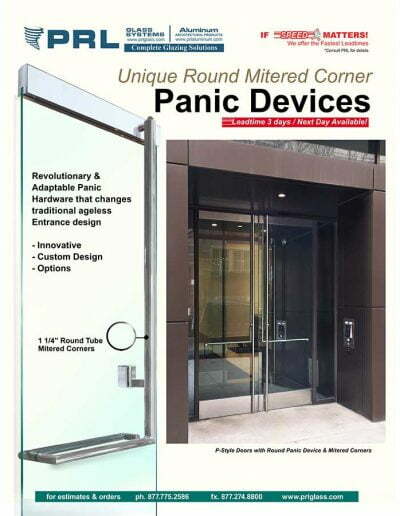 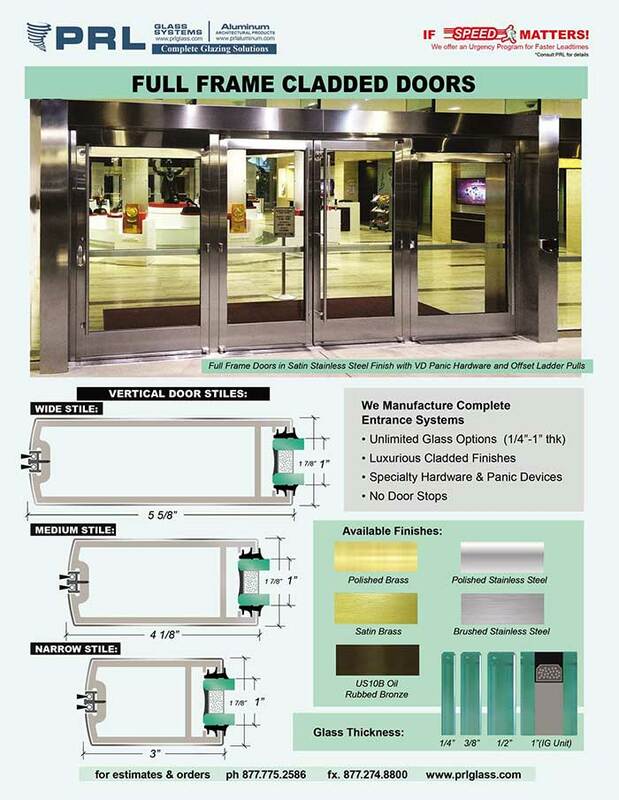 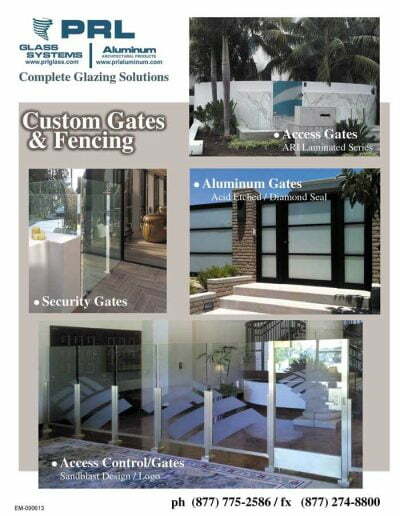 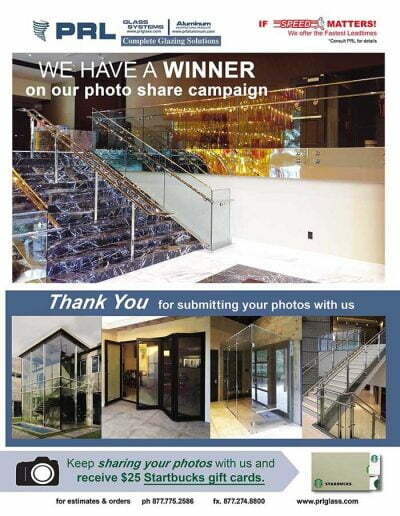 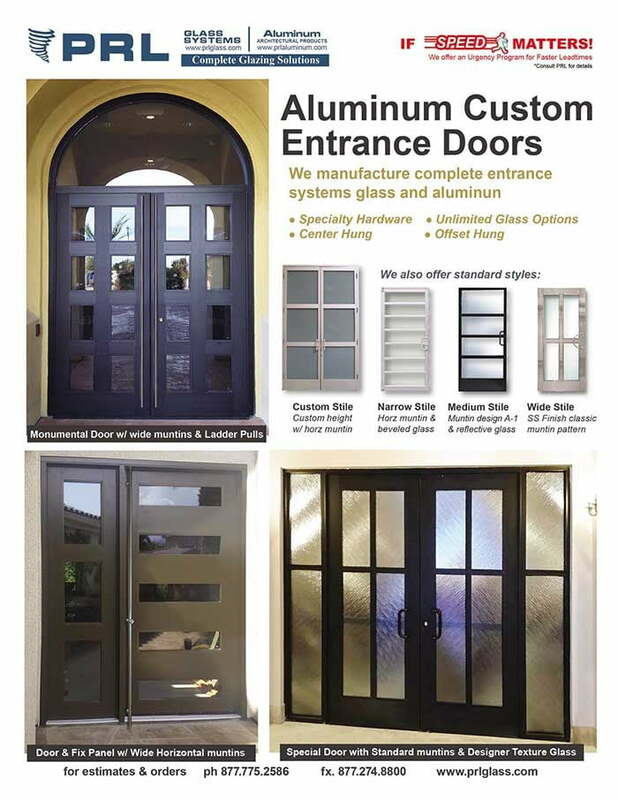 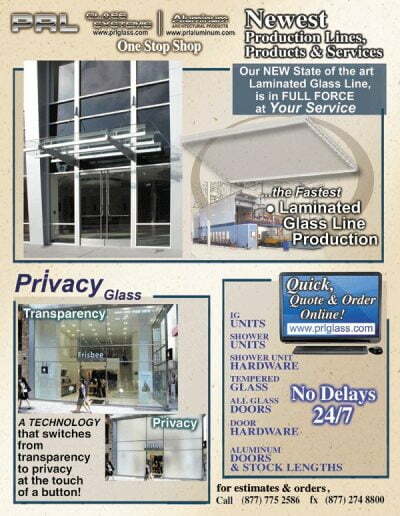 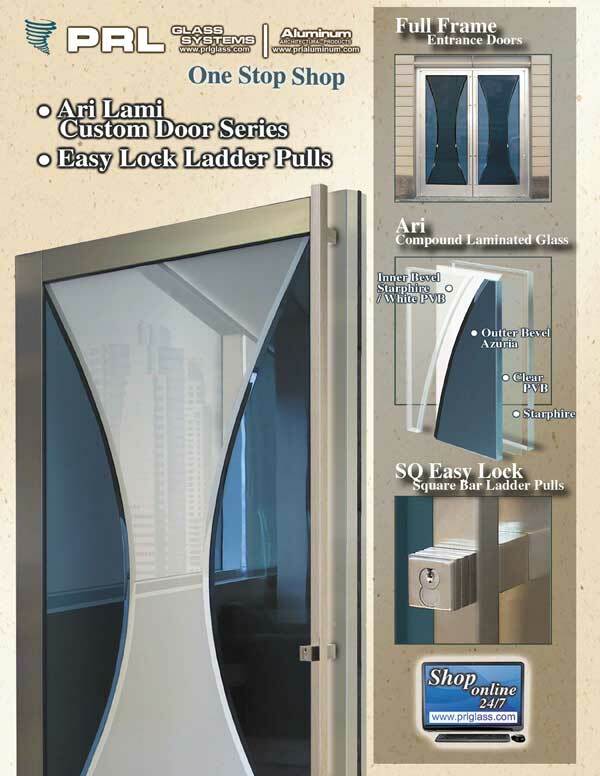 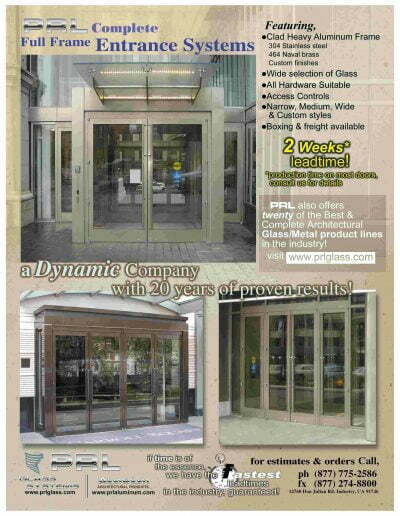 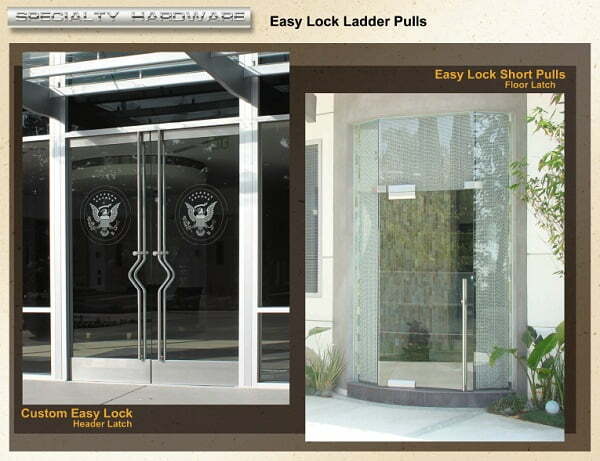 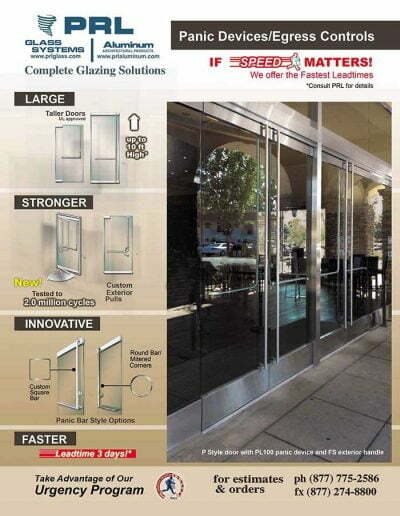 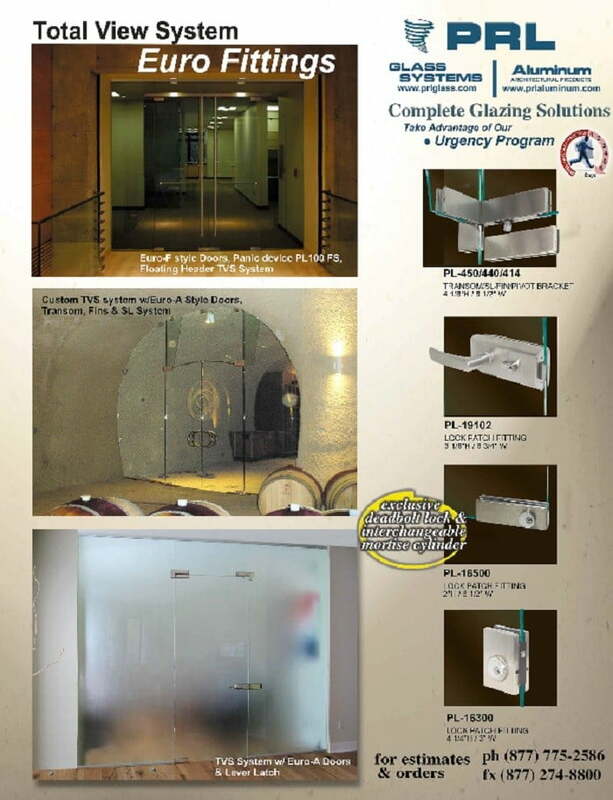 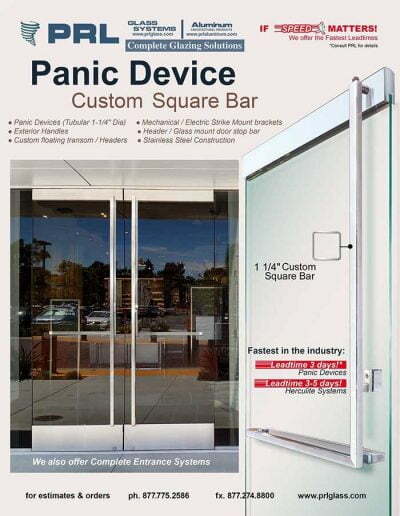 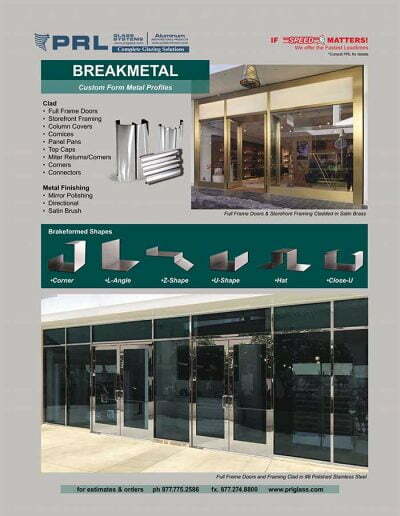 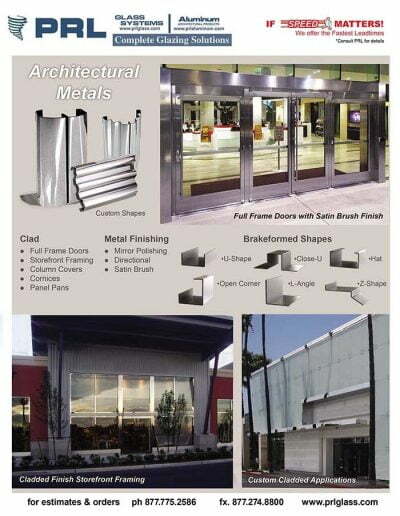 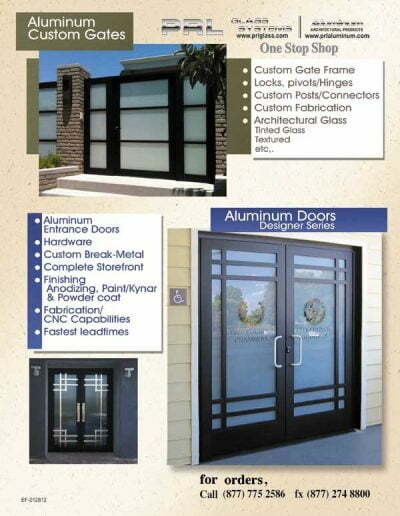 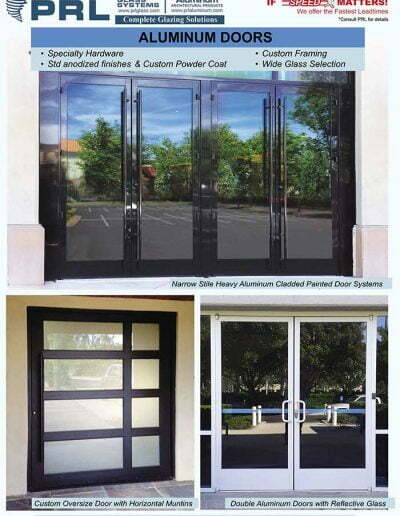 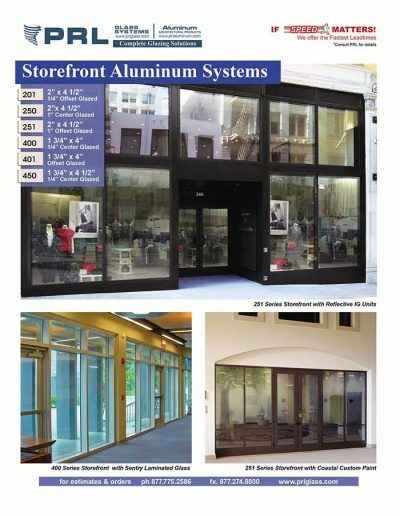 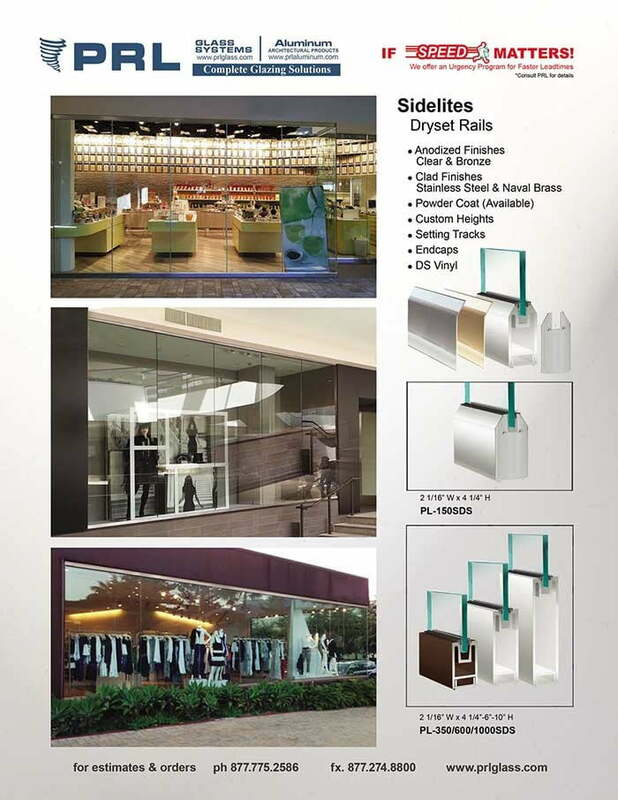 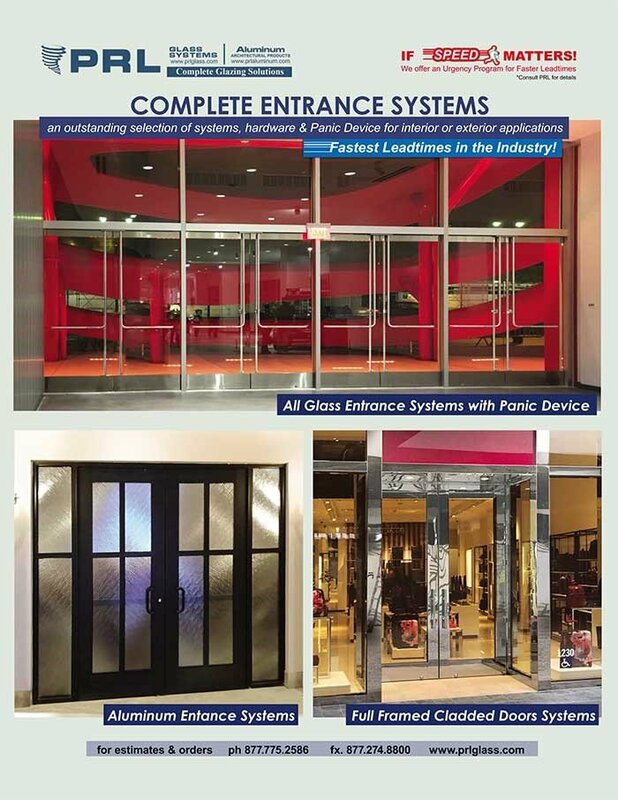 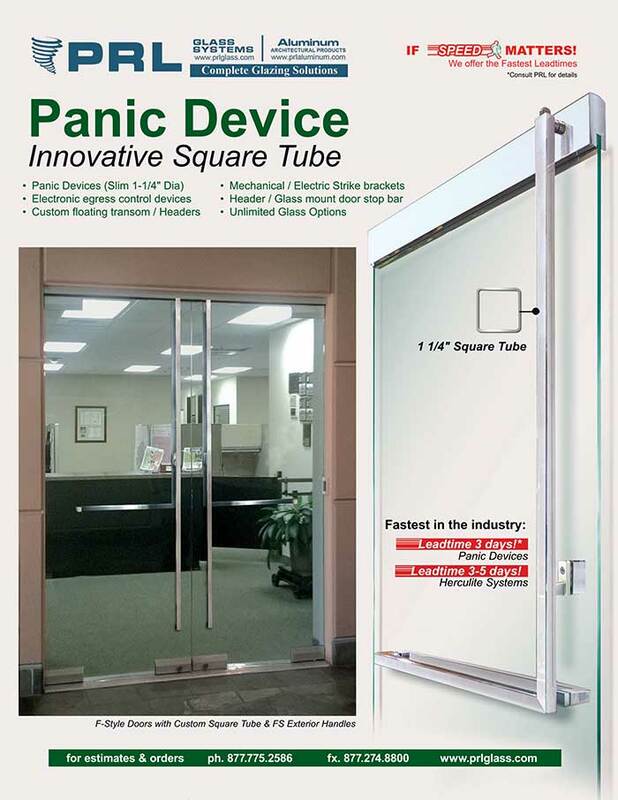 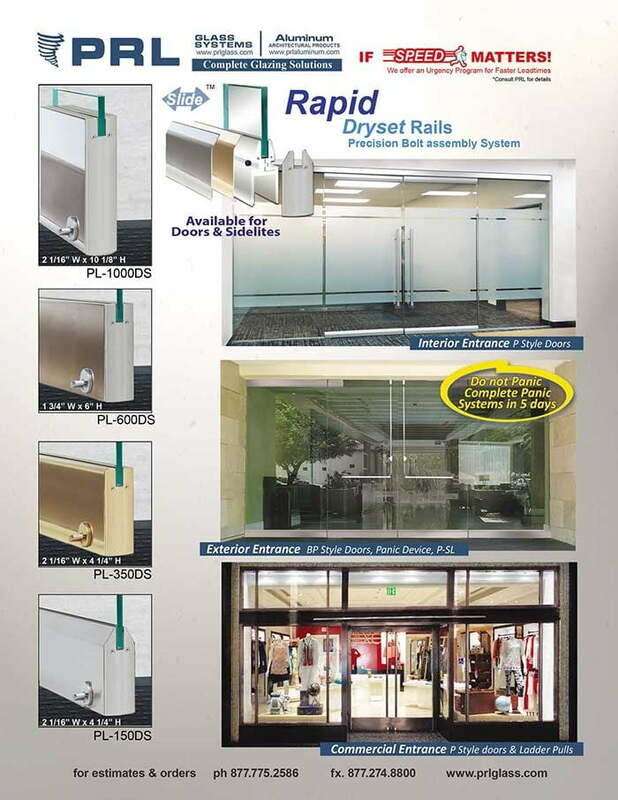 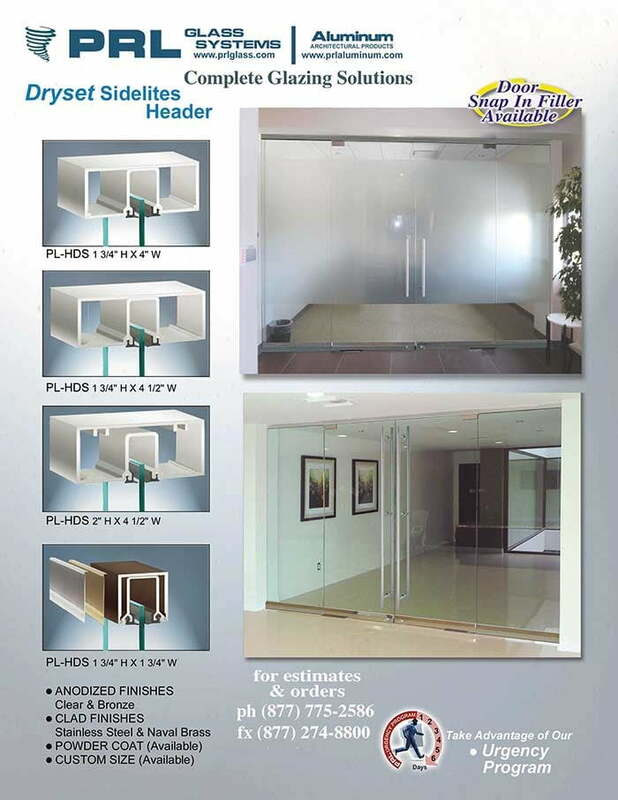 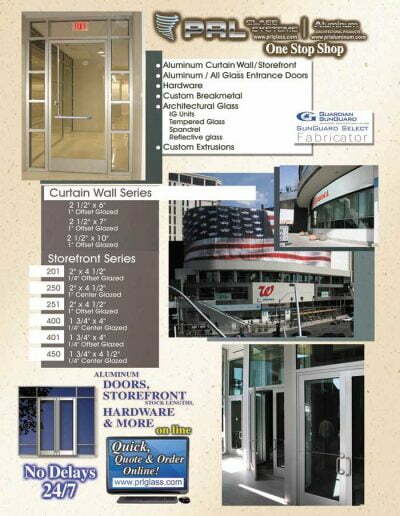 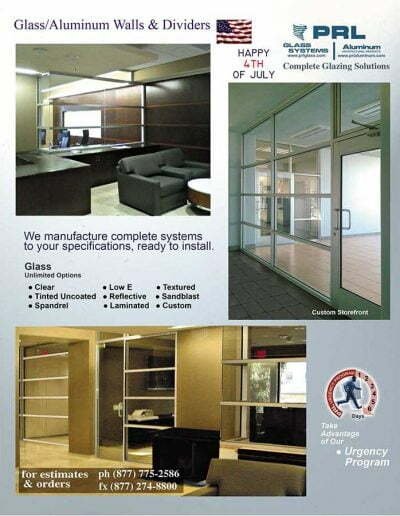 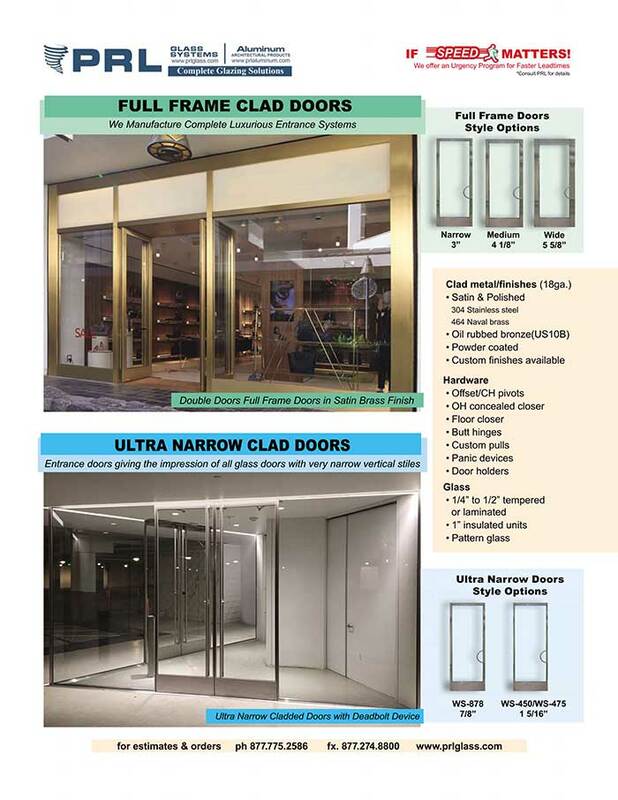 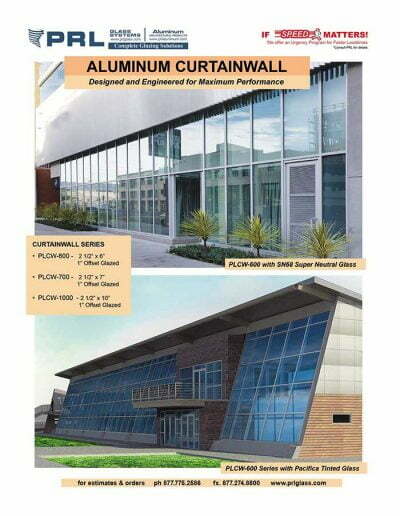 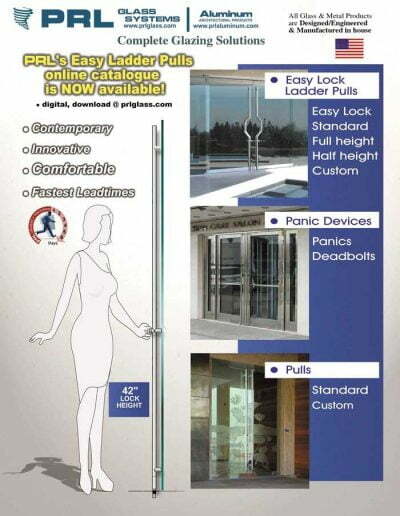 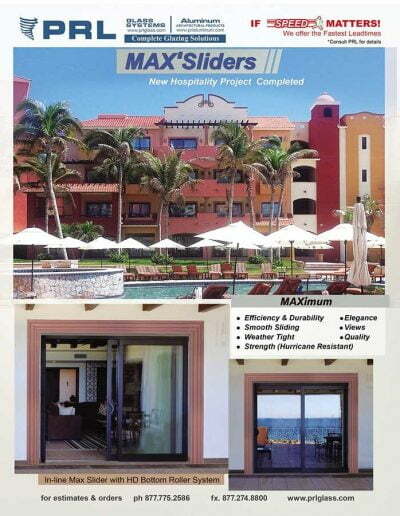 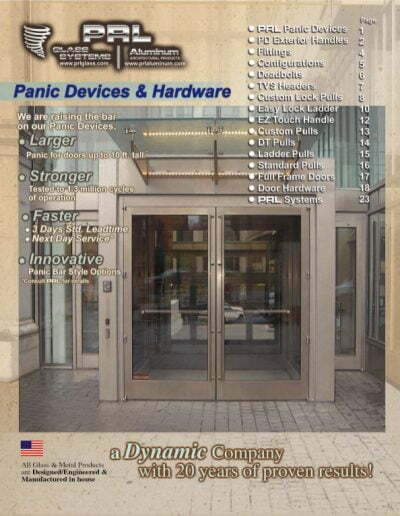 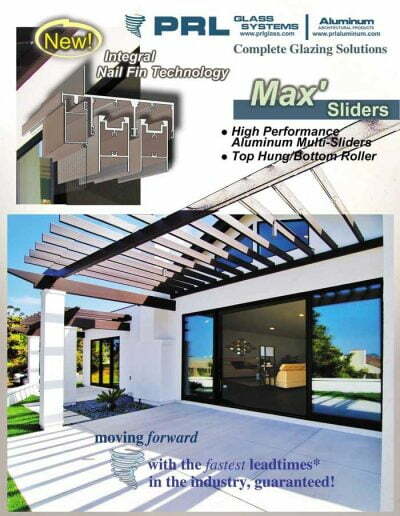 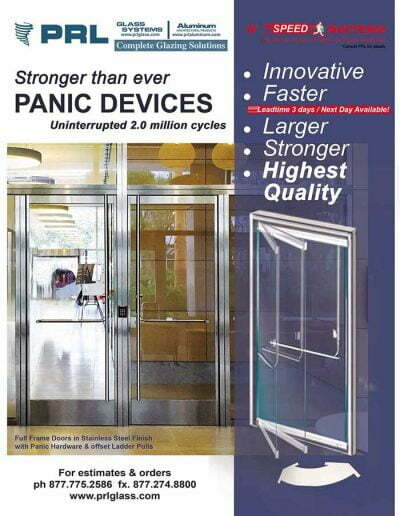 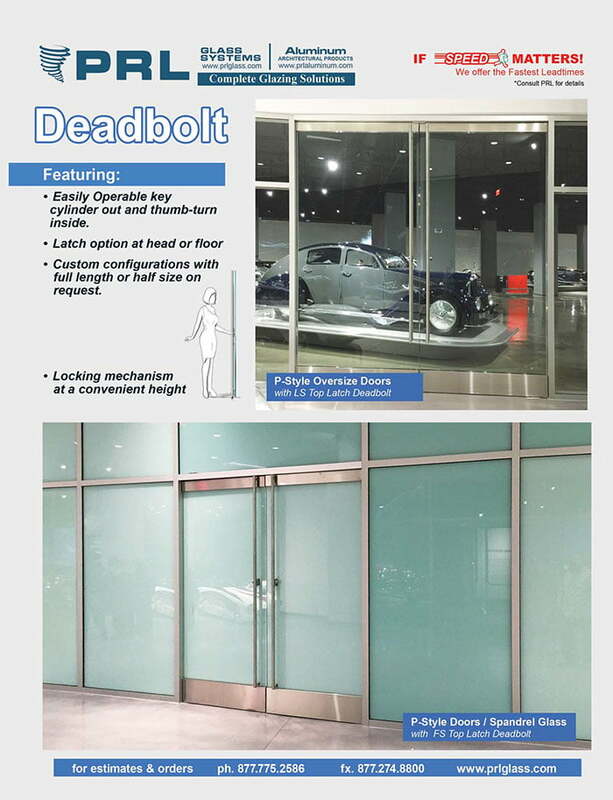 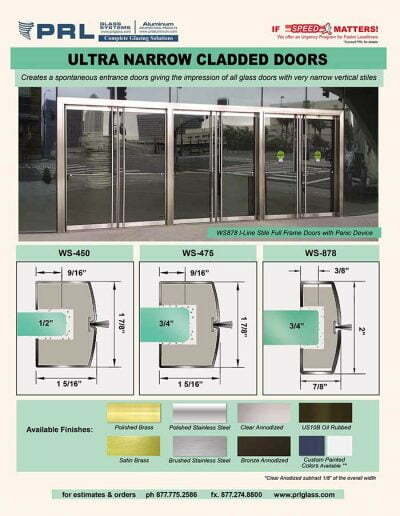 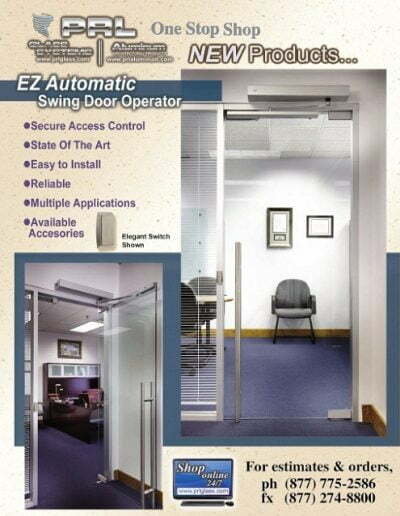 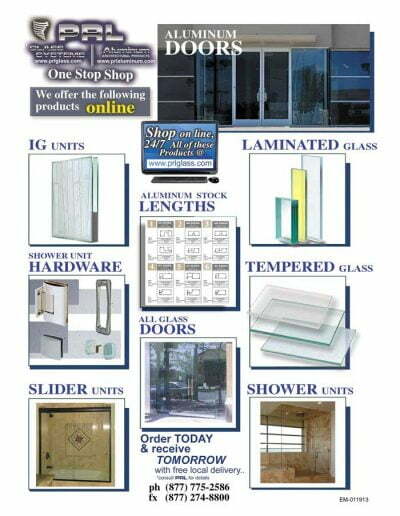 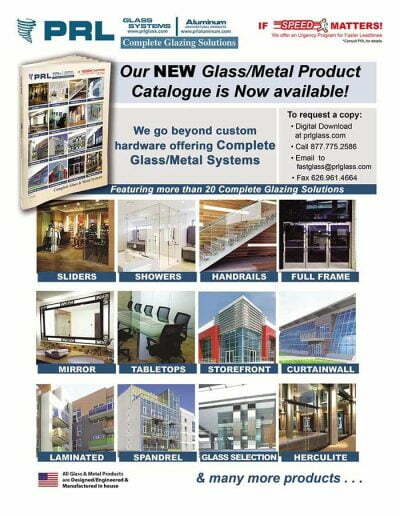 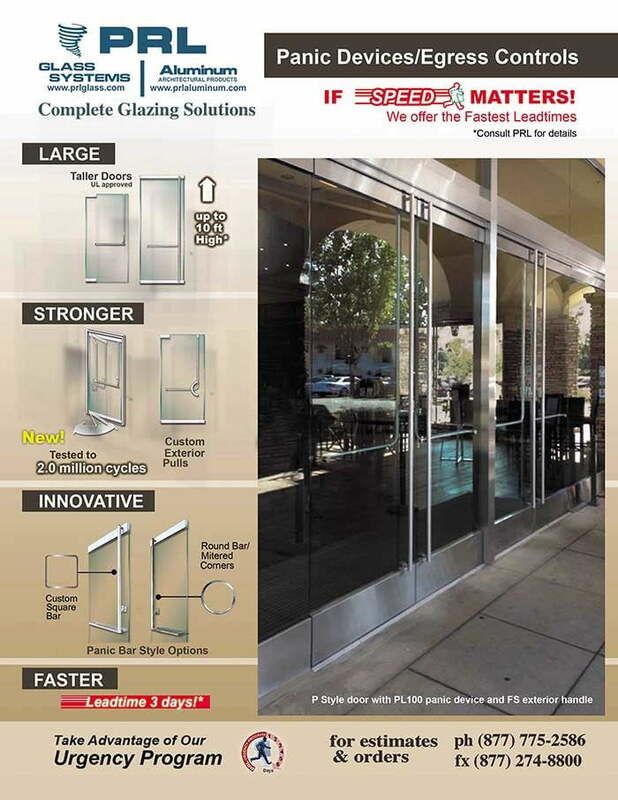 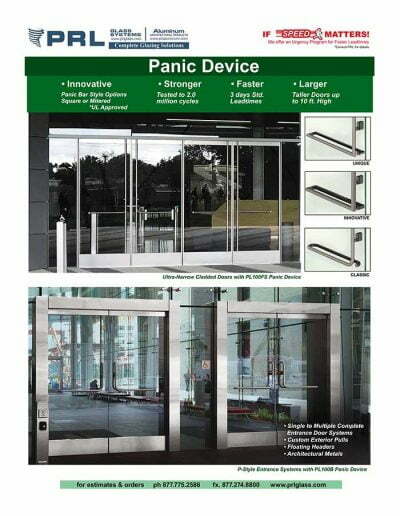 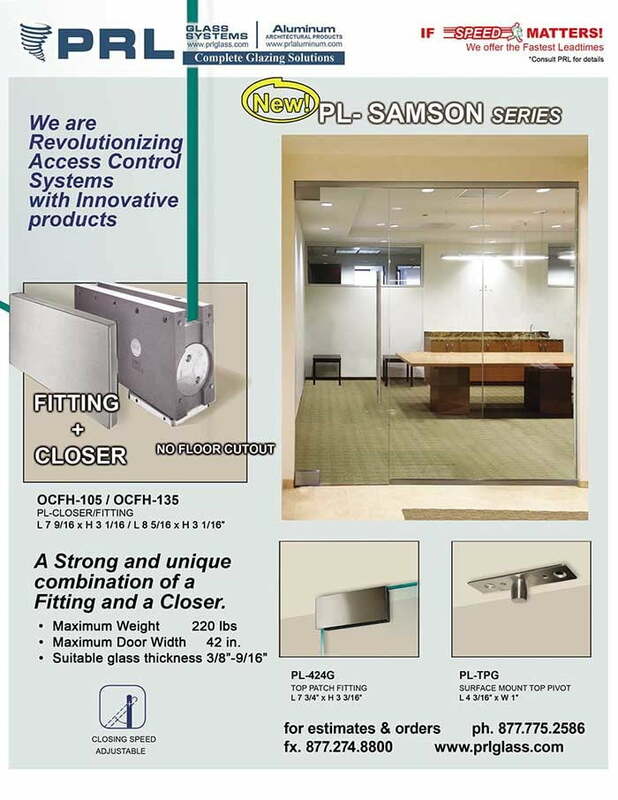 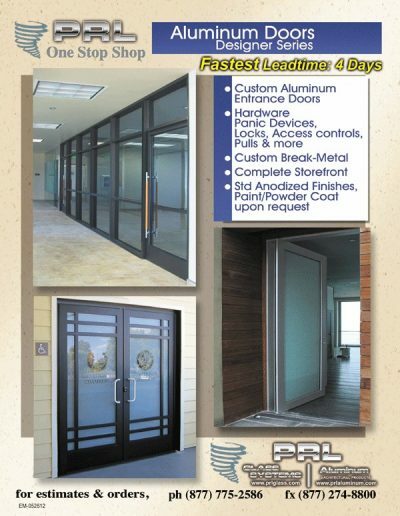 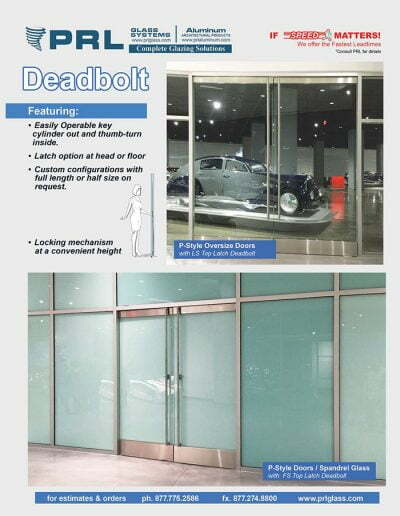 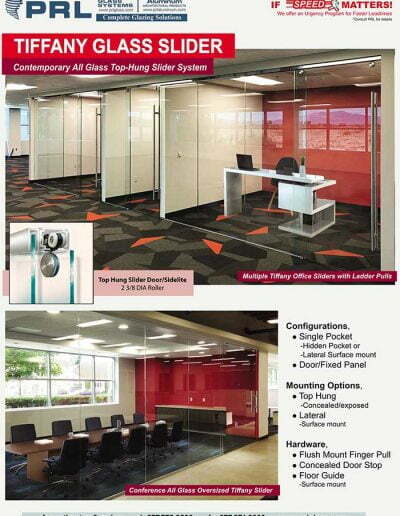 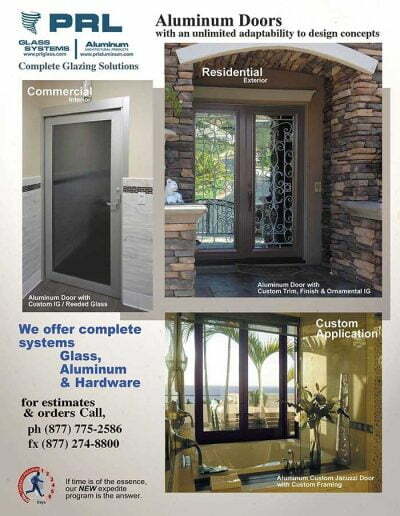 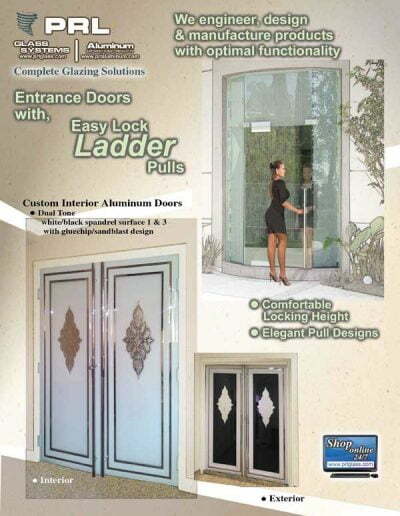 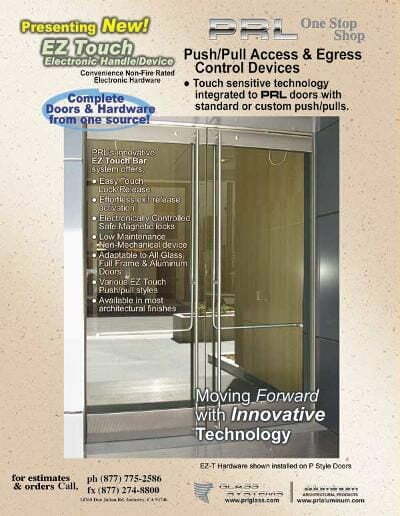 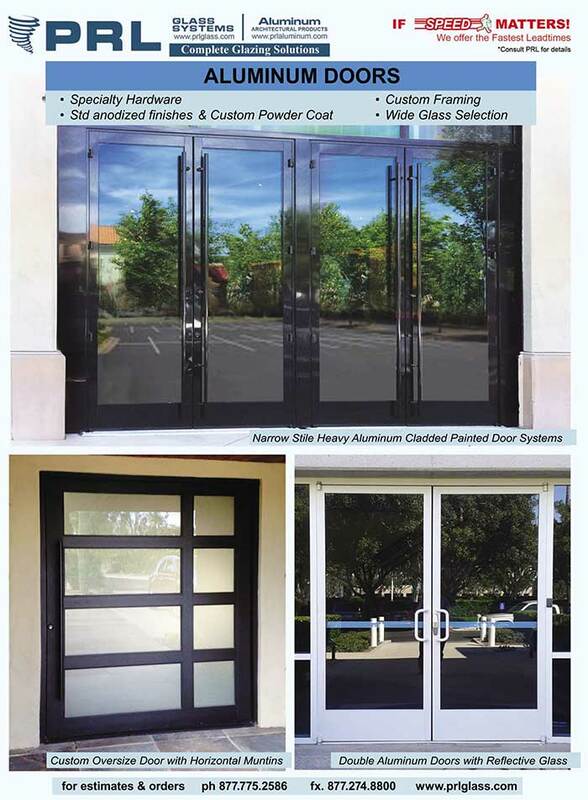 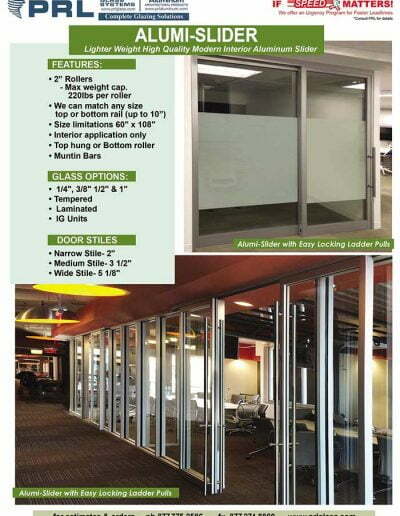 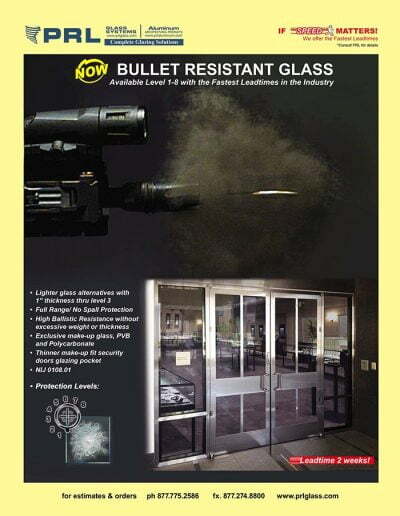 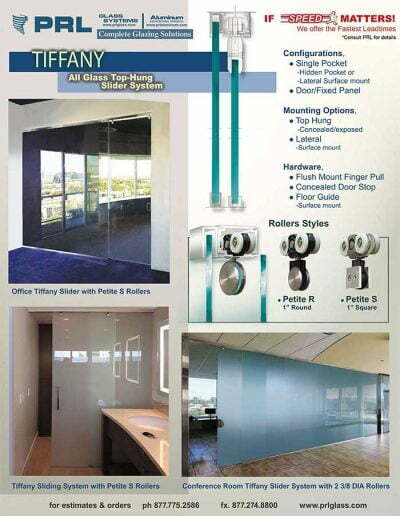 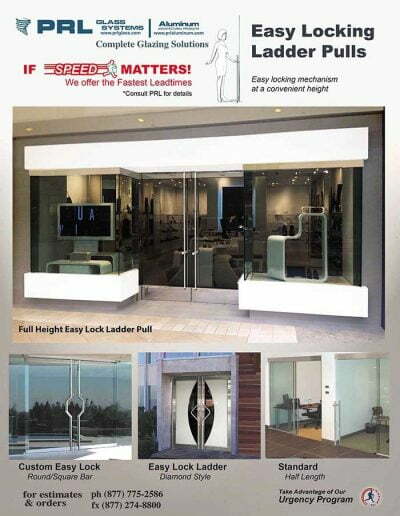 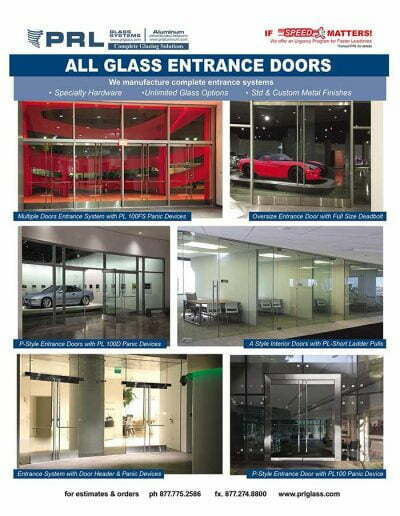 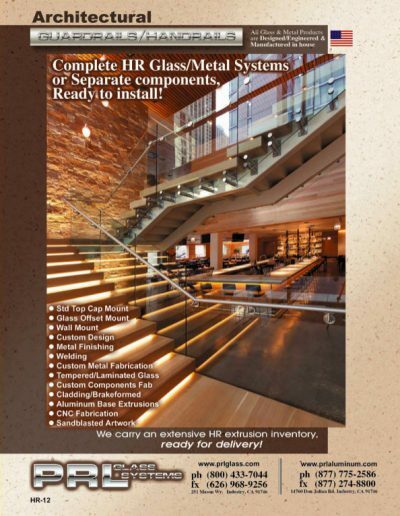 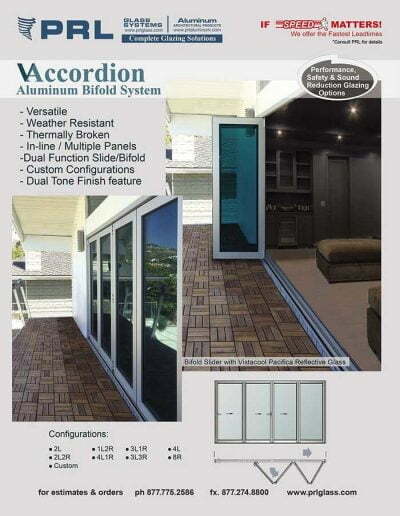 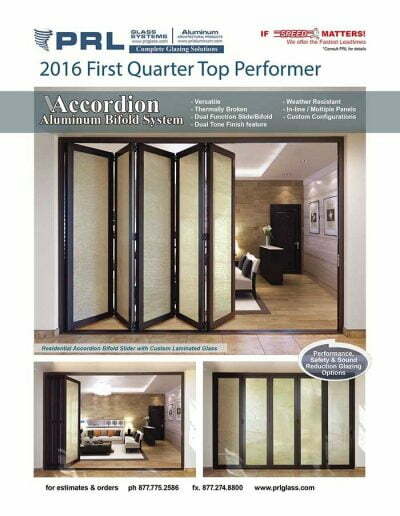 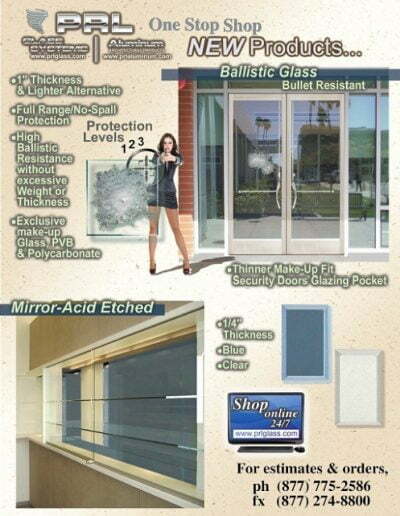 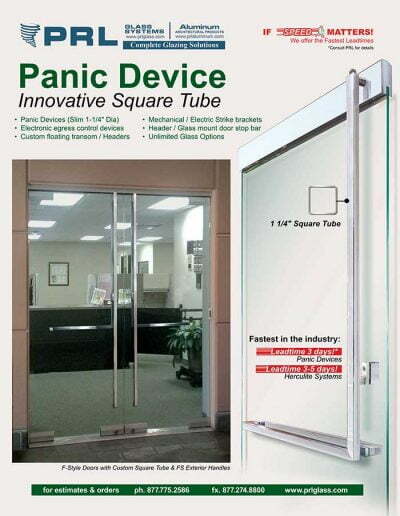 Aluminum Storefront Systems - Manufacturing Doors and Storefronts. 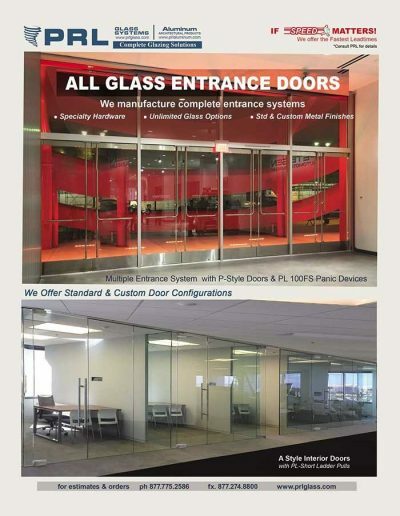 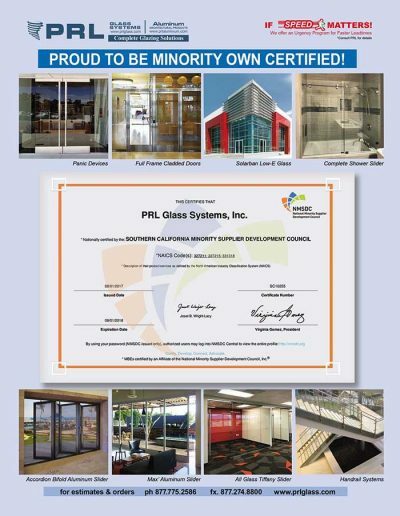 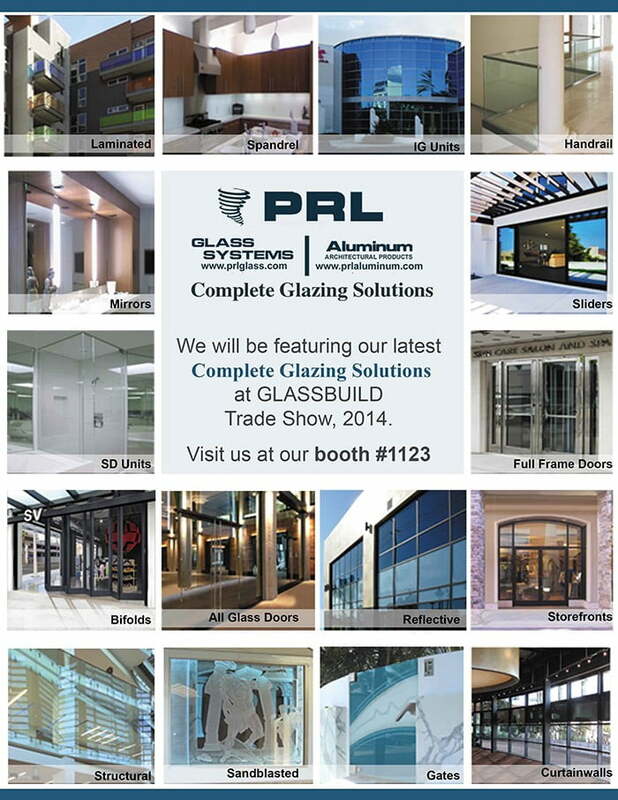 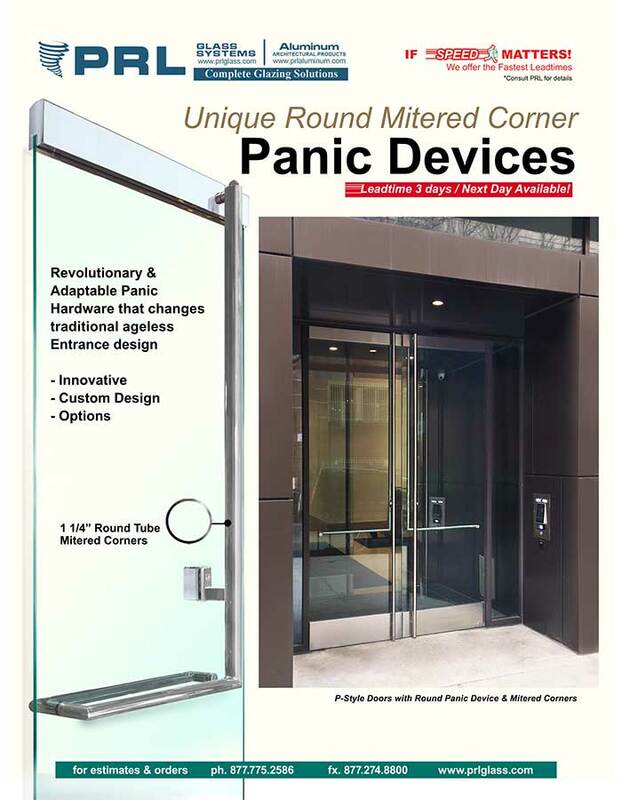 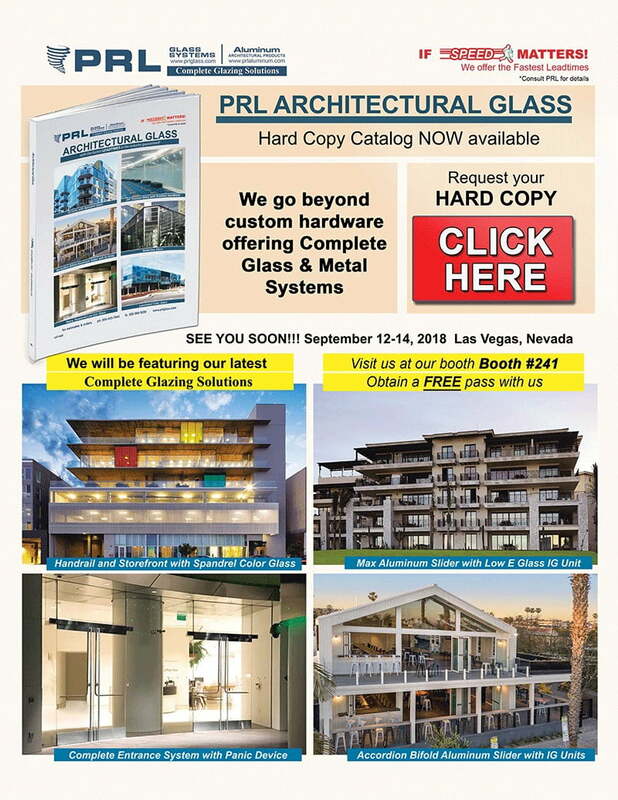 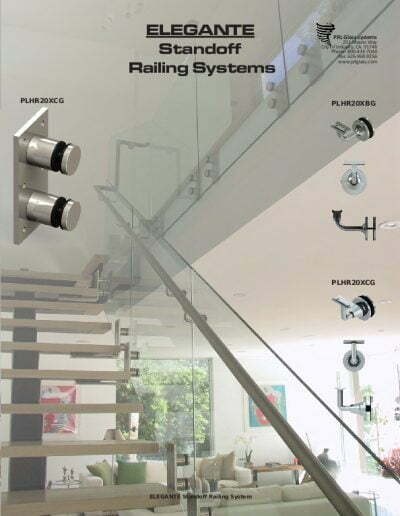 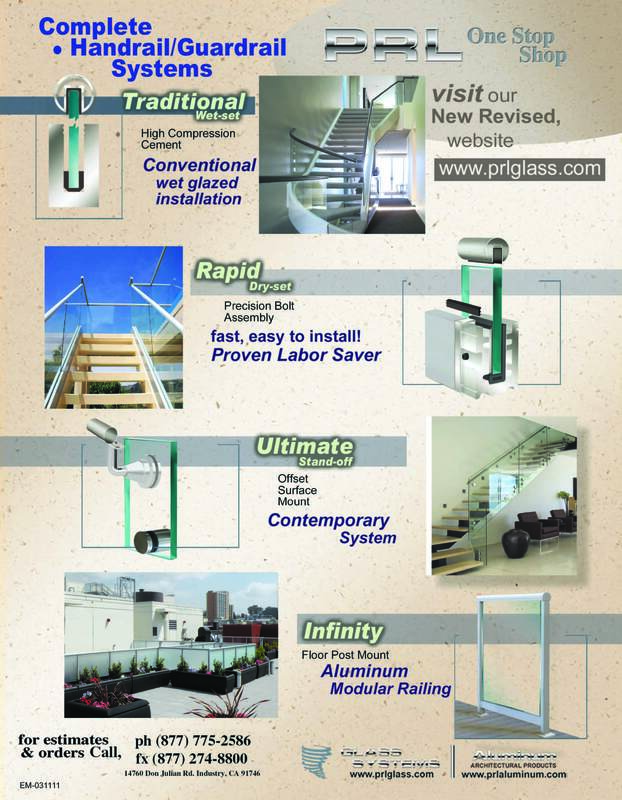 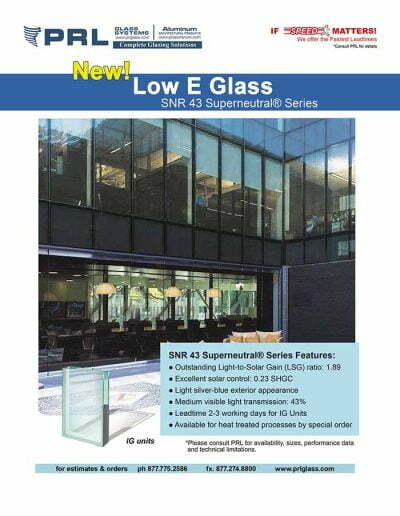 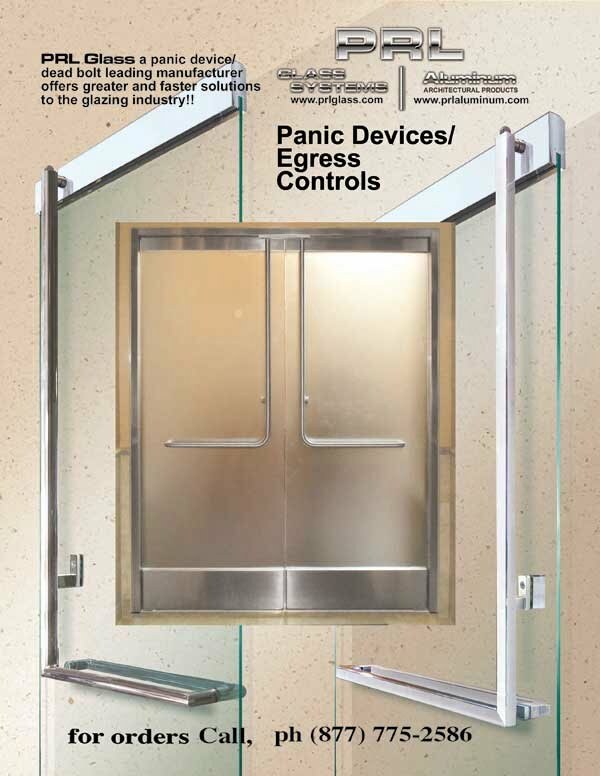 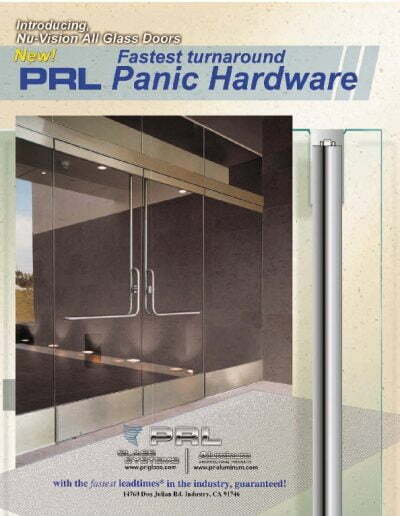 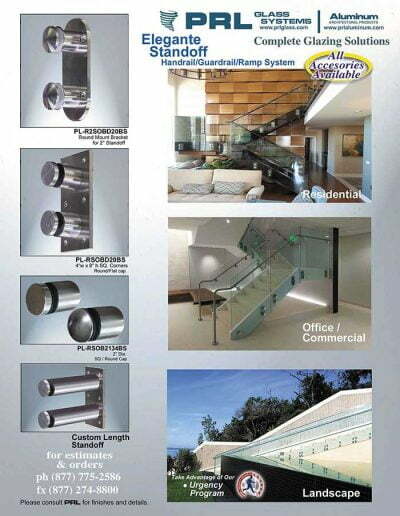 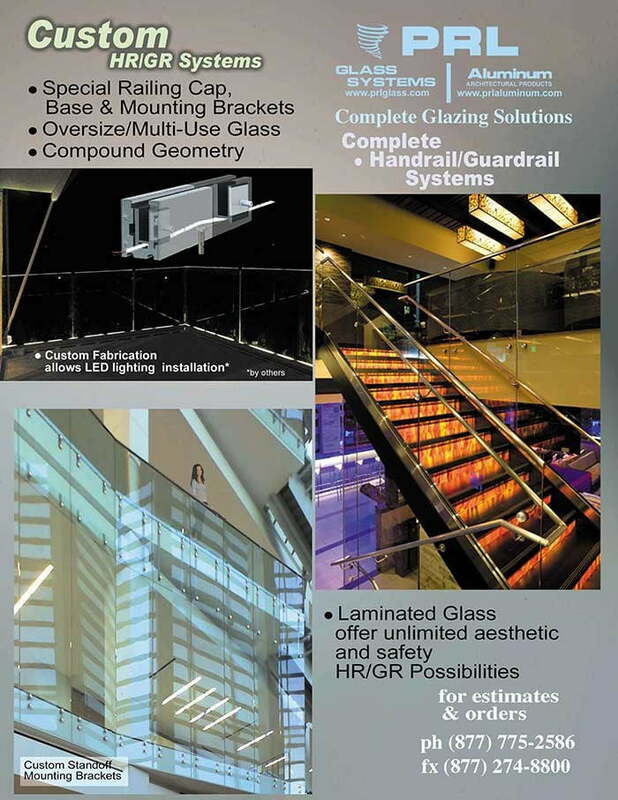 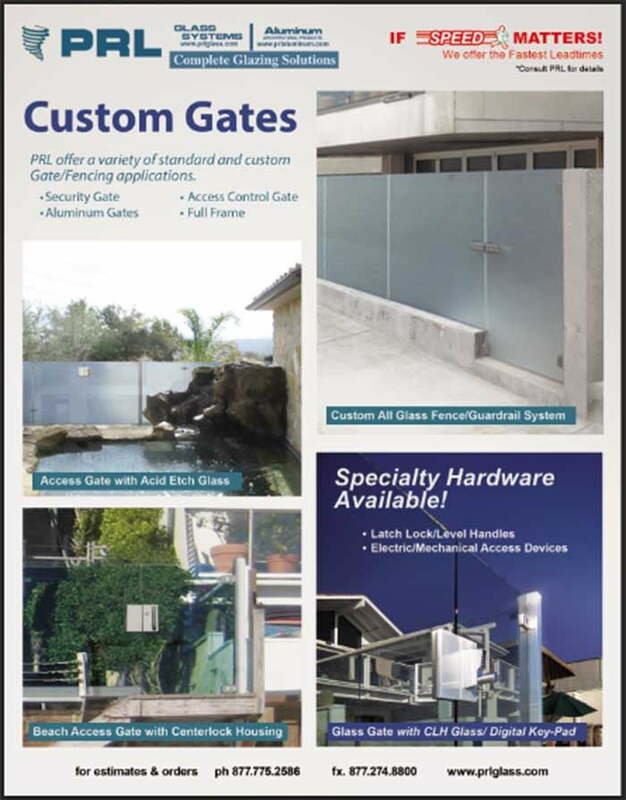 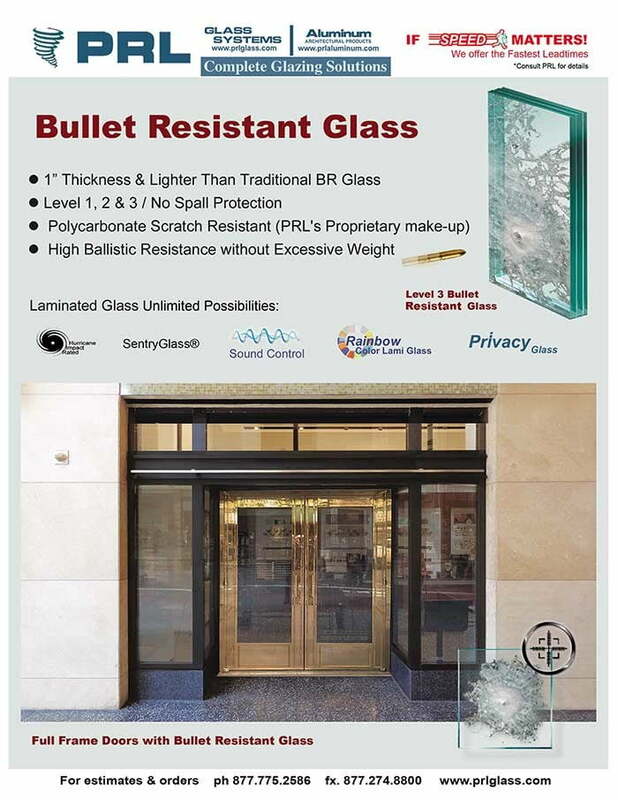 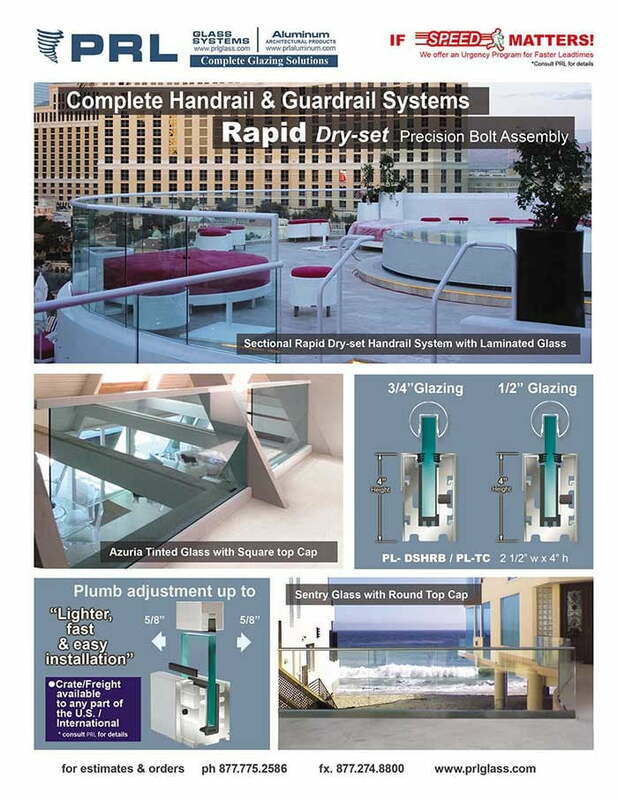 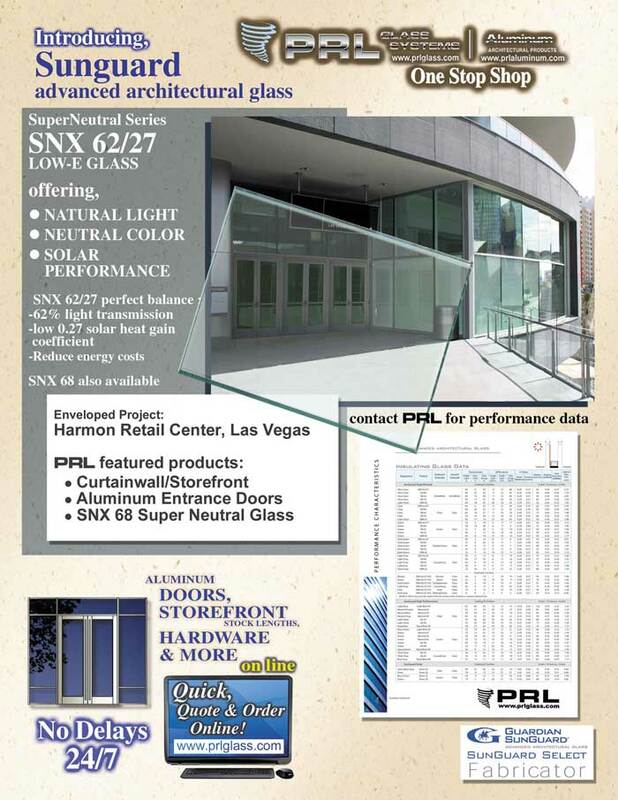 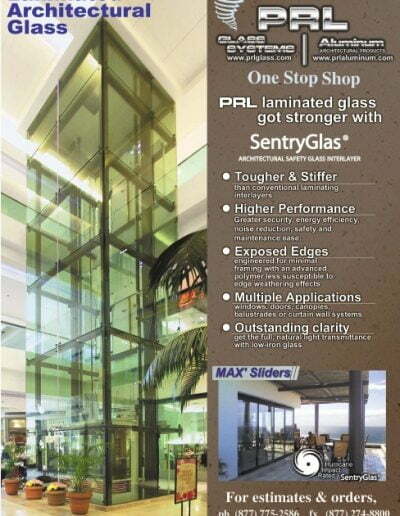 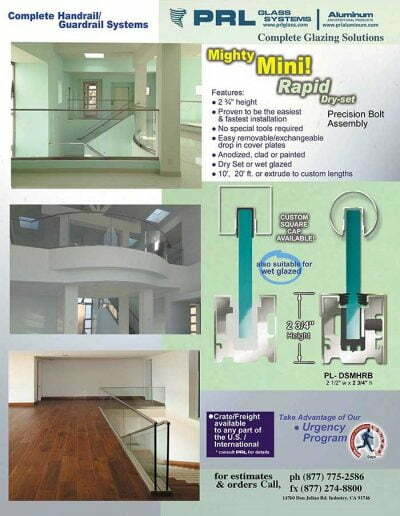 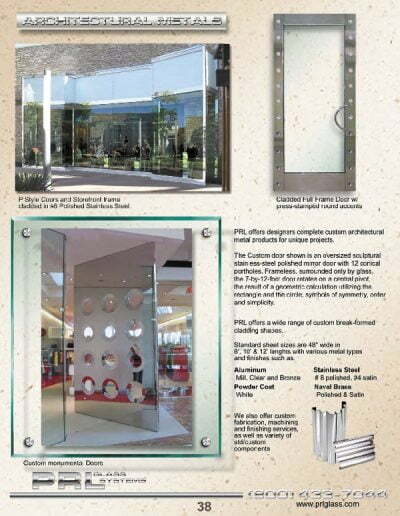 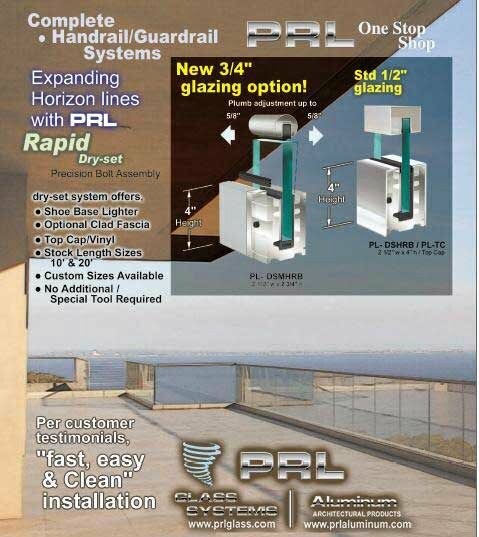 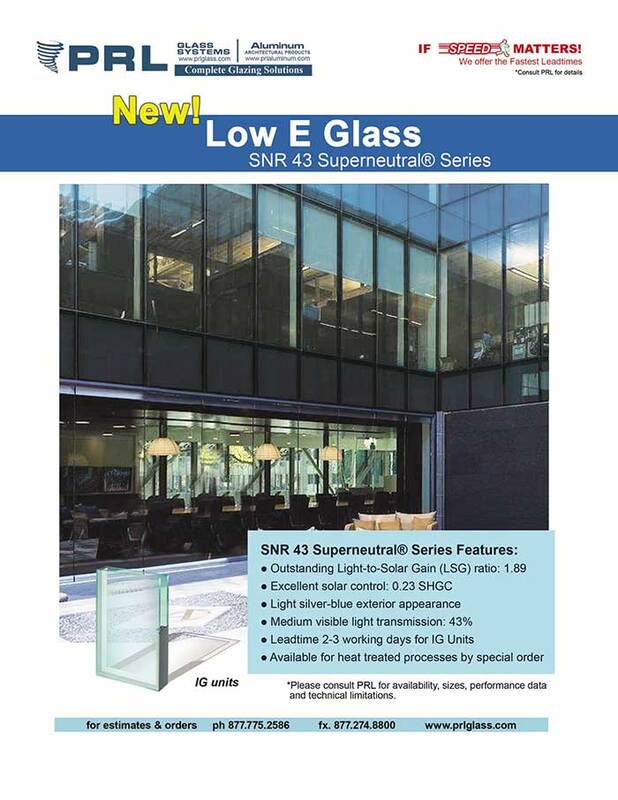 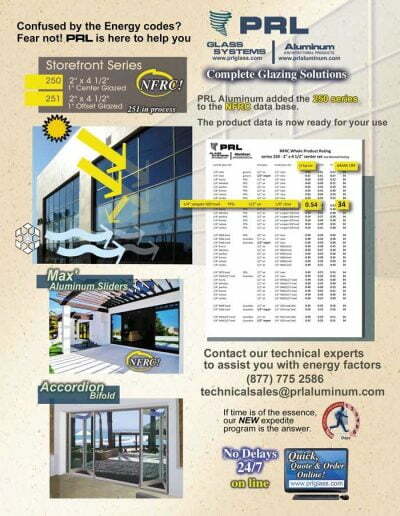 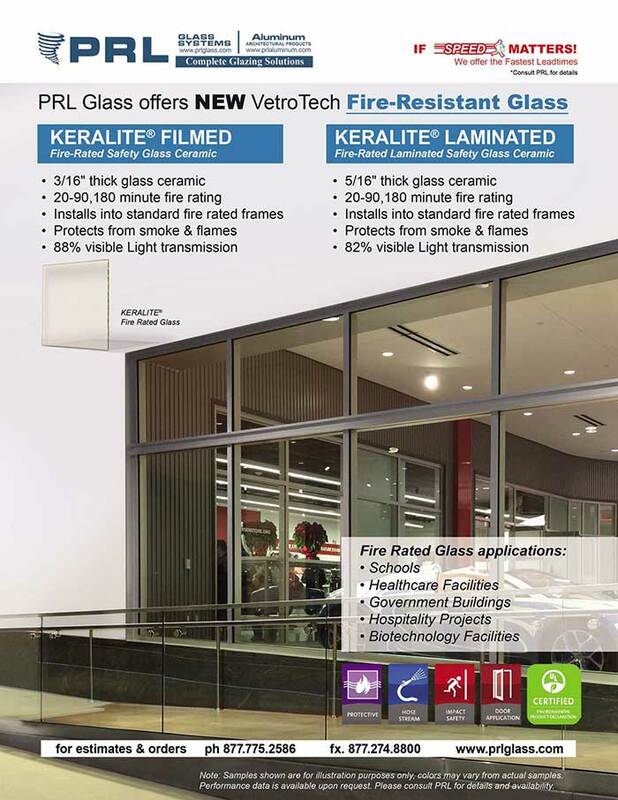 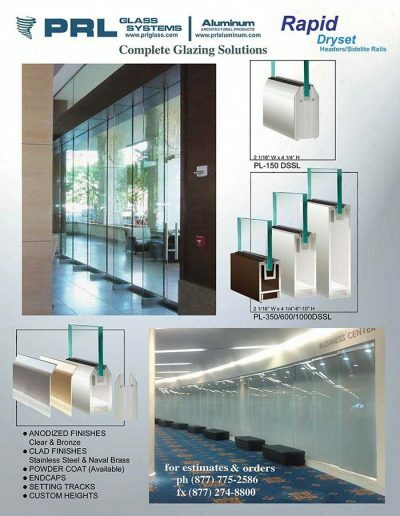 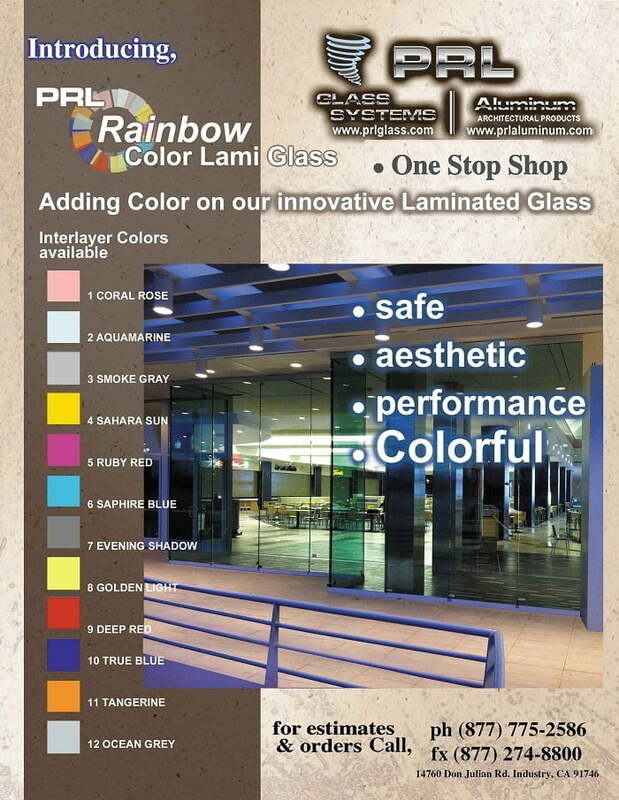 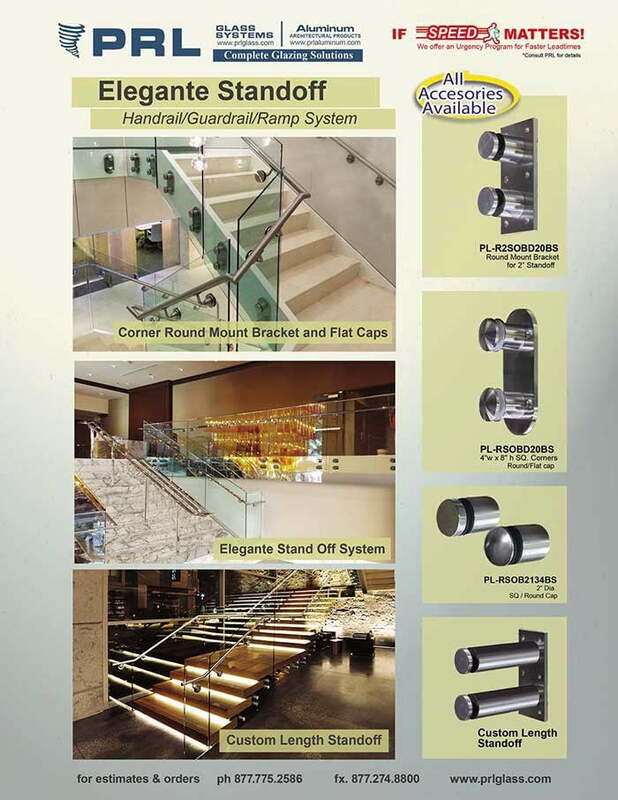 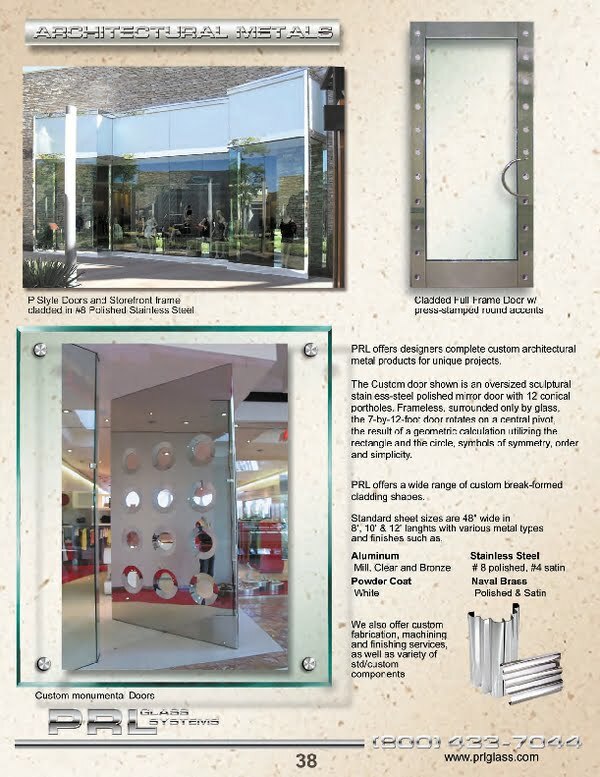 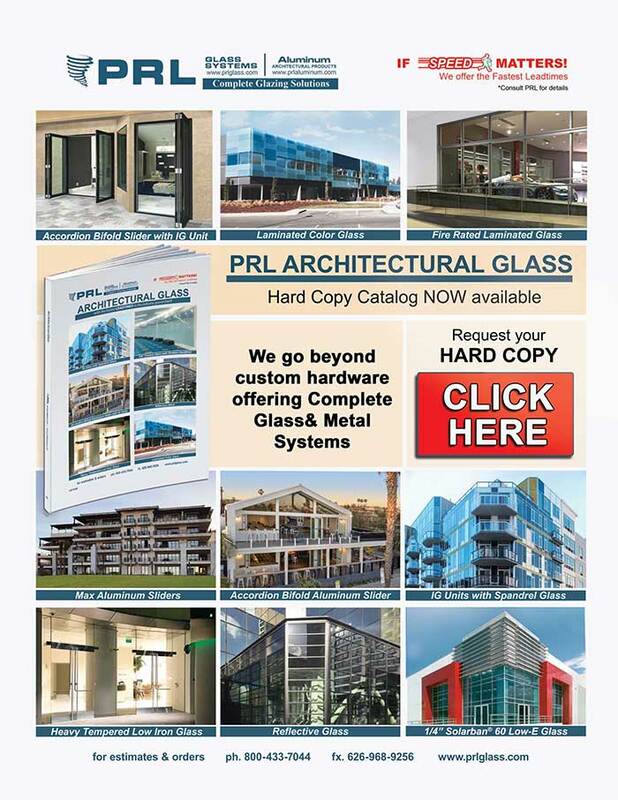 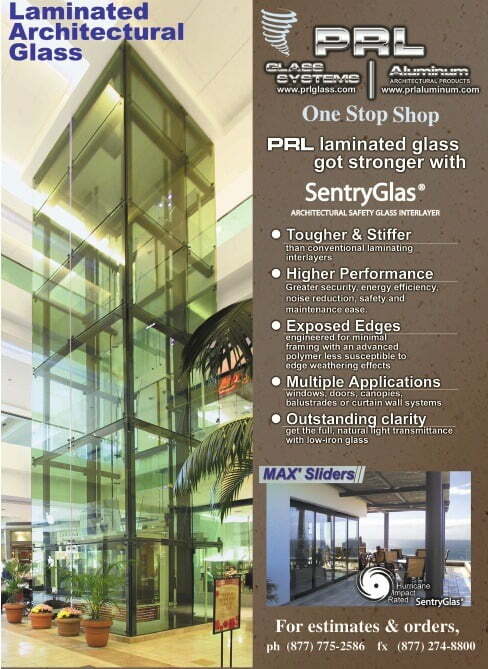 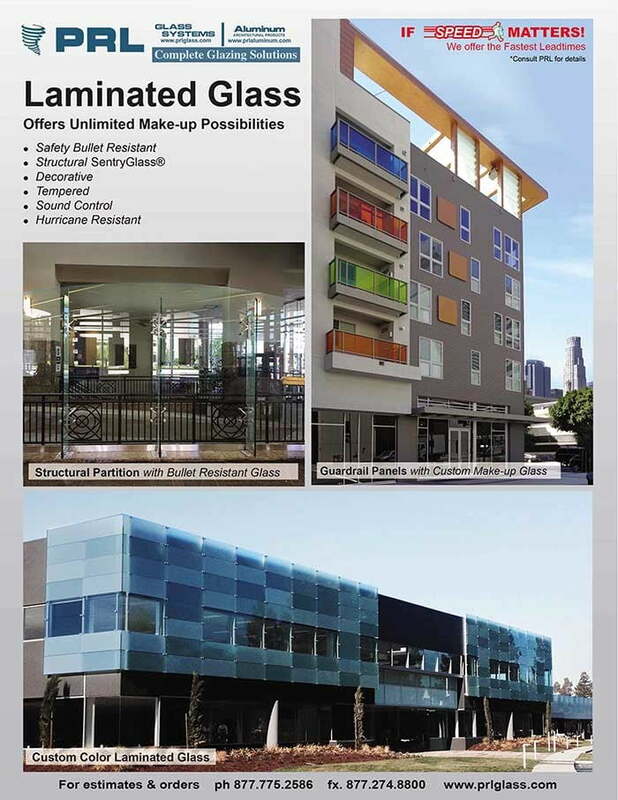 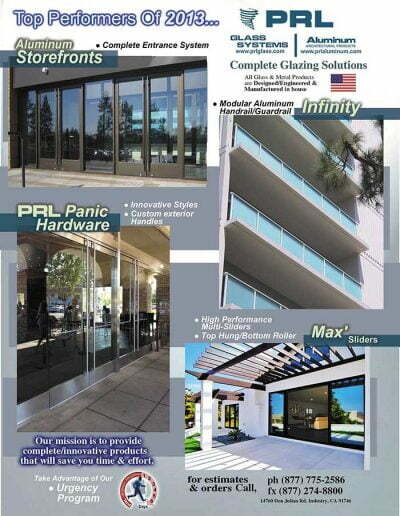 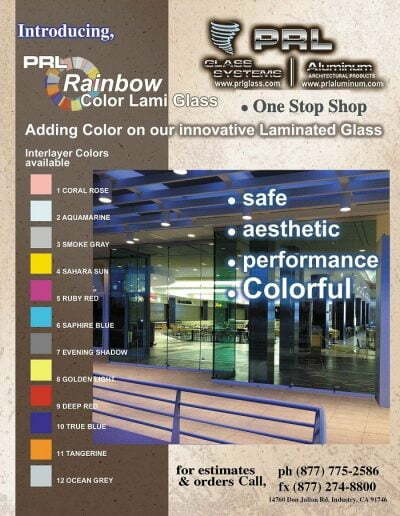 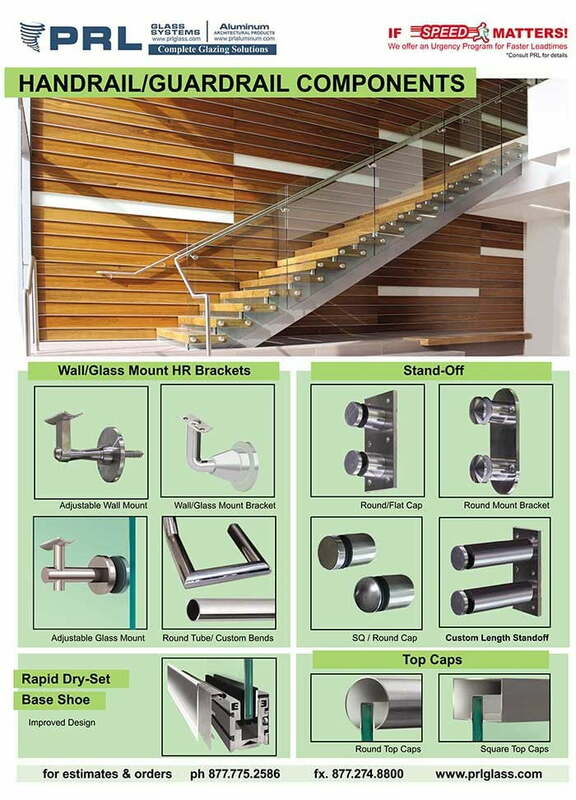 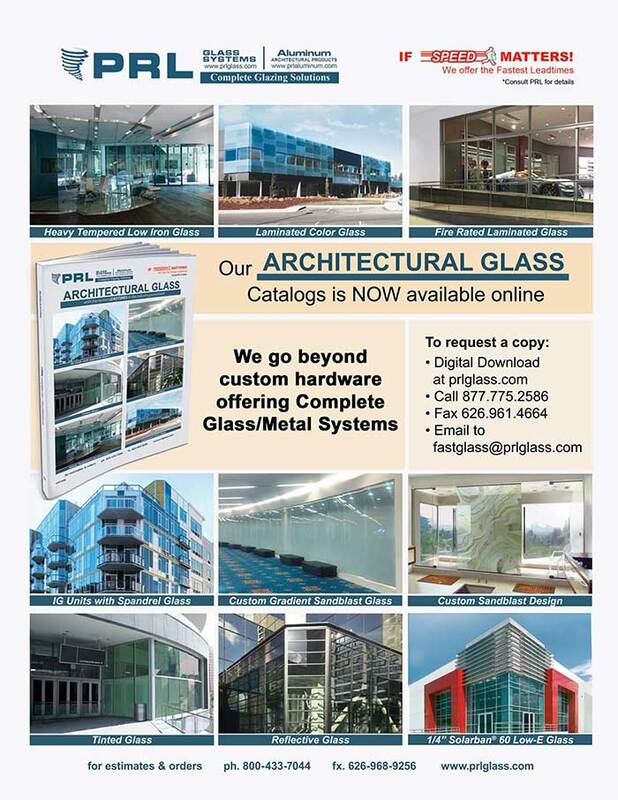 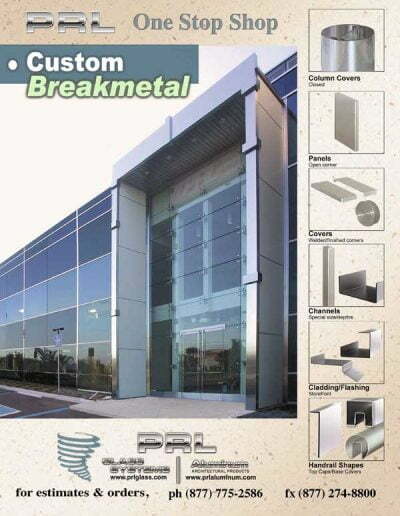 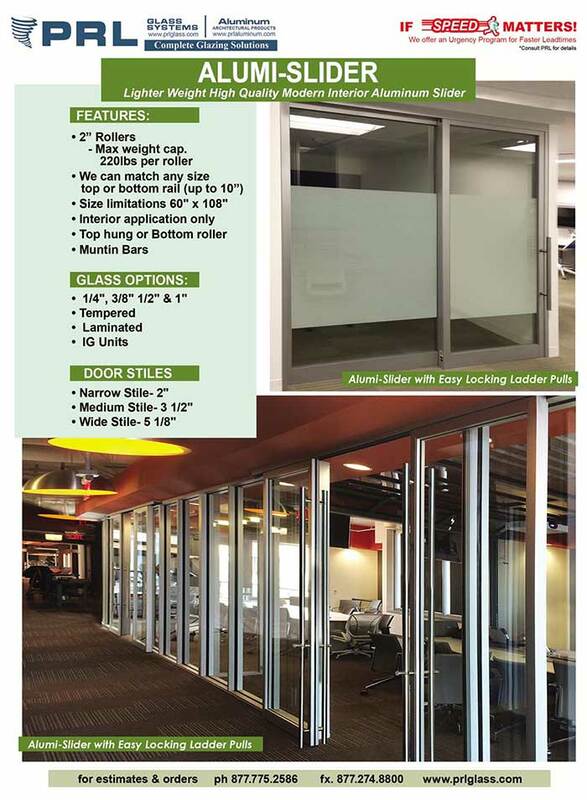 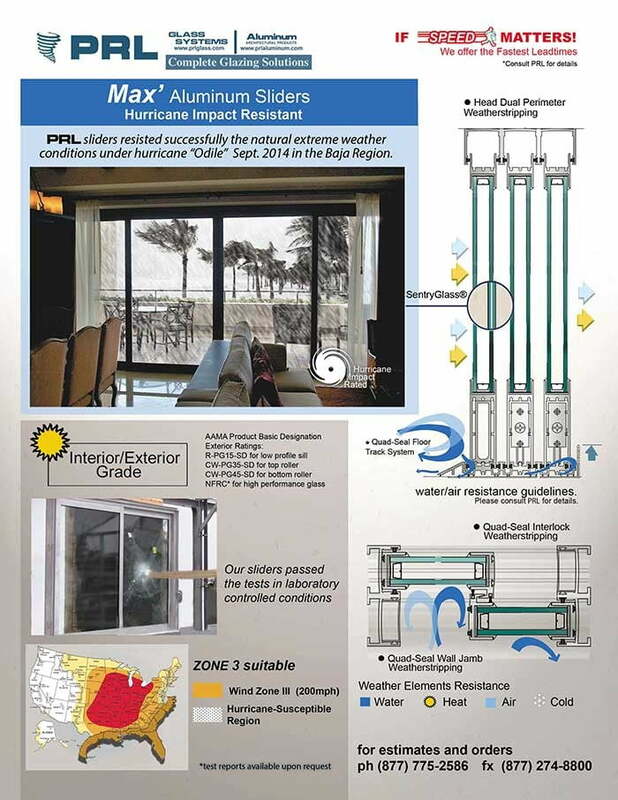 PRL offers complete aluminum storefront systems as well as architectural glass curtain wall systems and structural hardware. 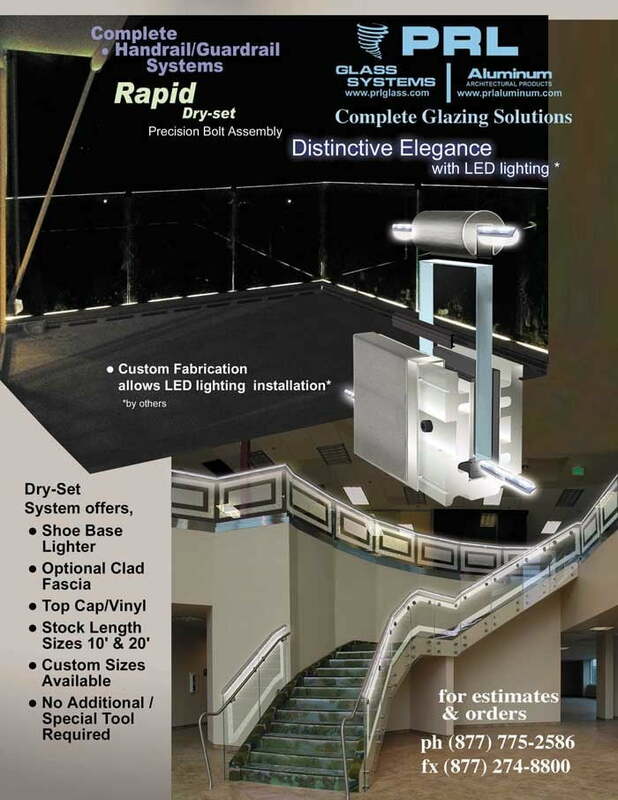 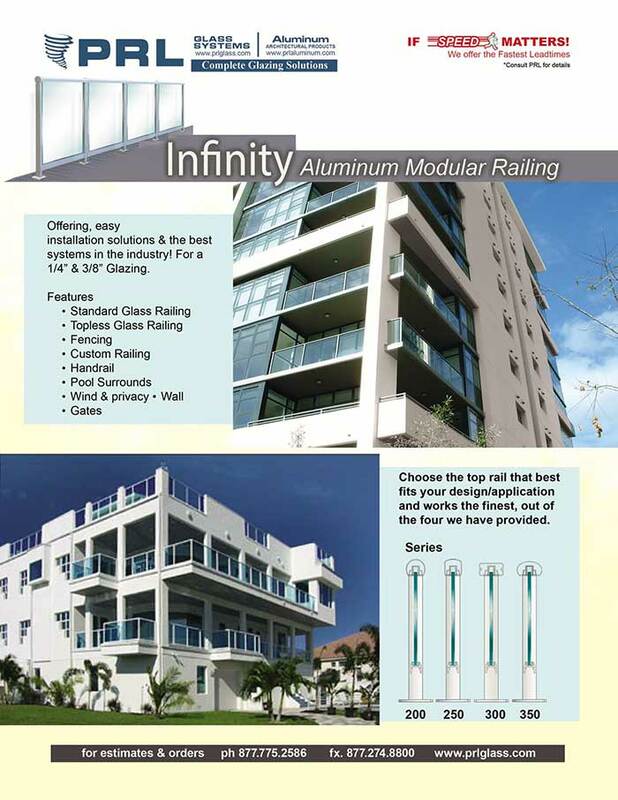 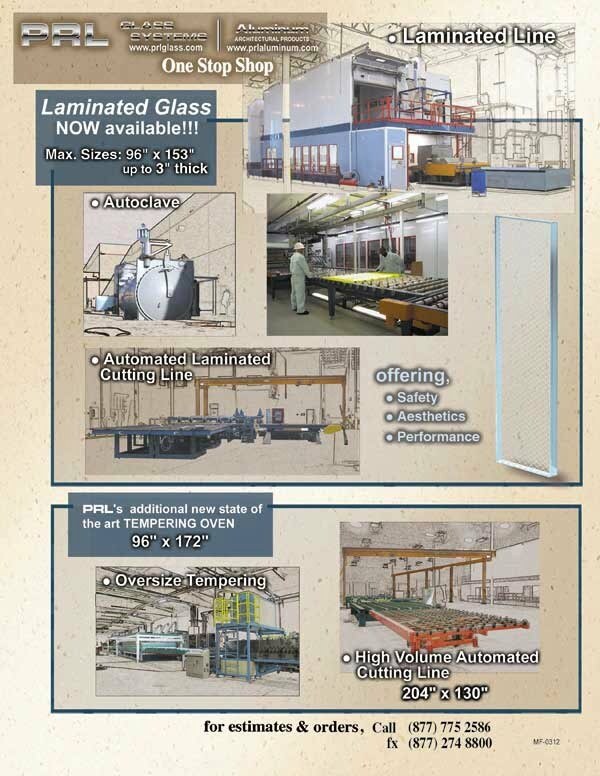 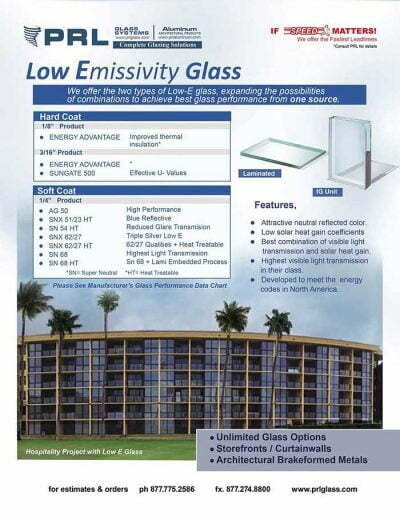 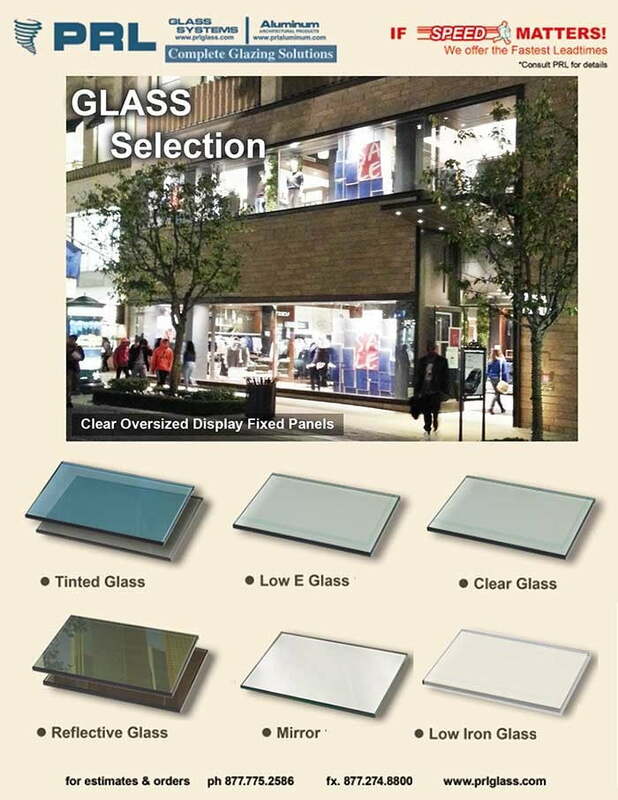 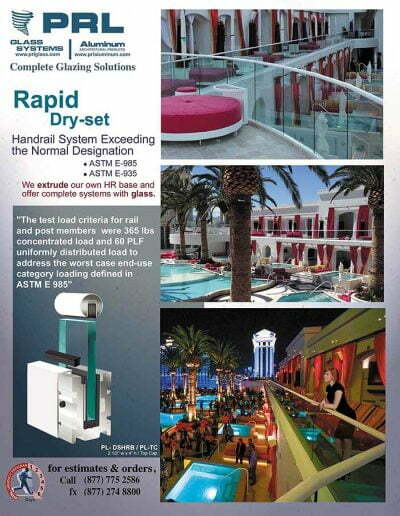 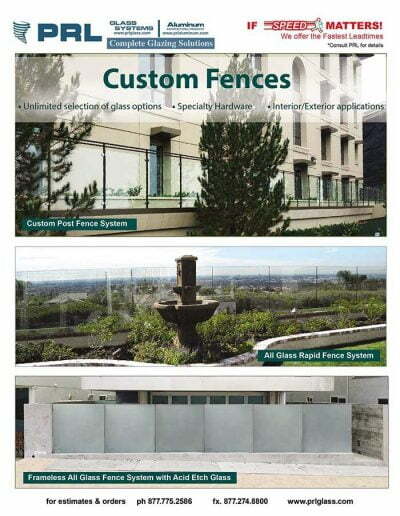 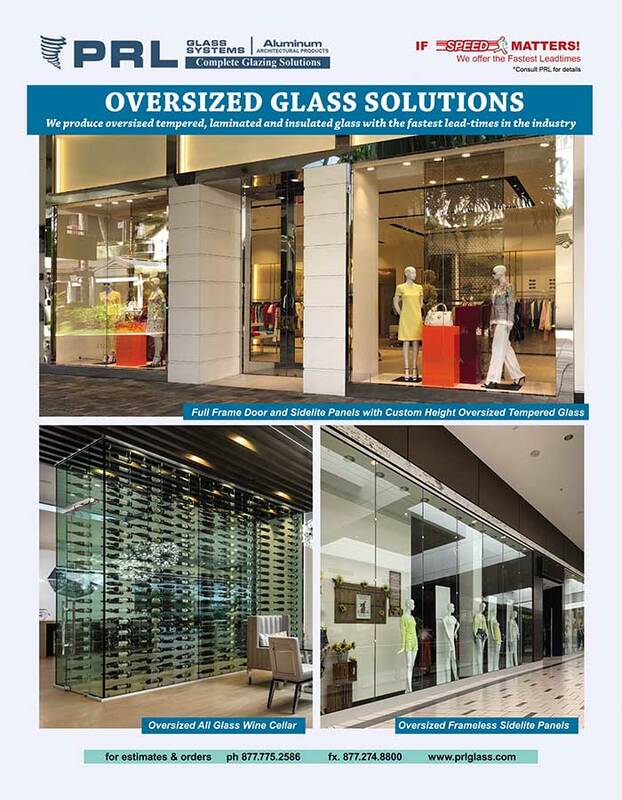 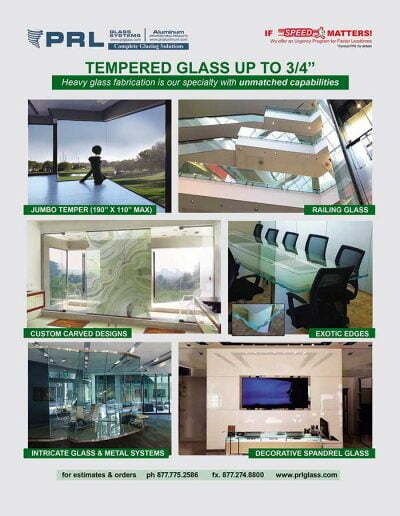 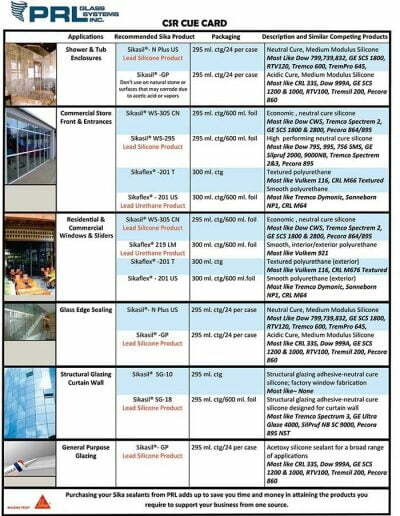 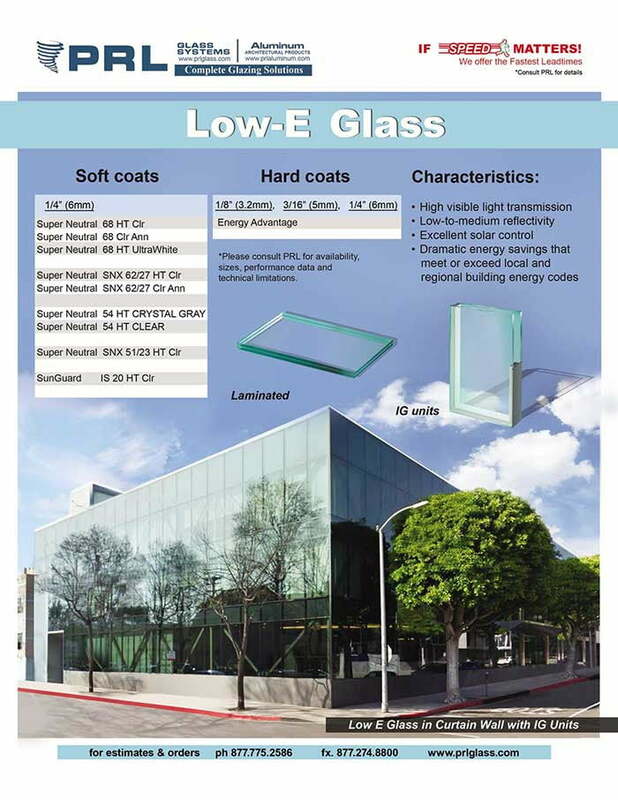 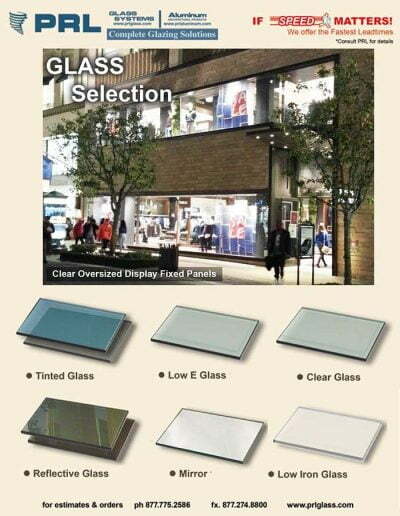 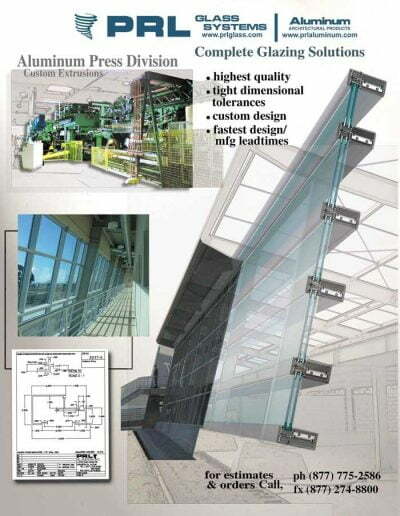 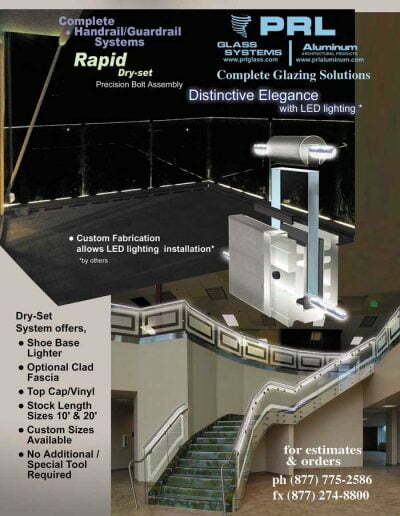 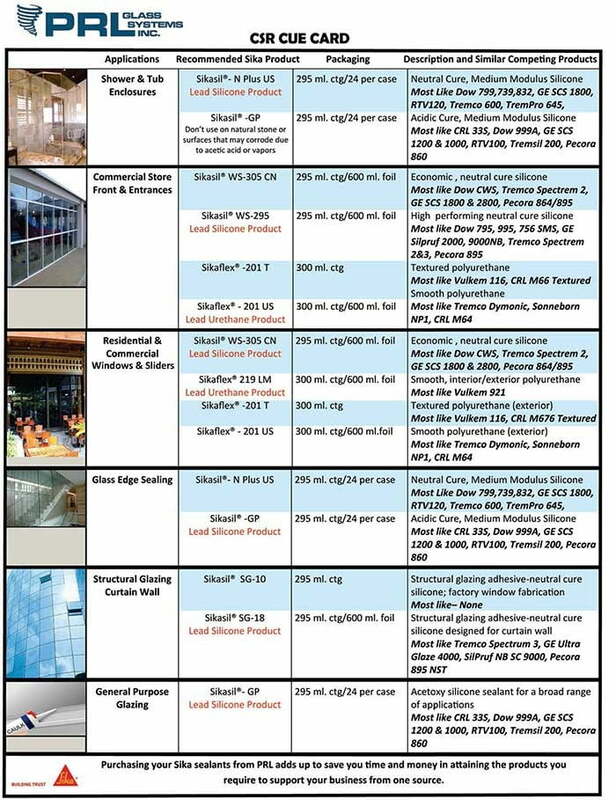 Our aluminum storefront and glass curtain wall systems have been tested to meet all your storefront specifications. 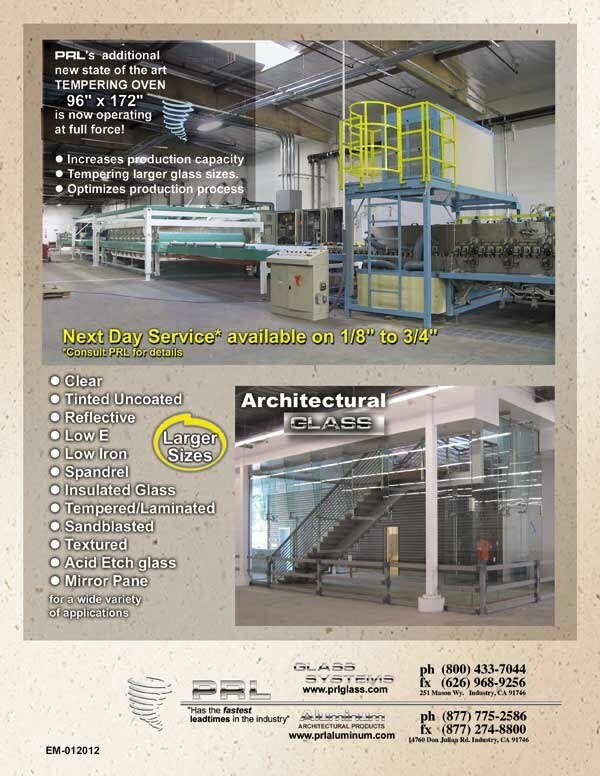 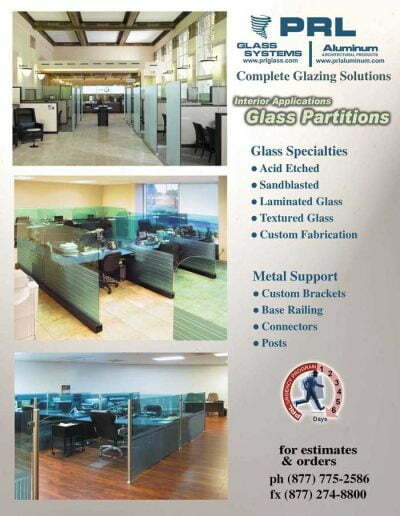 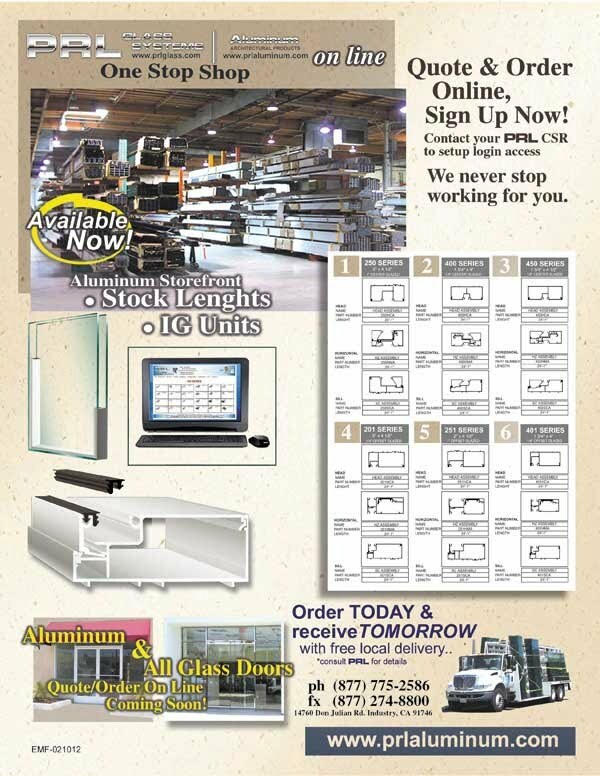 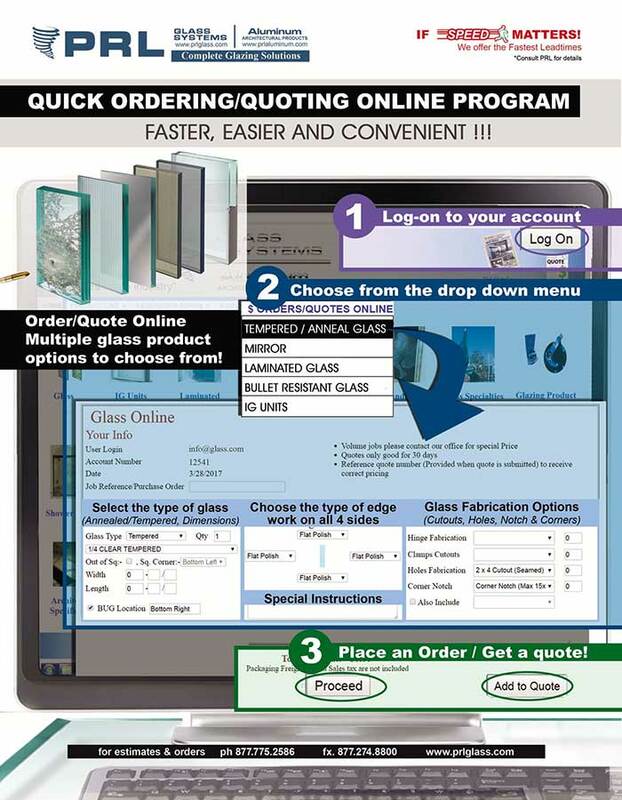 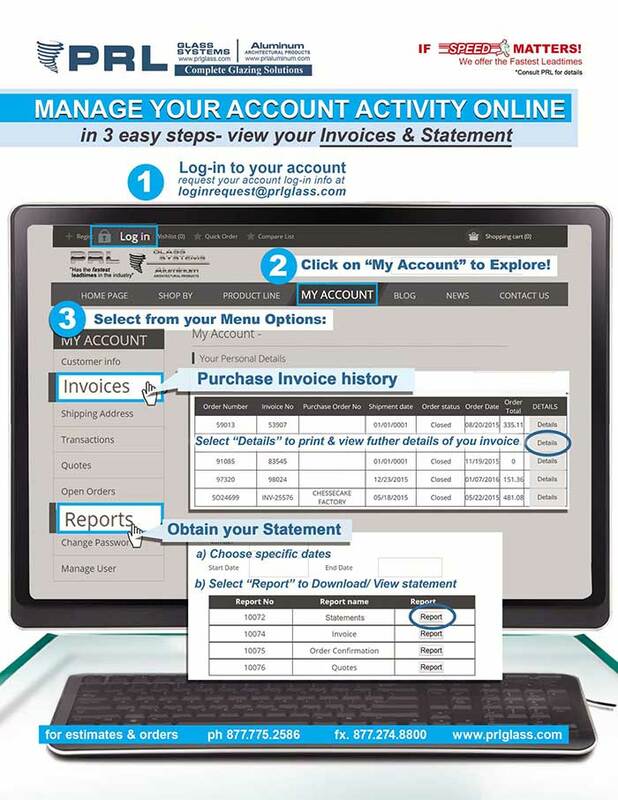 We believe that by consolidating your aluminum storefront and glass project on one purchase order you will save time and money. 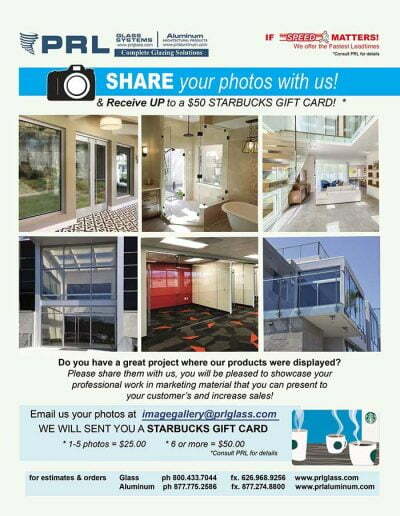 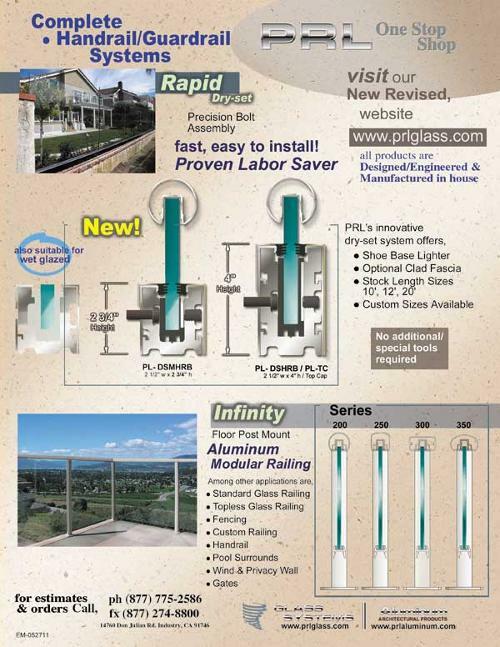 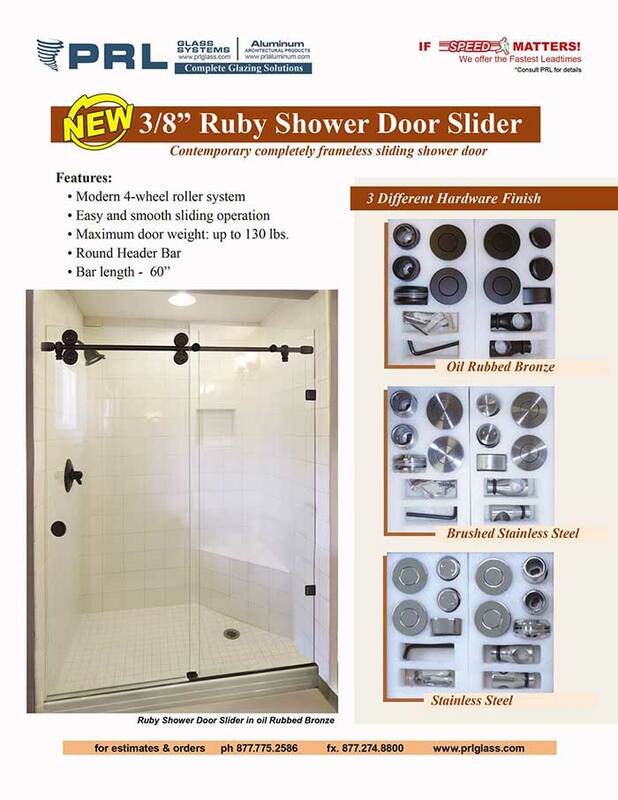 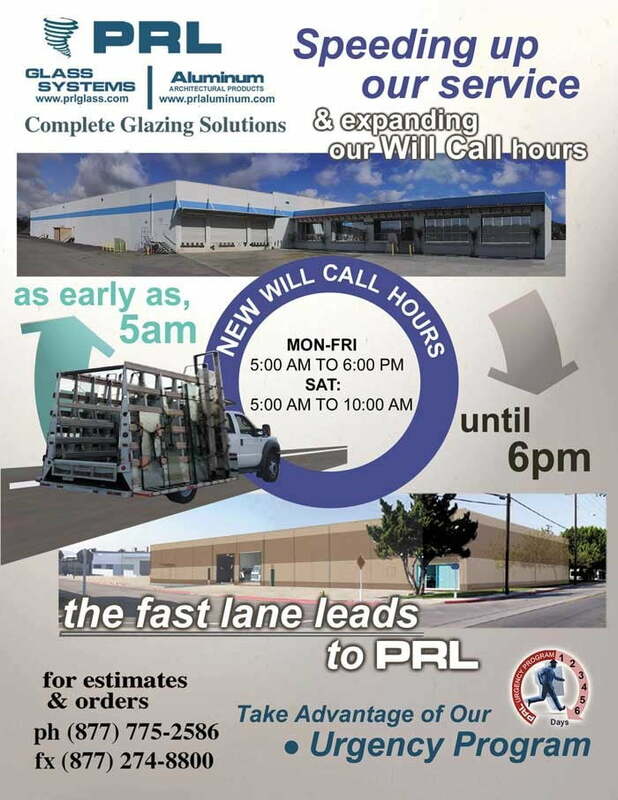 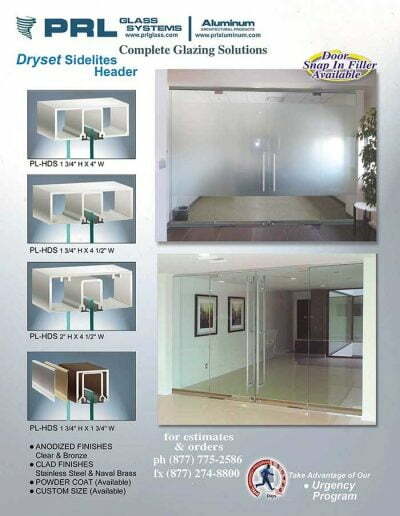 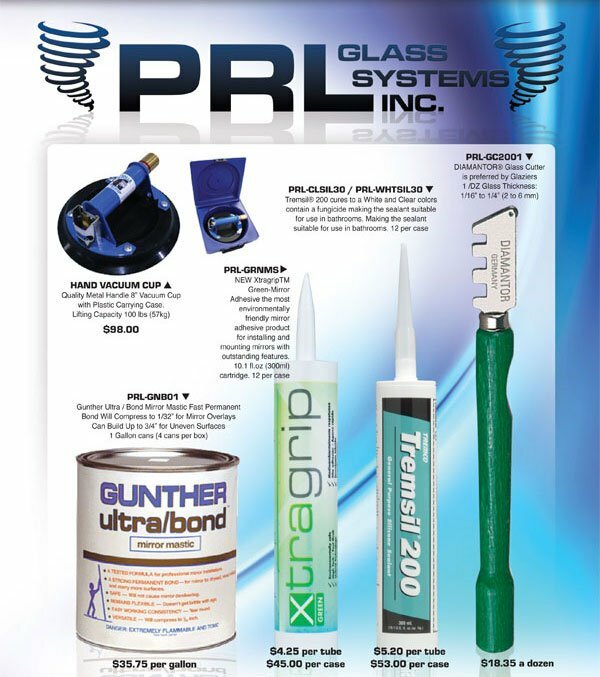 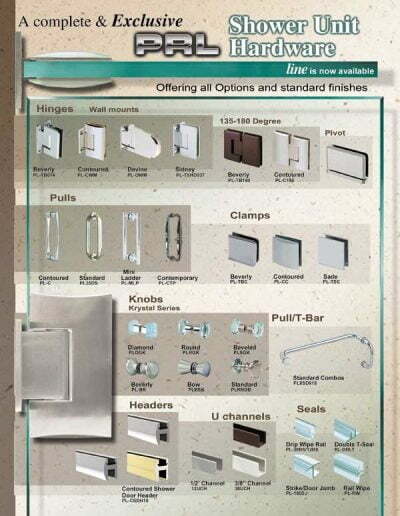 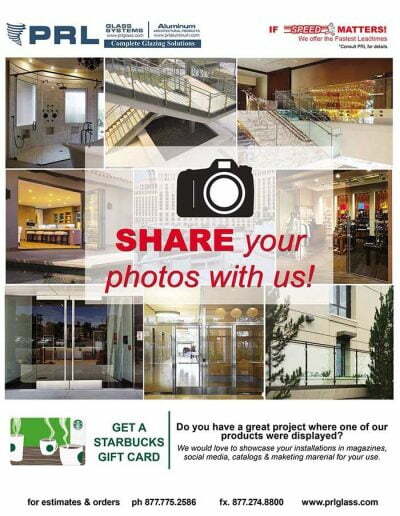 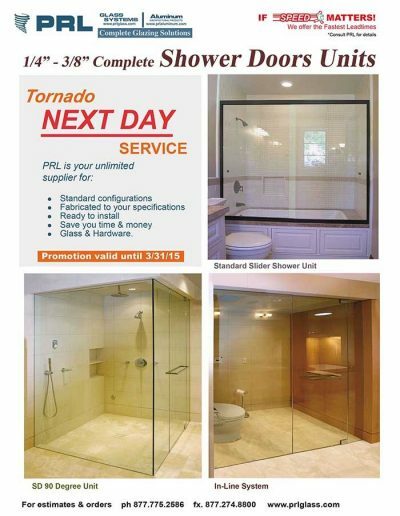 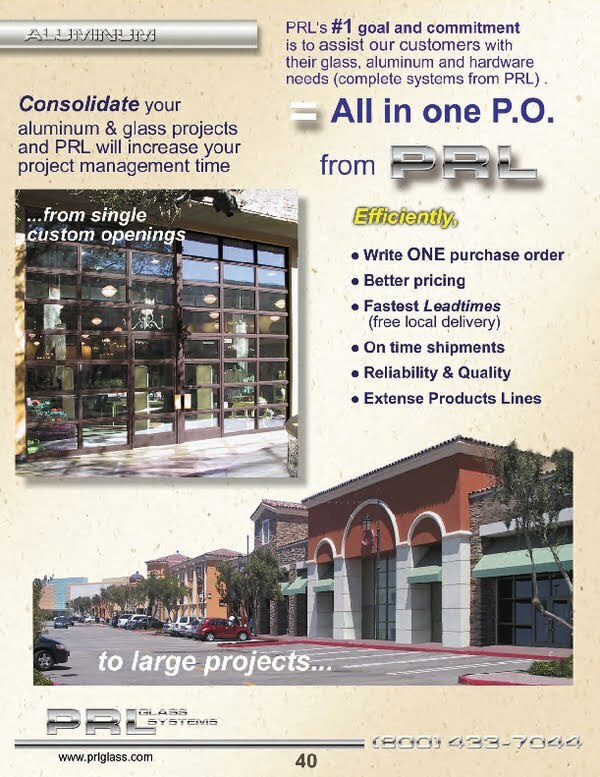 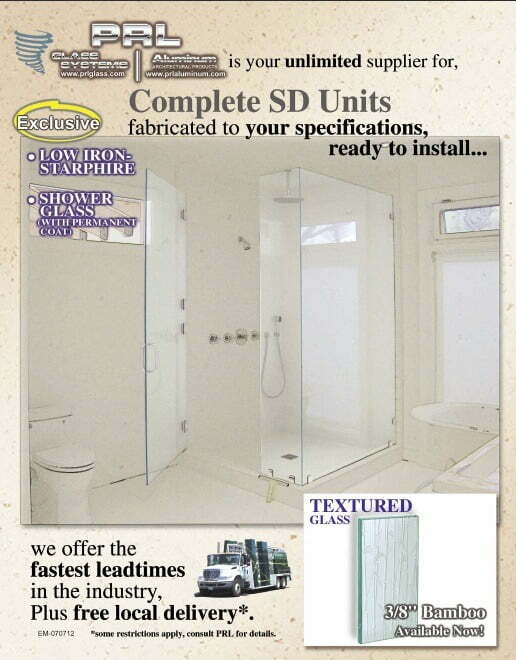 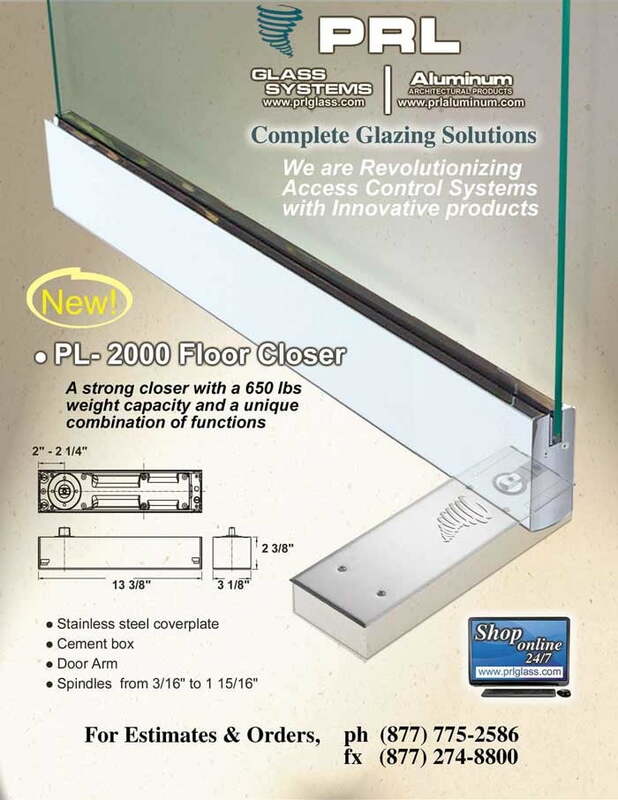 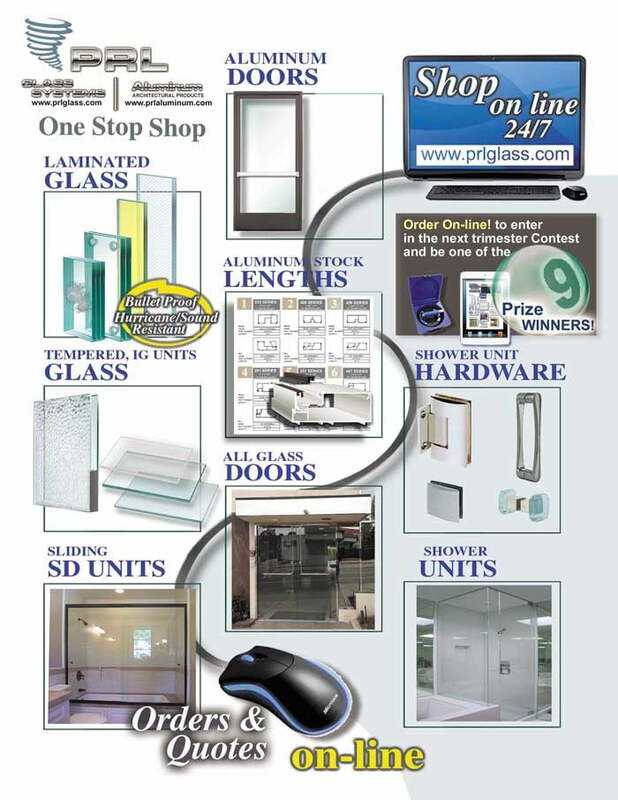 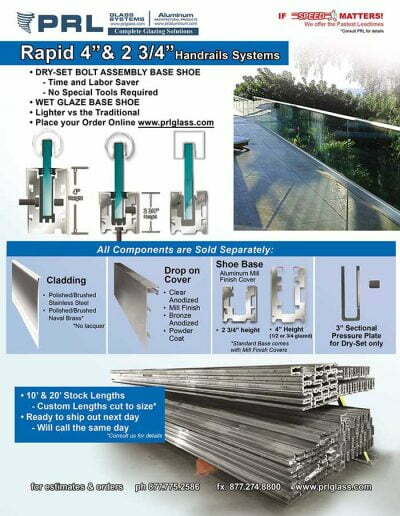 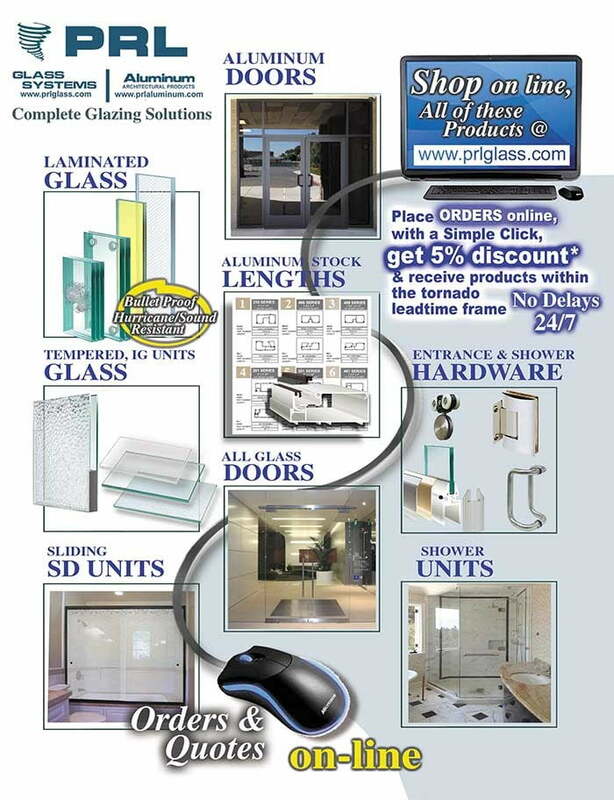 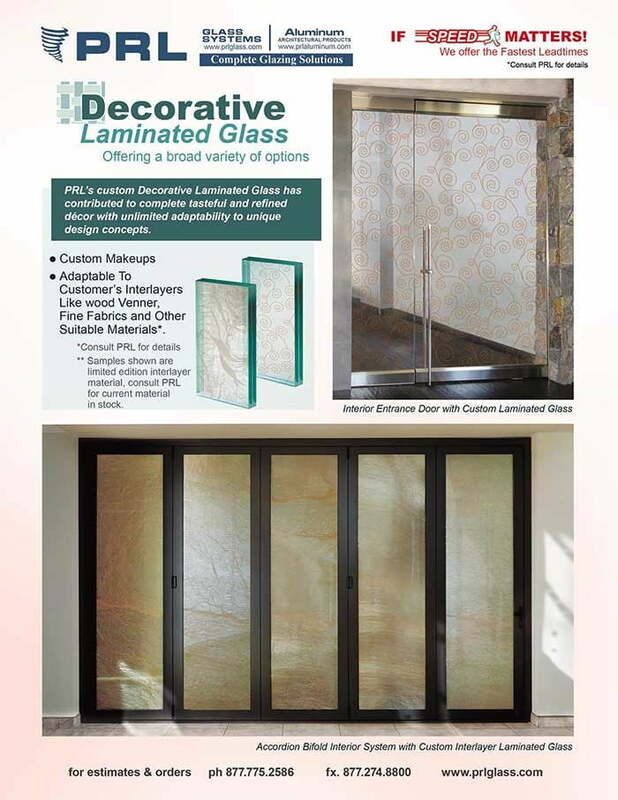 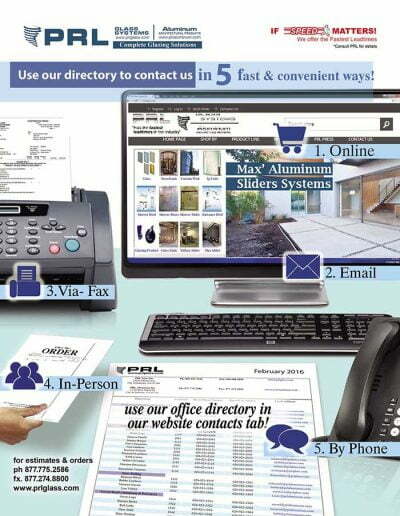 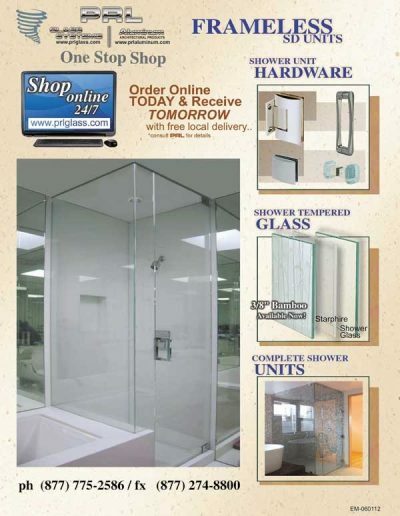 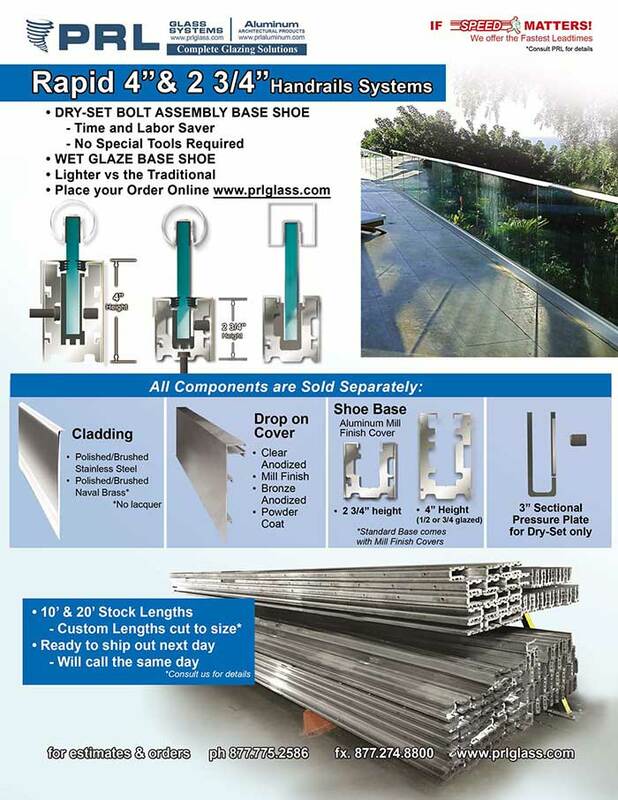 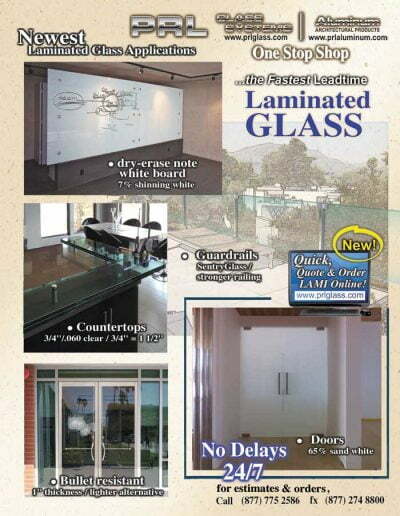 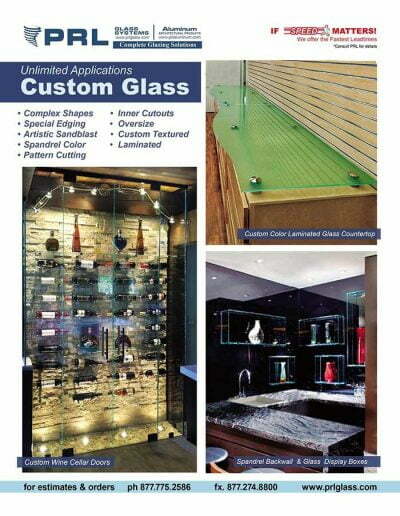 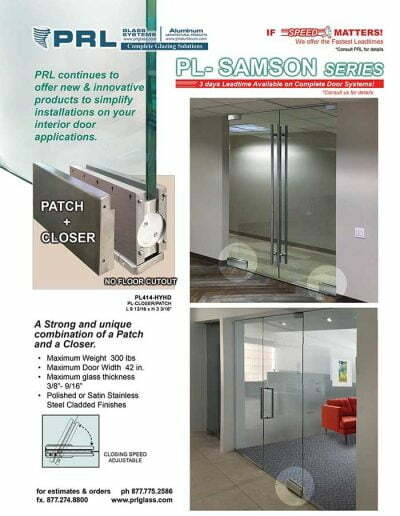 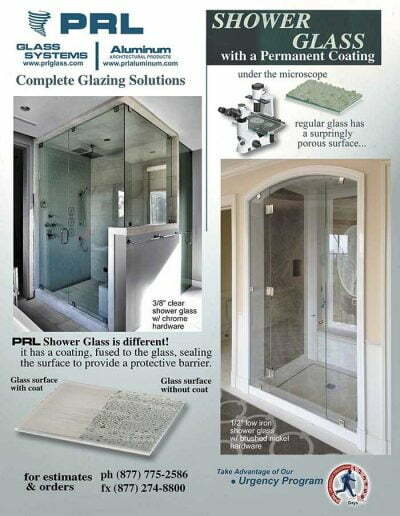 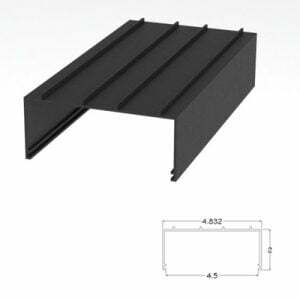 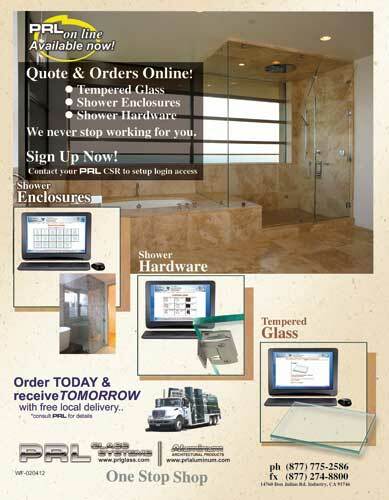 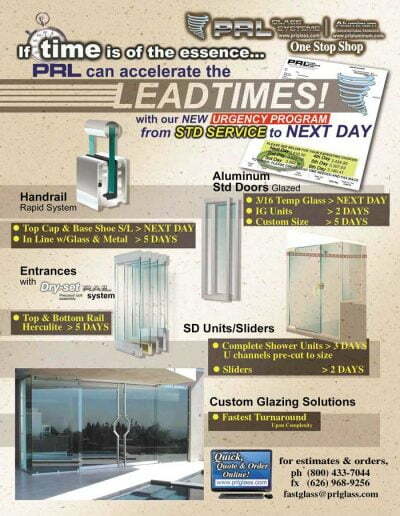 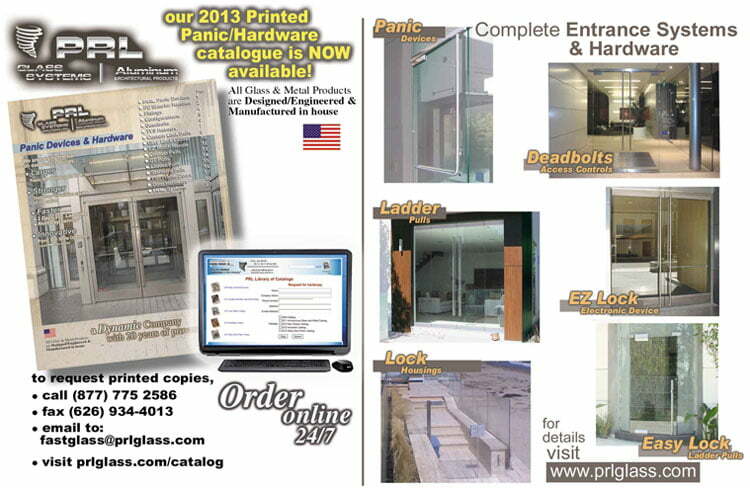 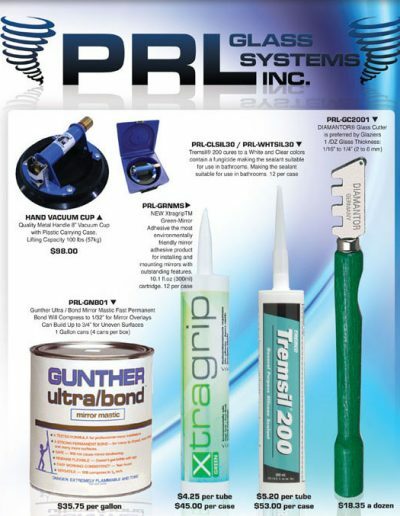 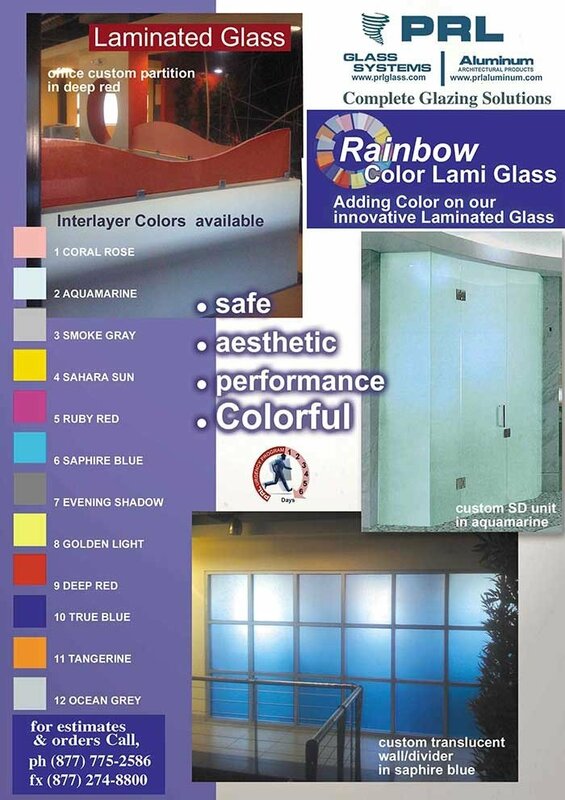 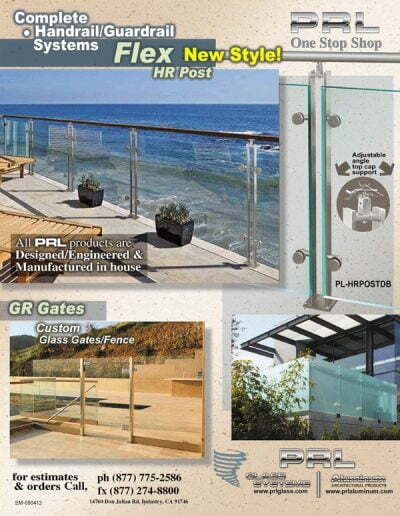 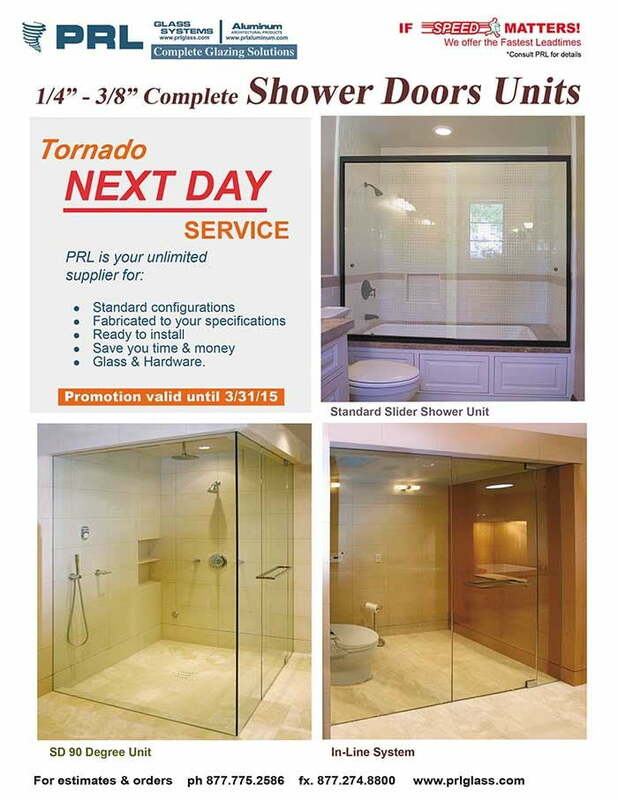 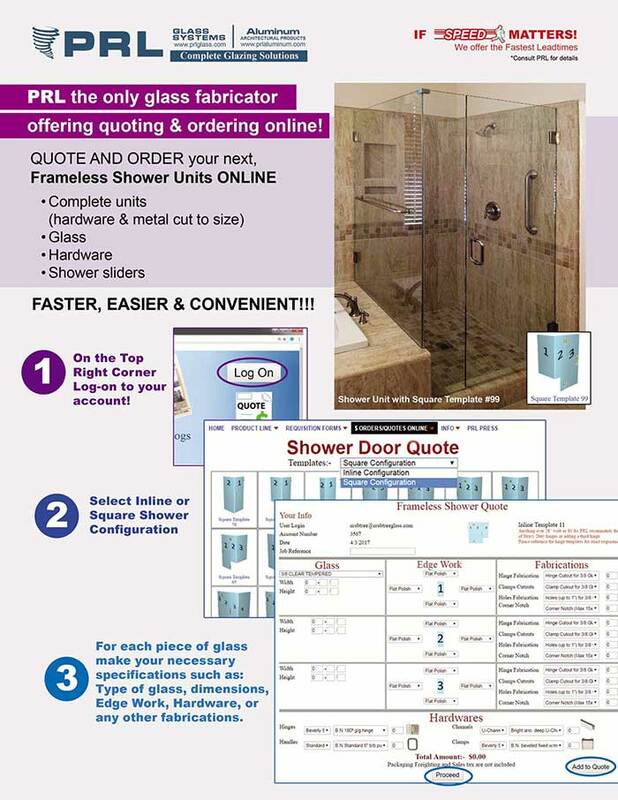 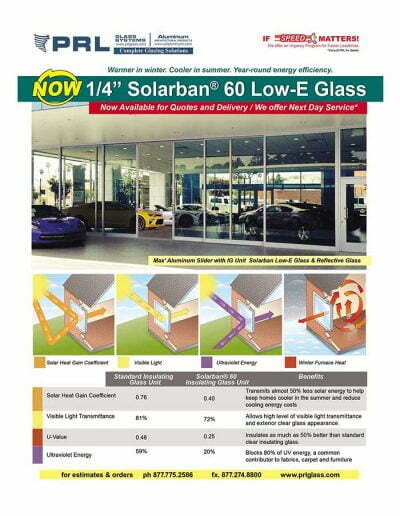 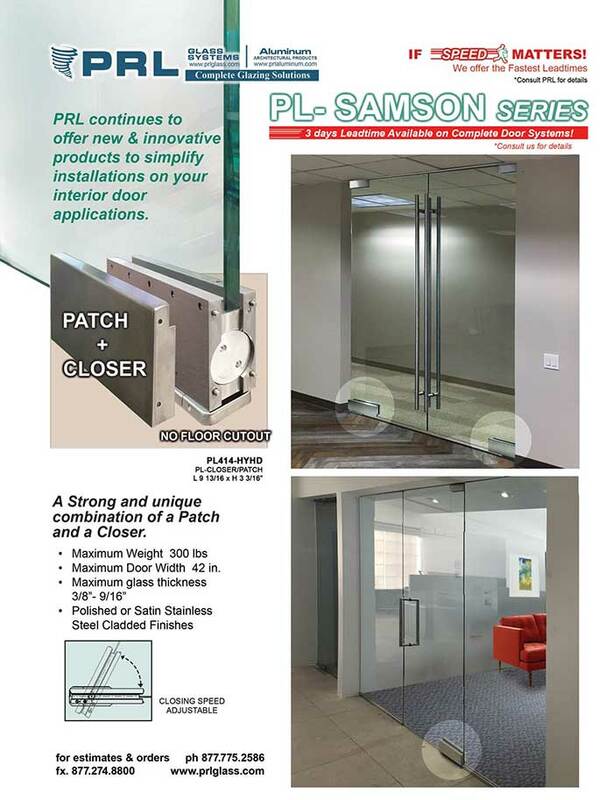 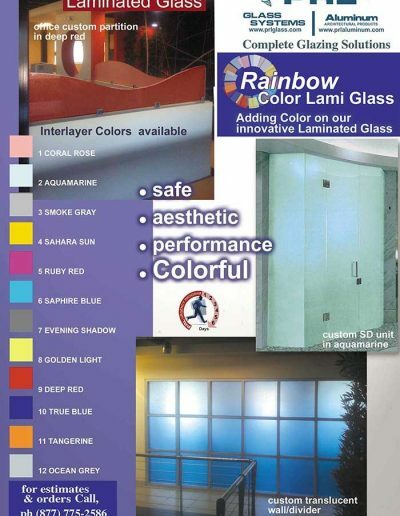 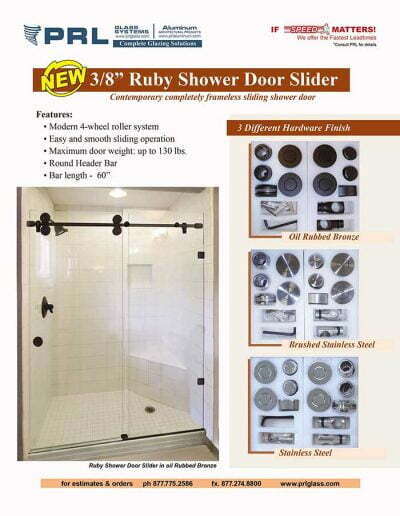 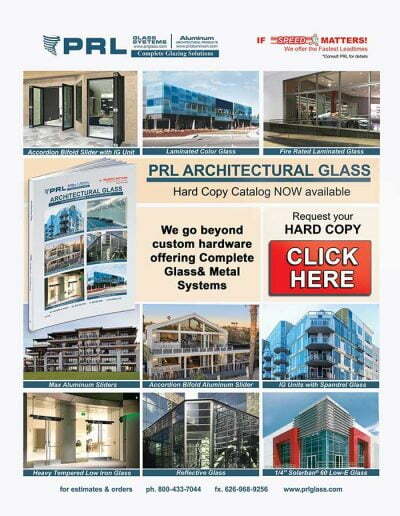 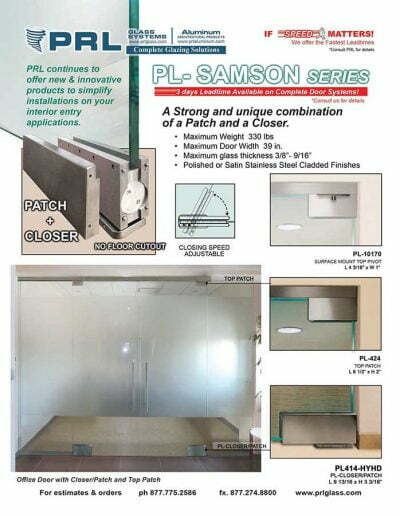 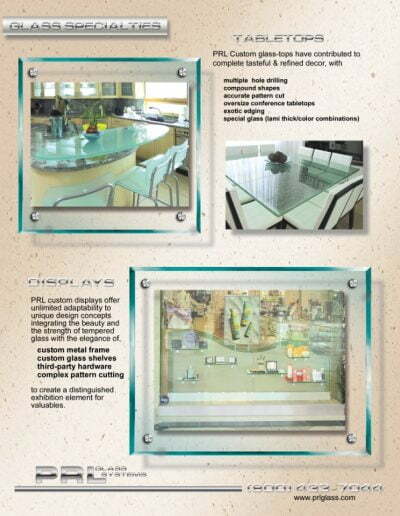 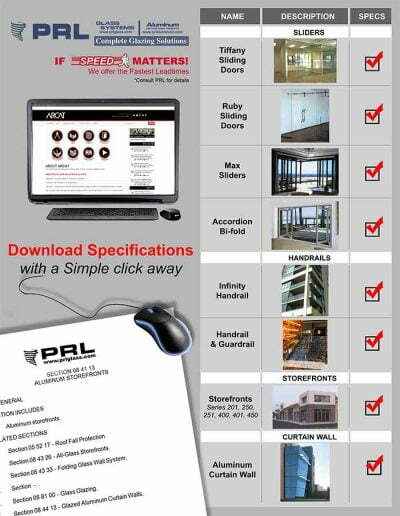 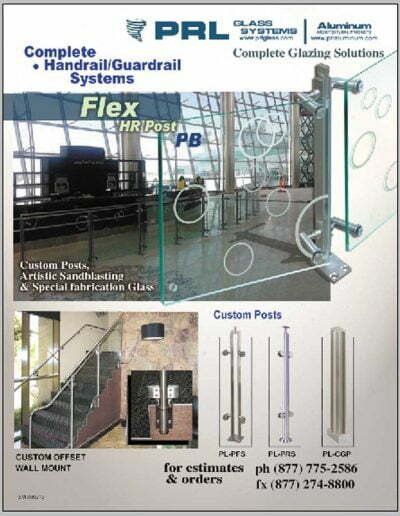 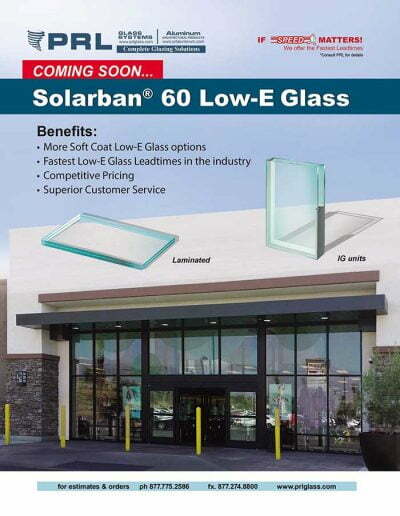 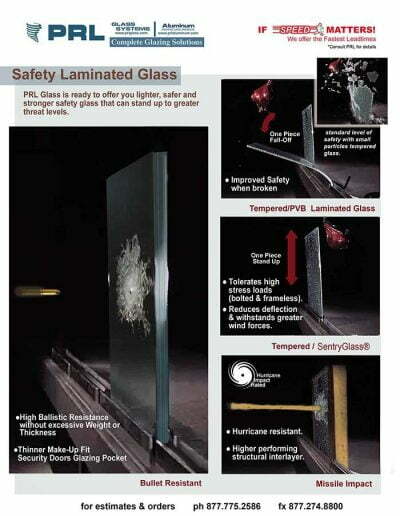 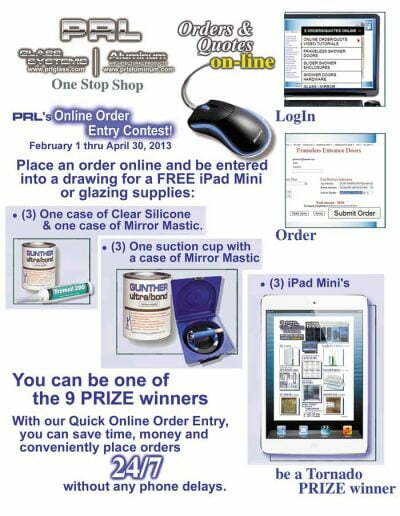 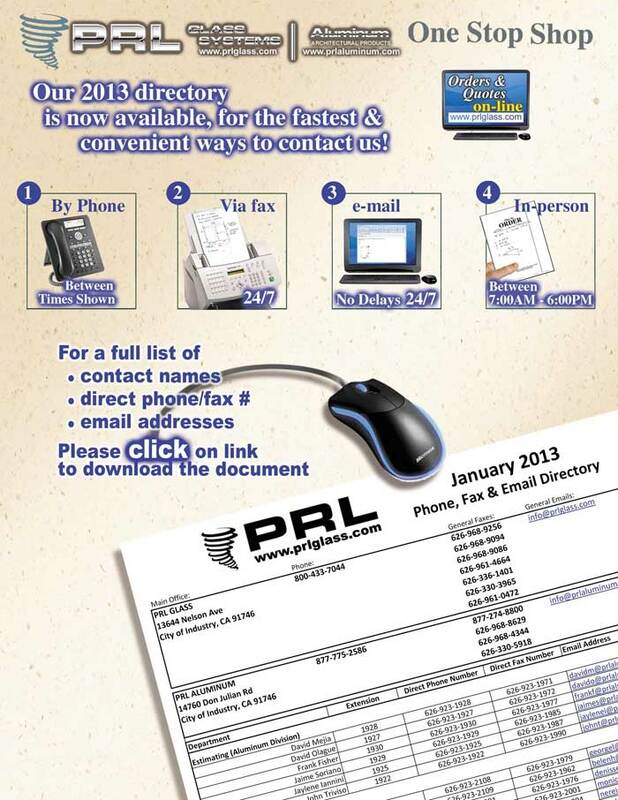 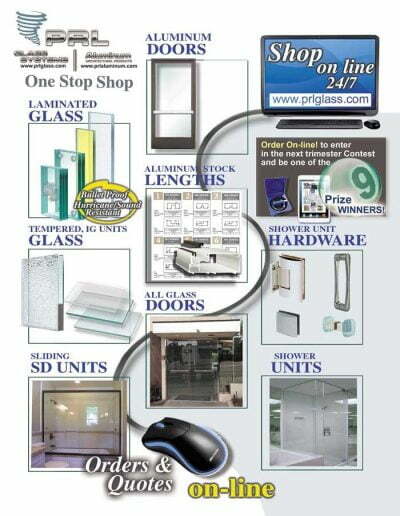 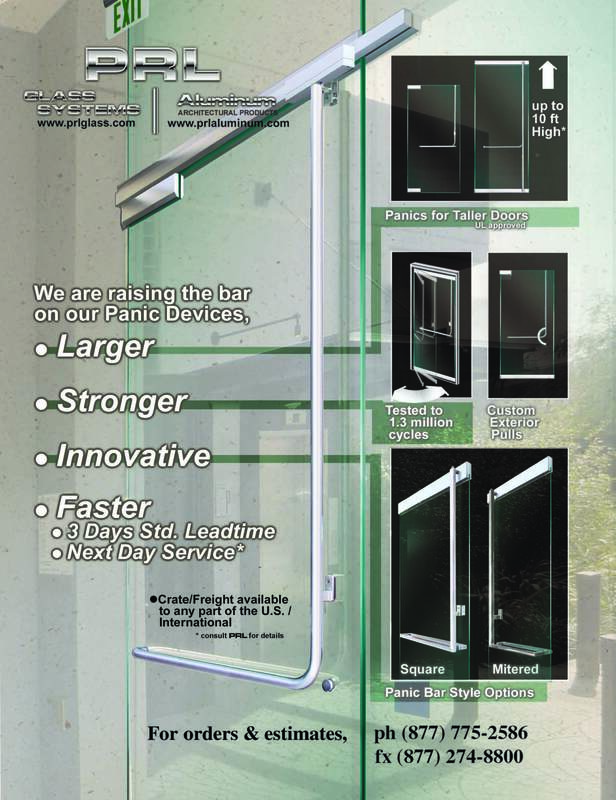 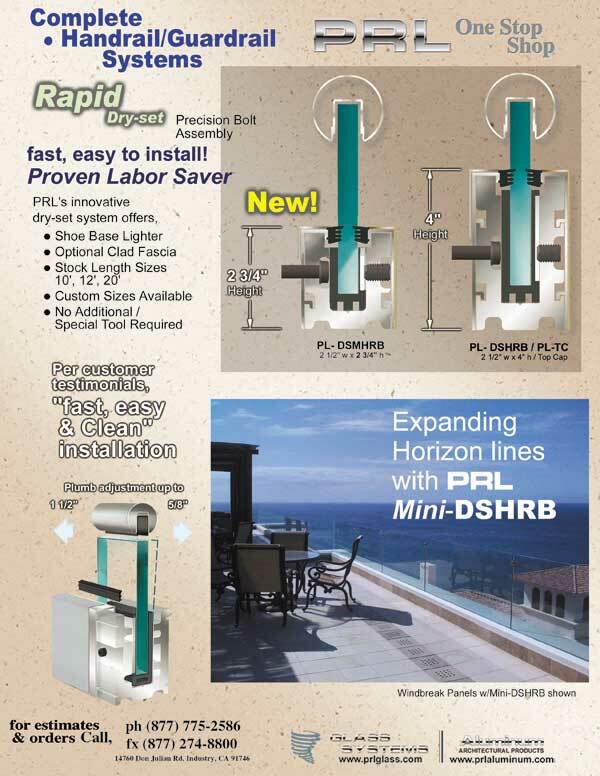 PRL will also ship all your storefront materials to your job site or to your shop. 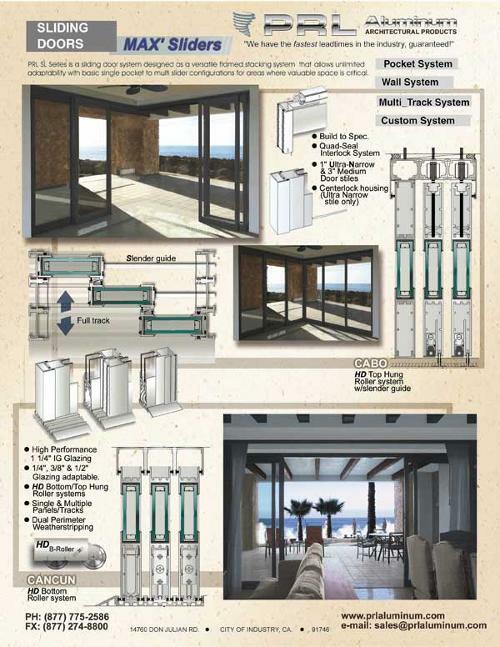 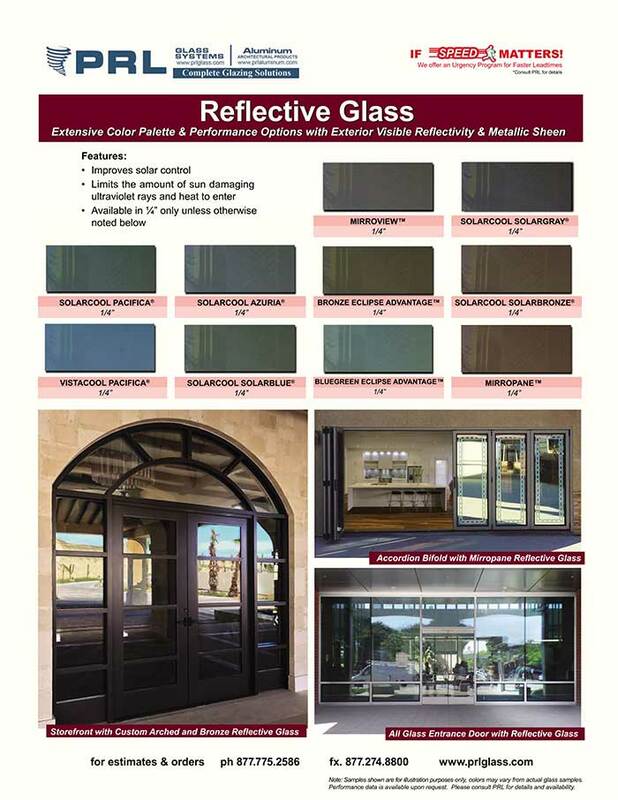 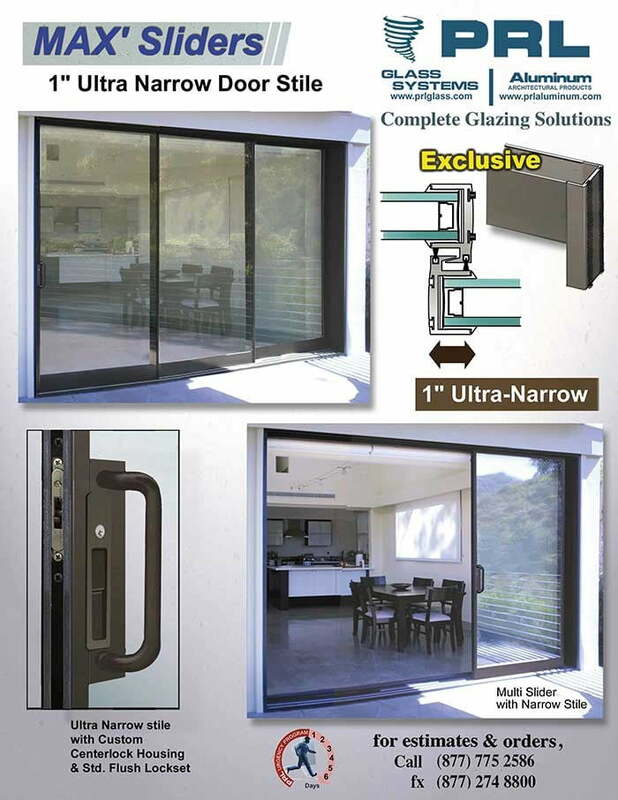 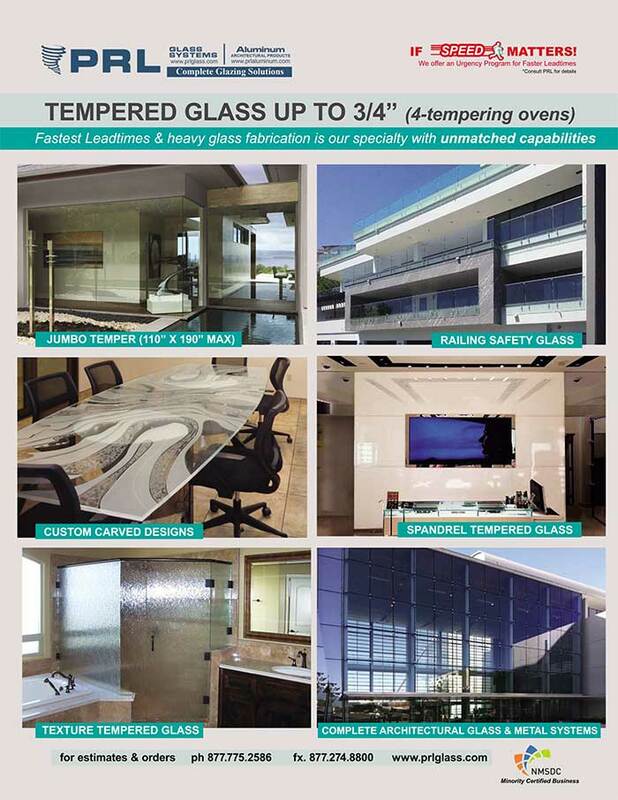 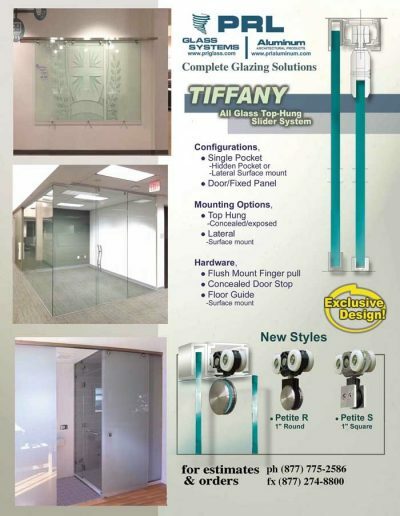 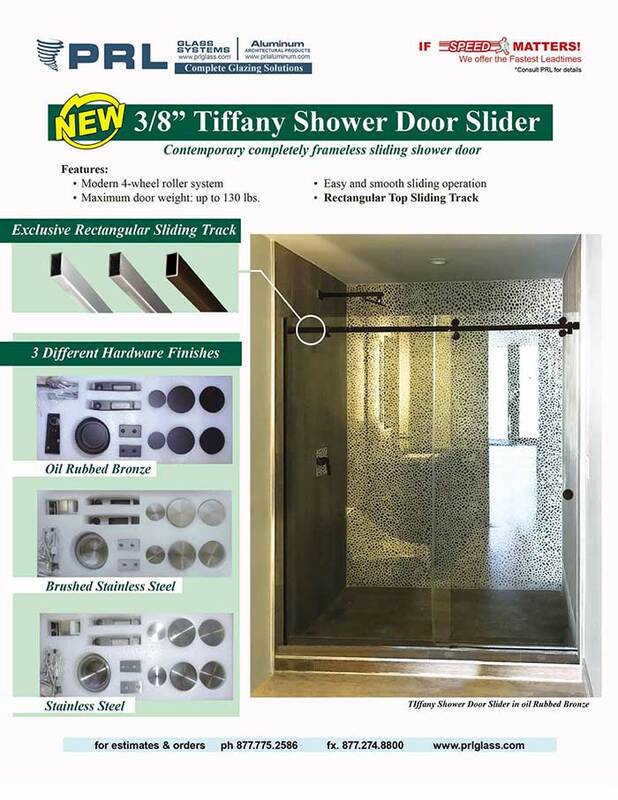 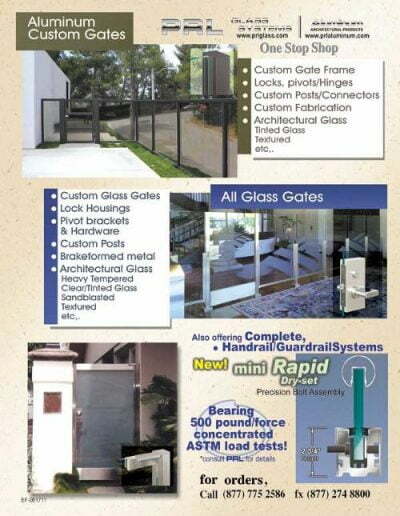 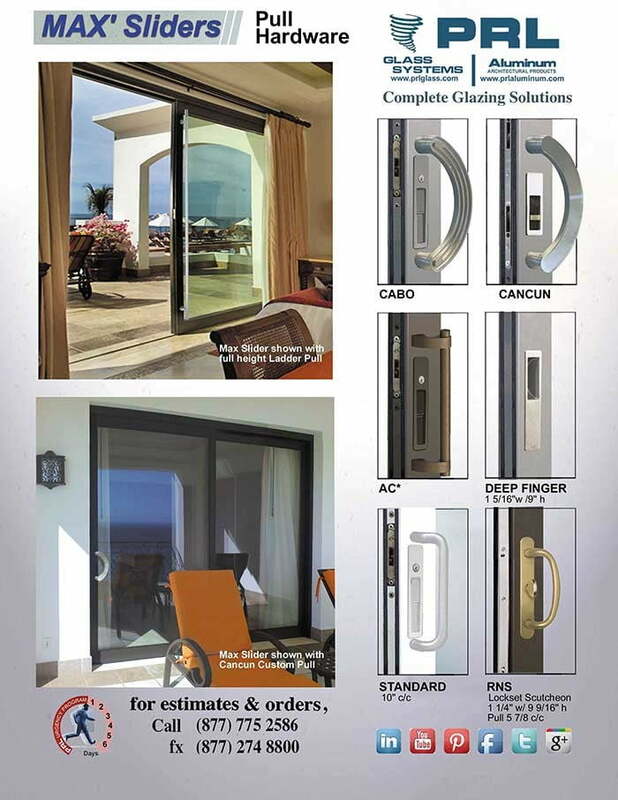 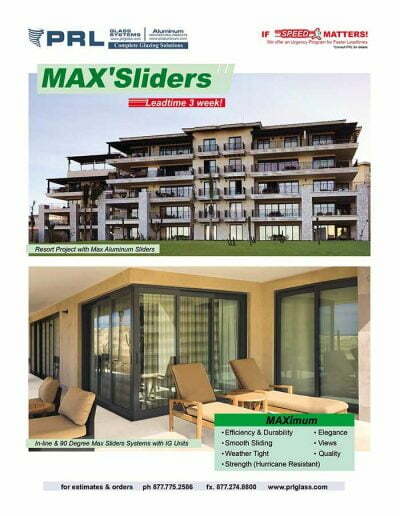 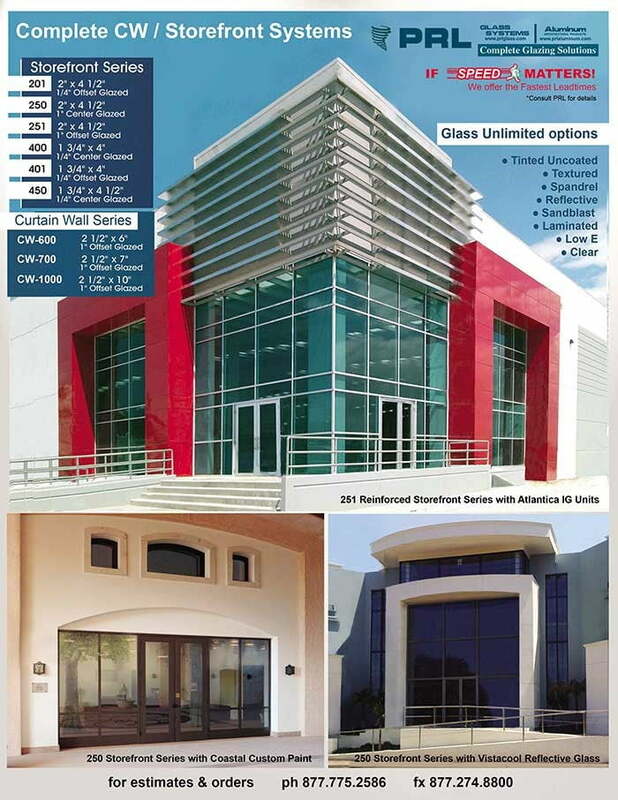 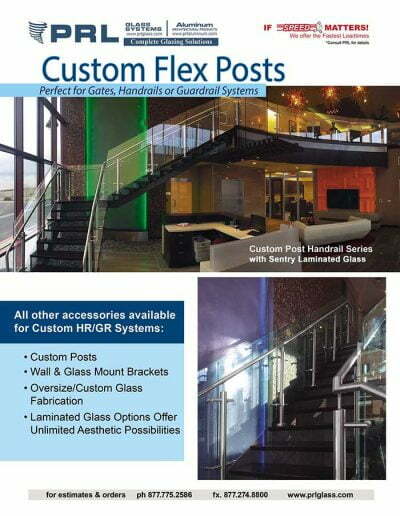 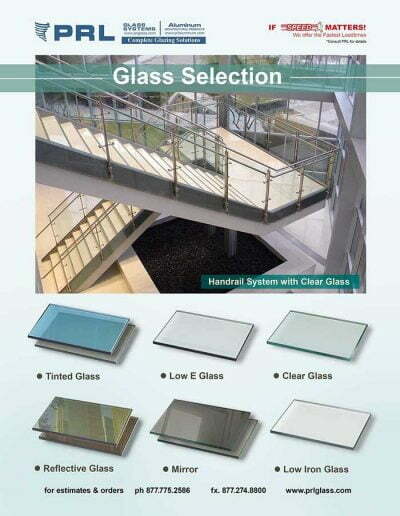 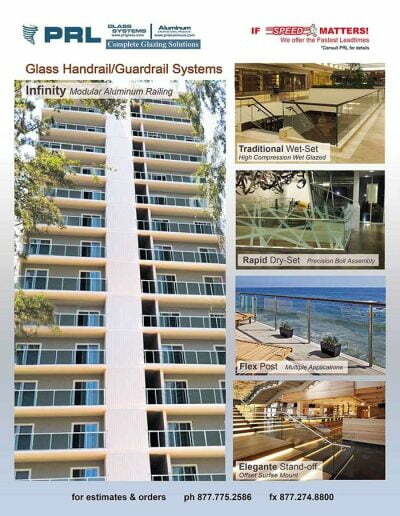 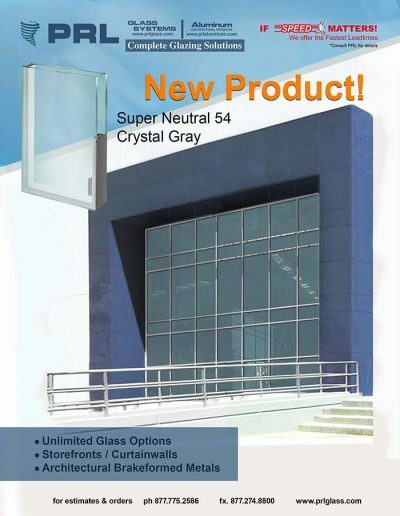 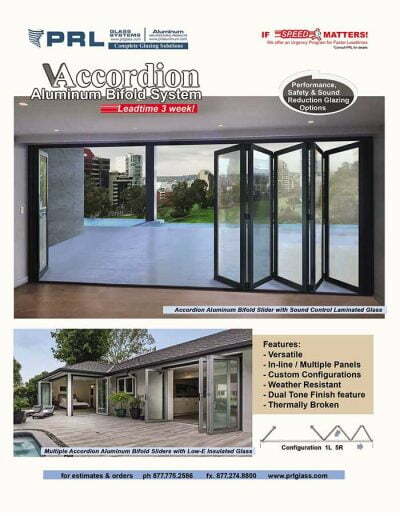 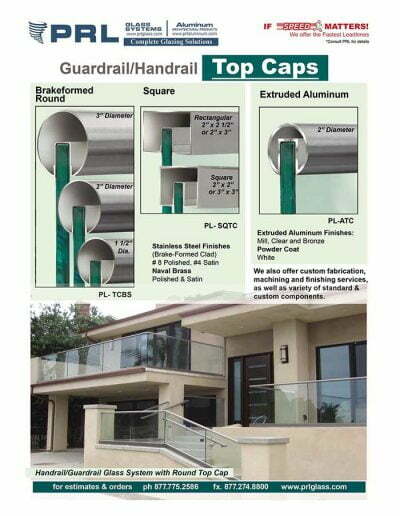 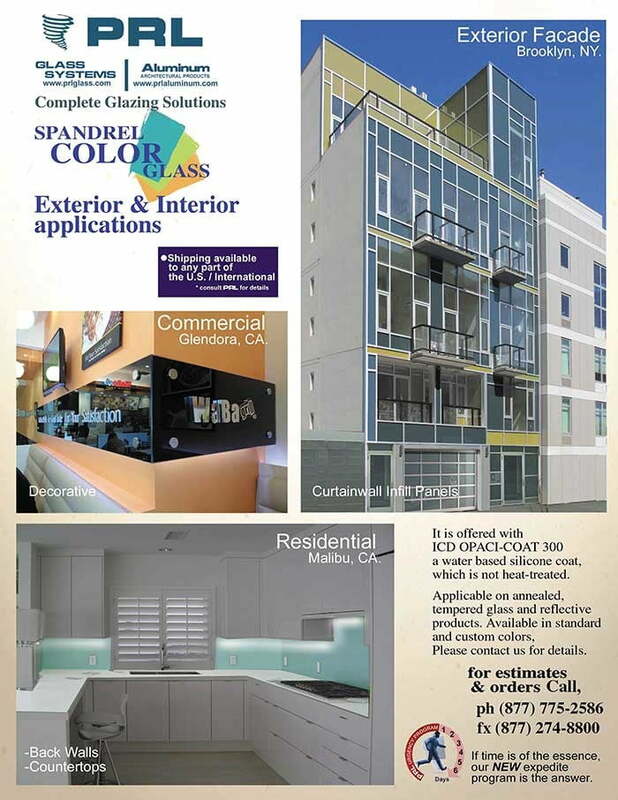 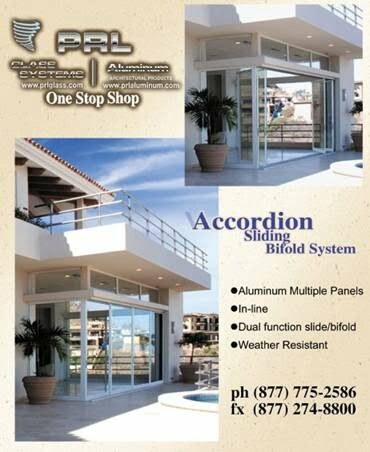 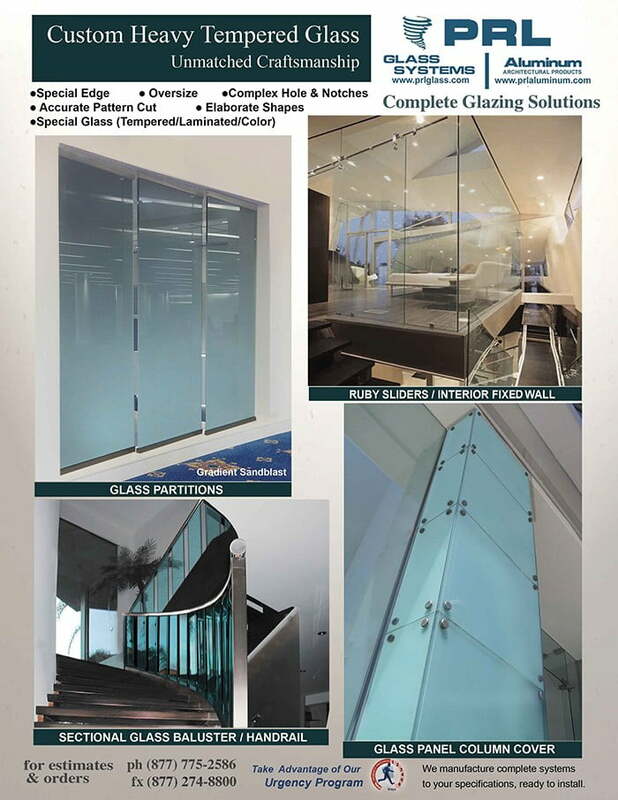 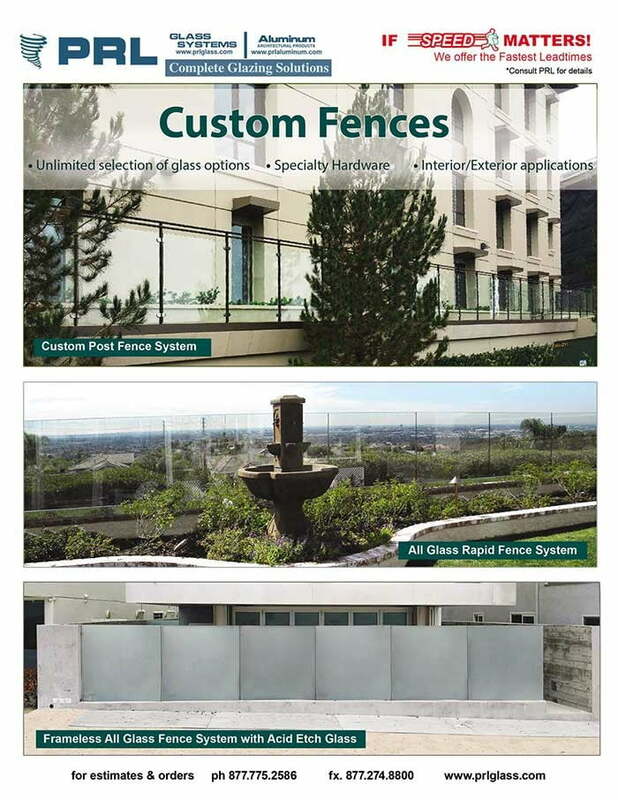 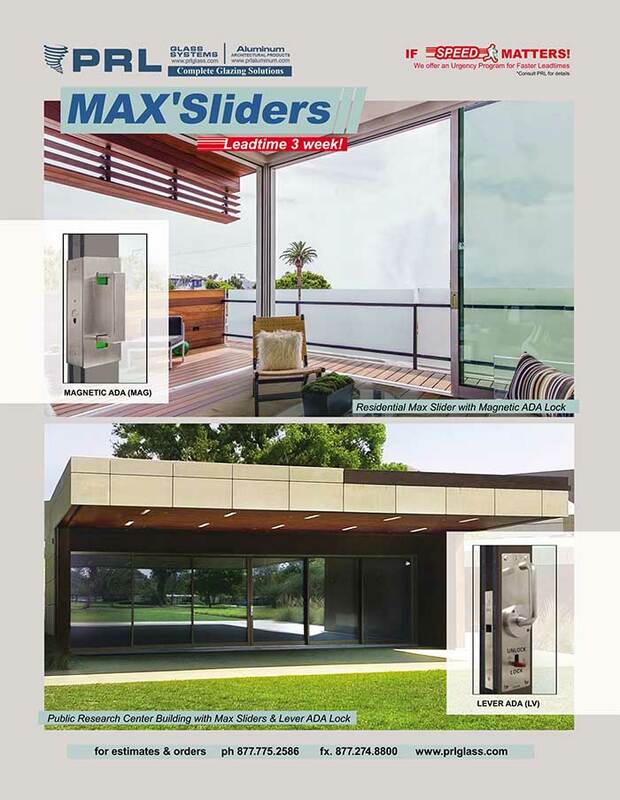 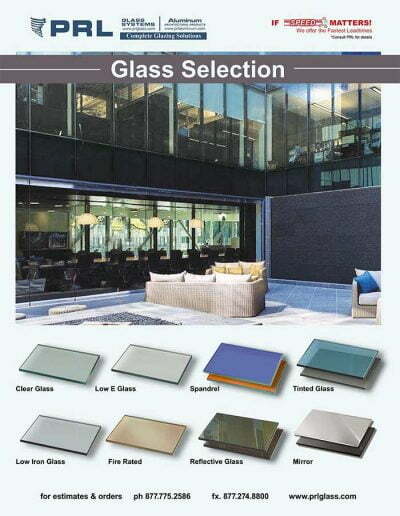 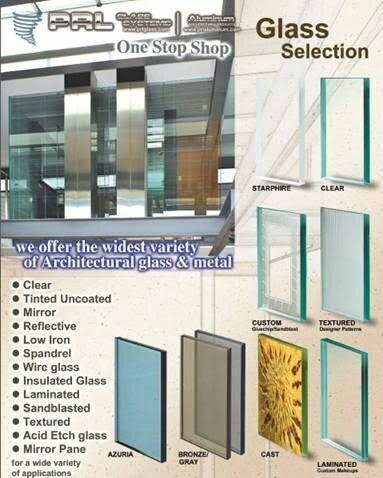 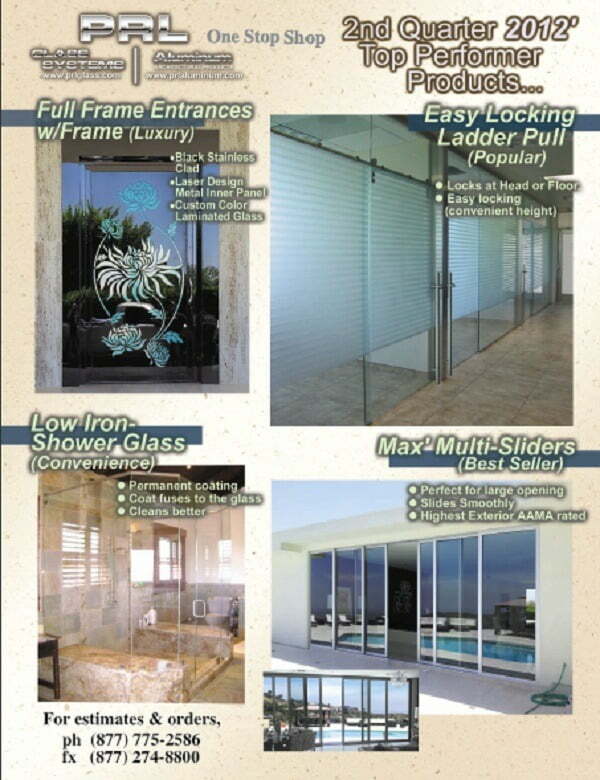 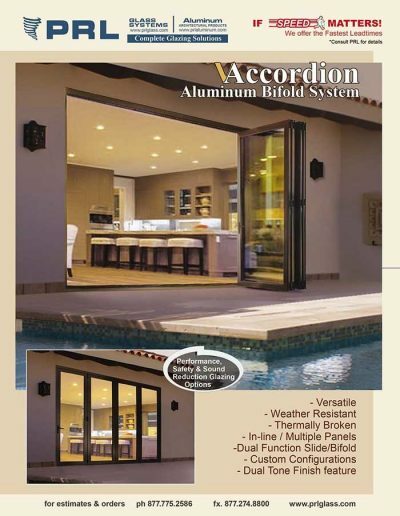 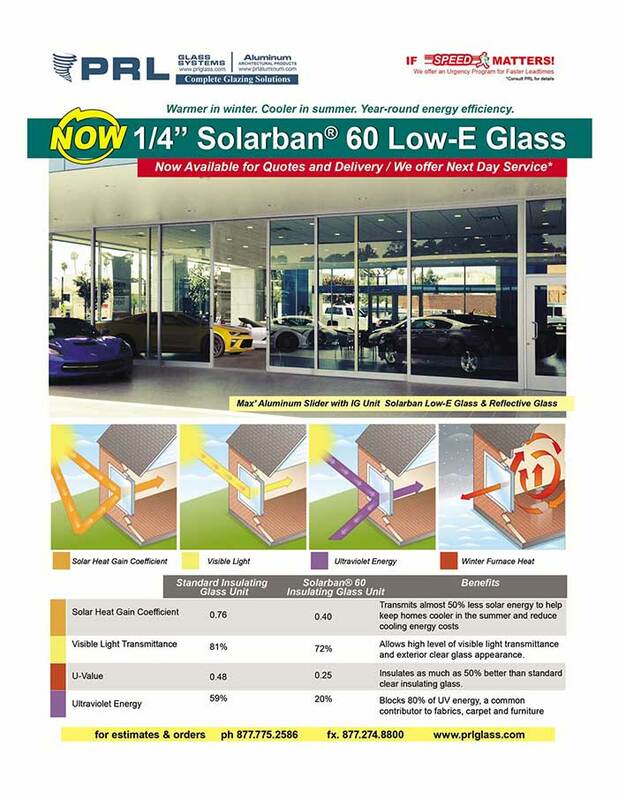 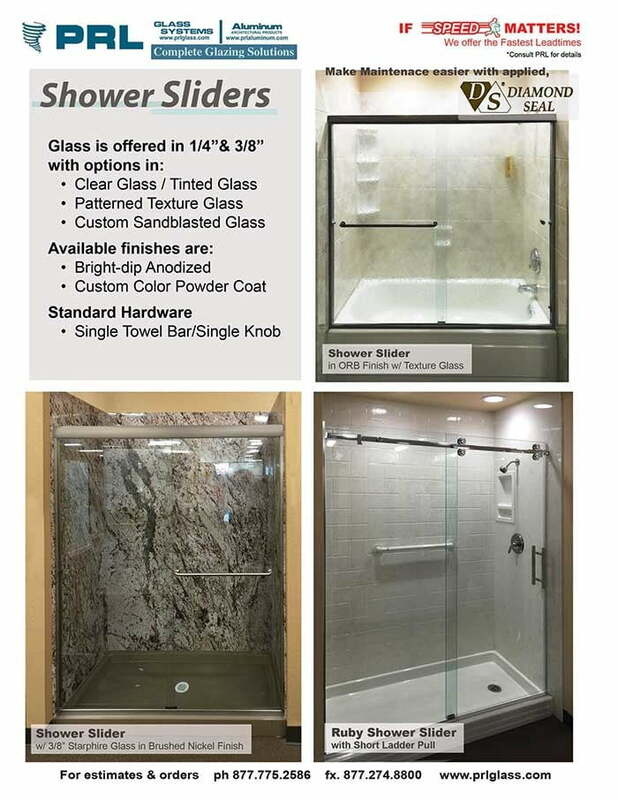 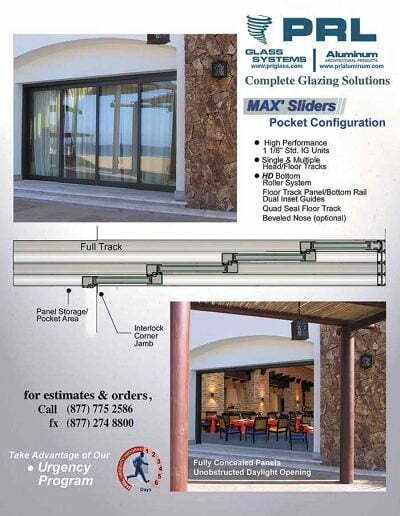 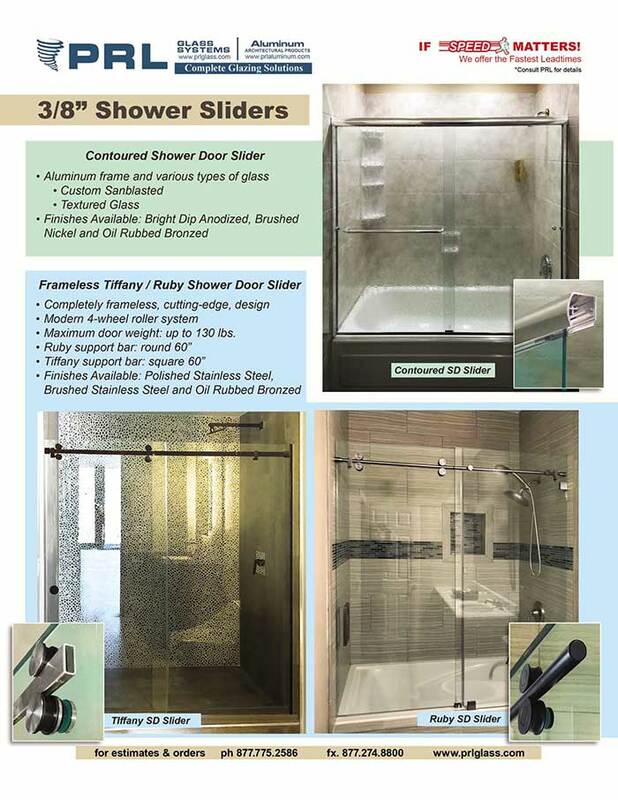 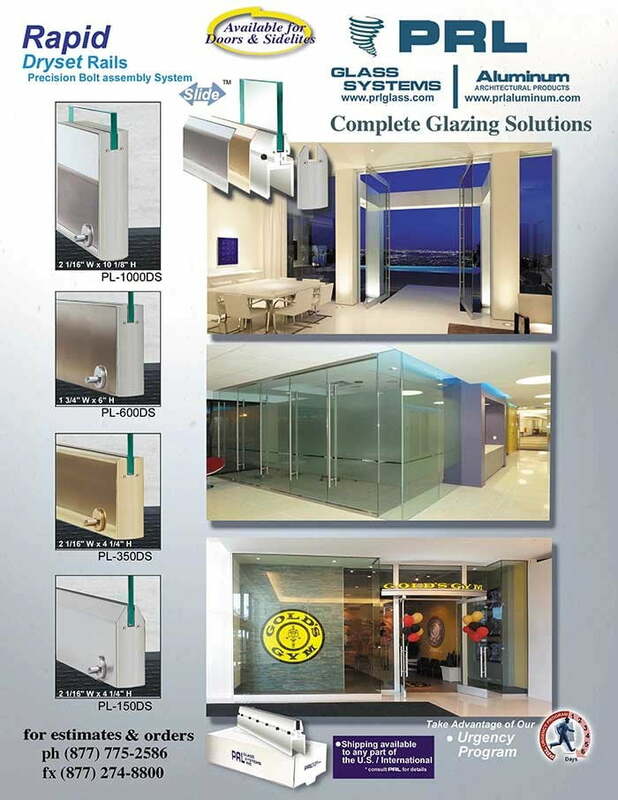 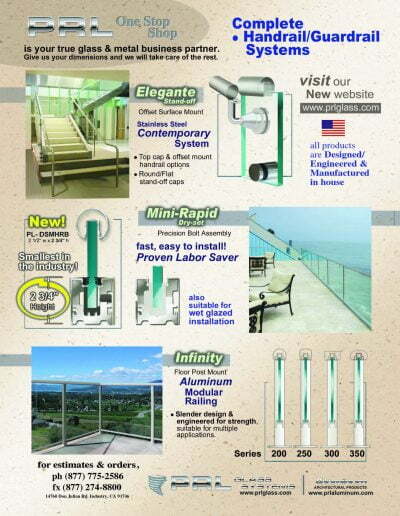 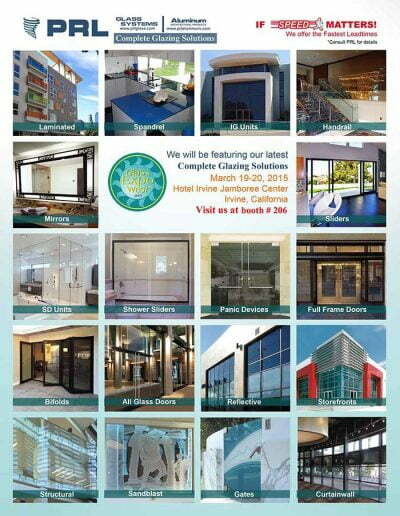 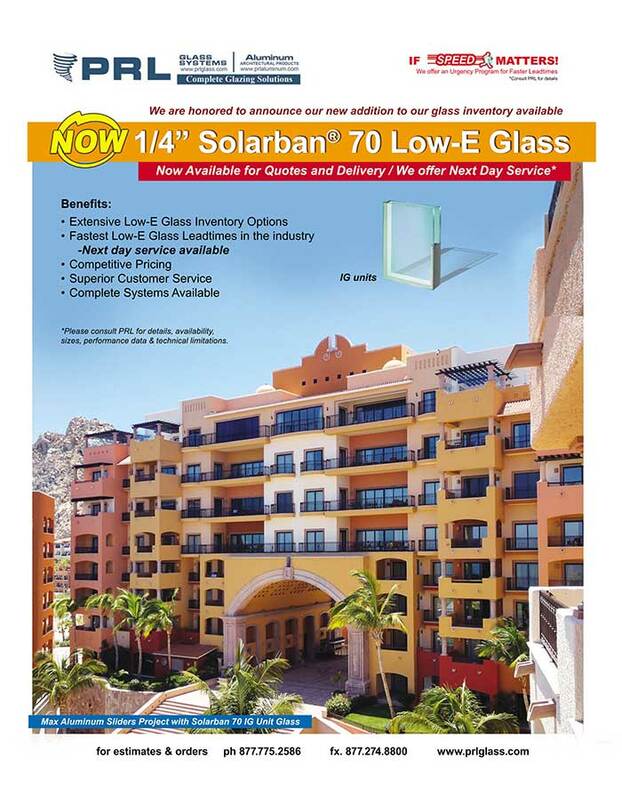 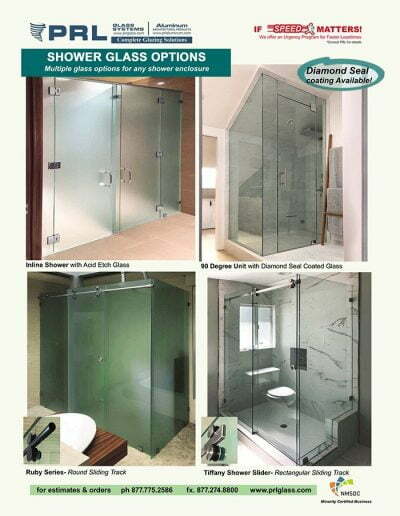 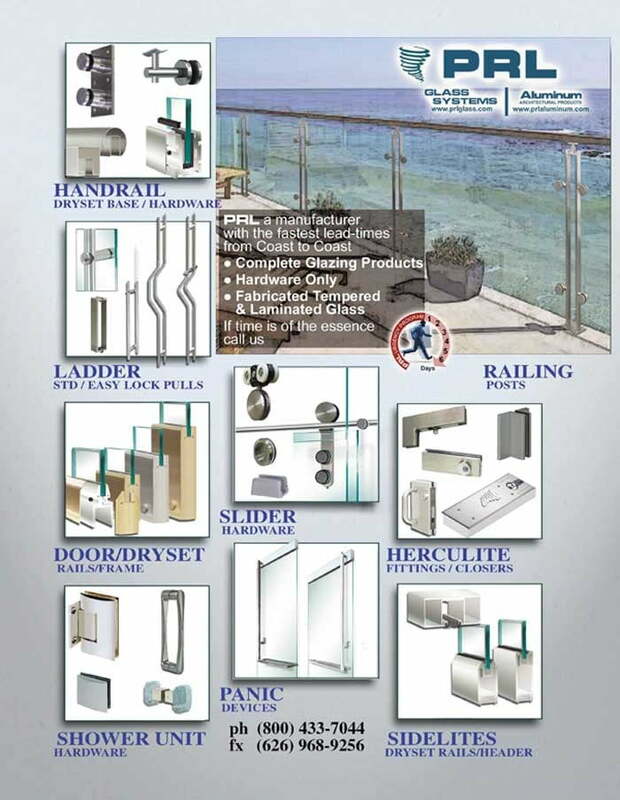 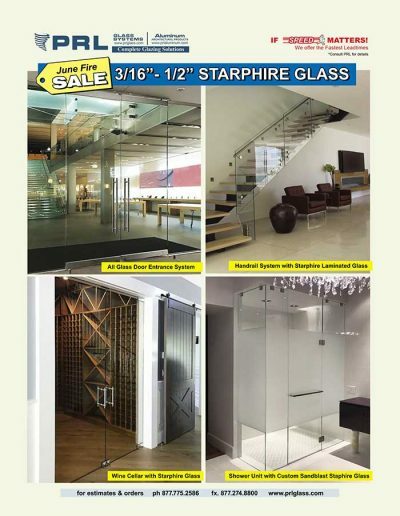 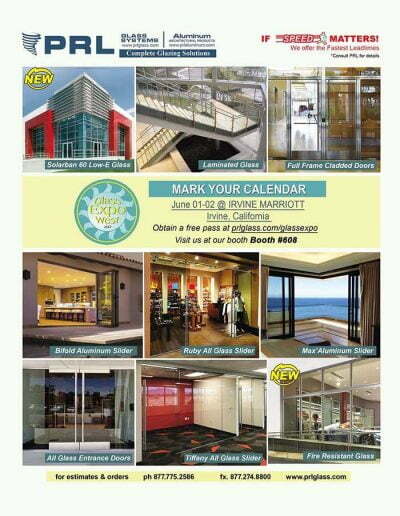 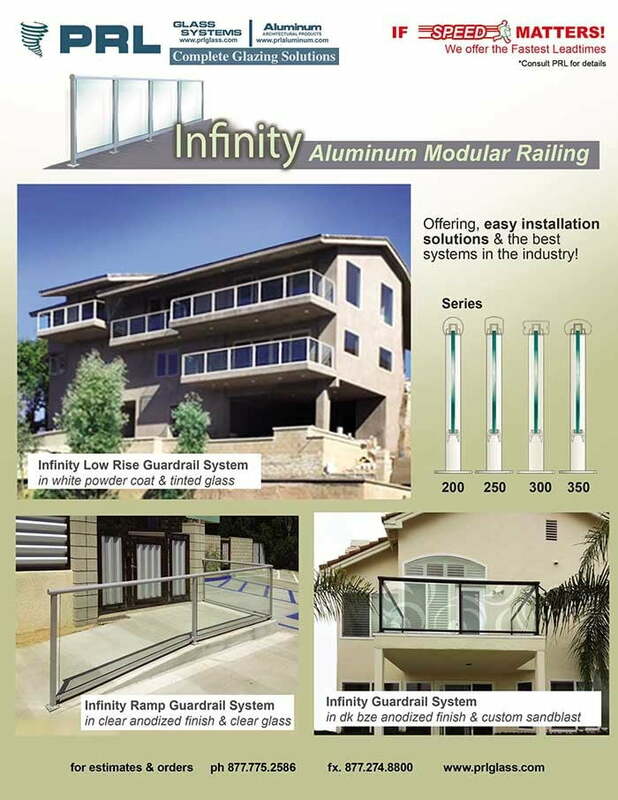 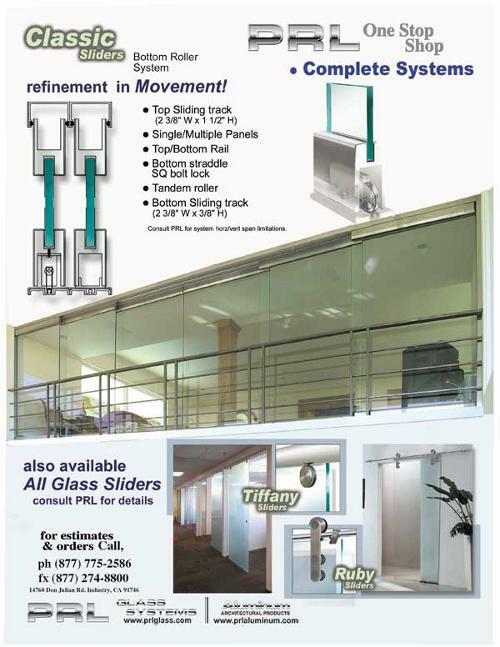 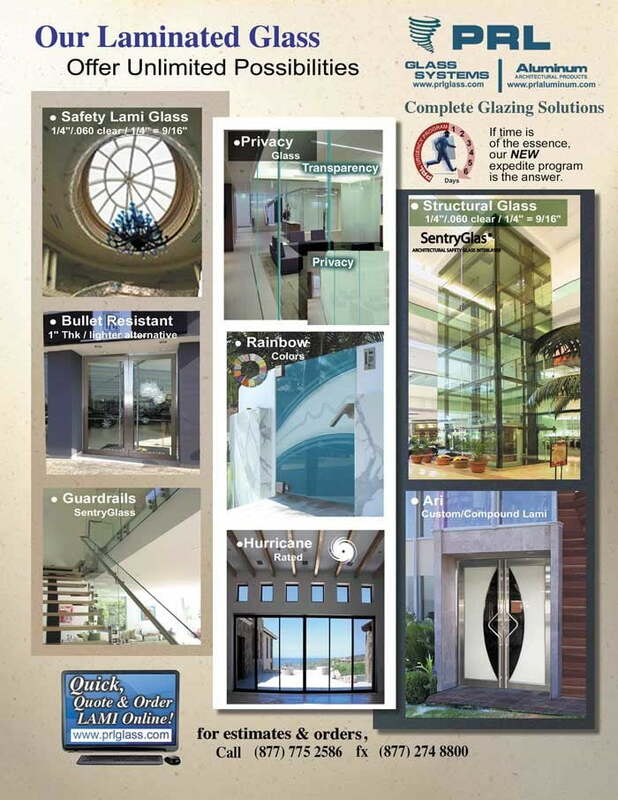 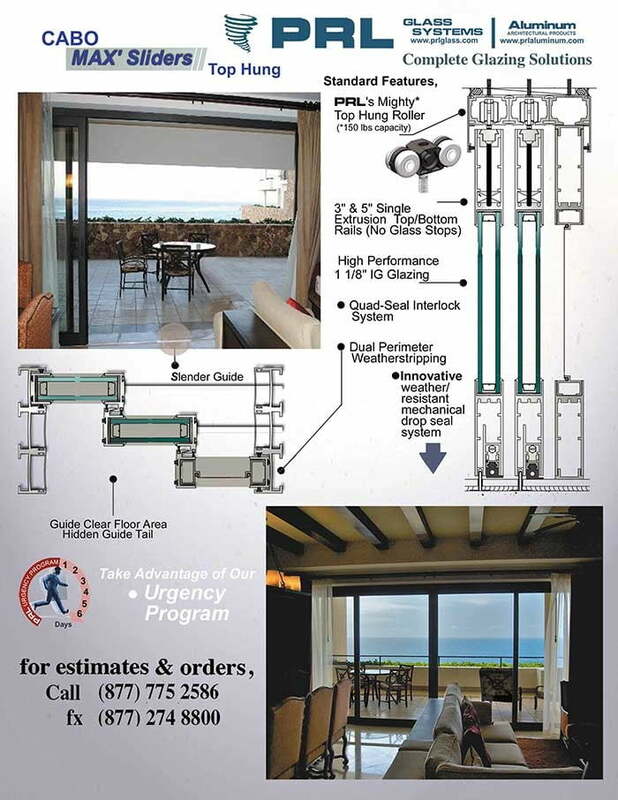 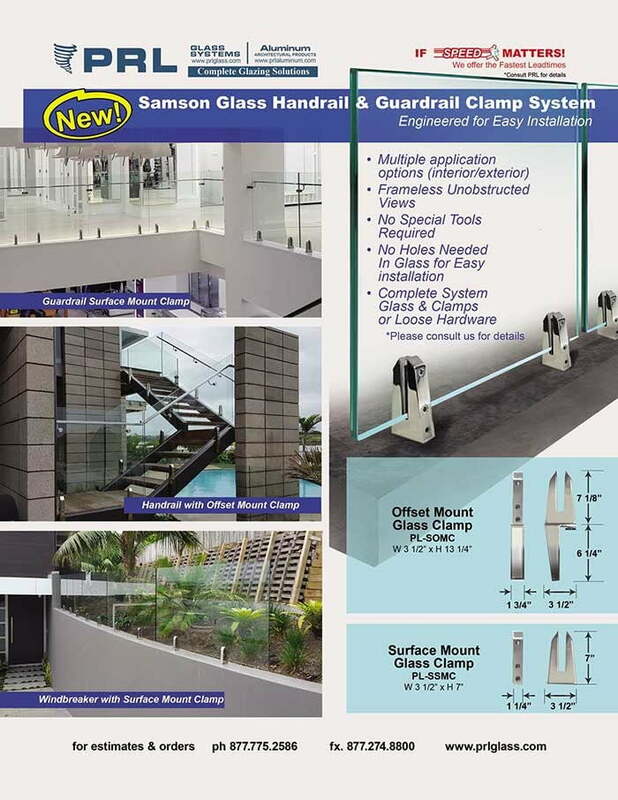 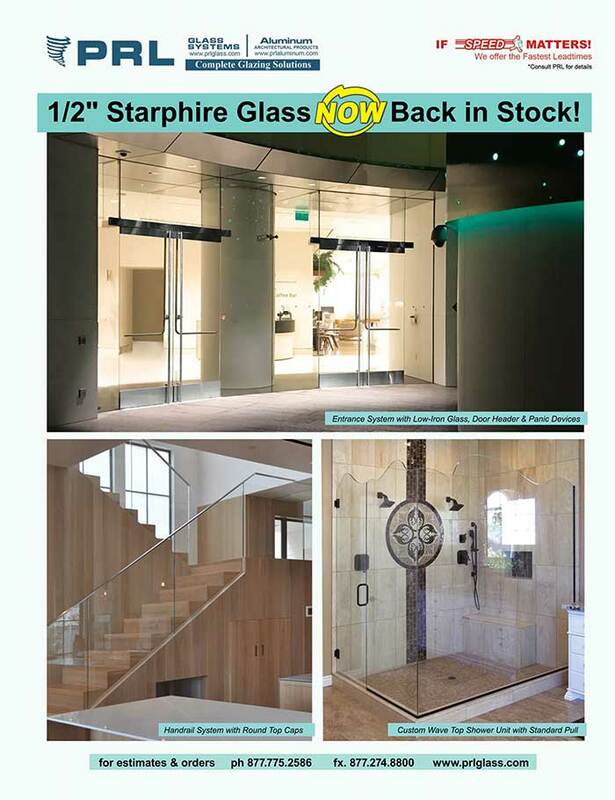 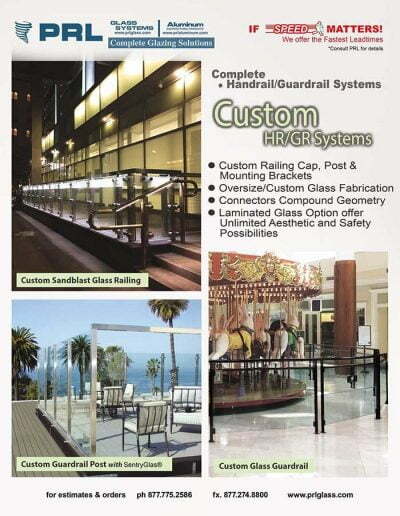 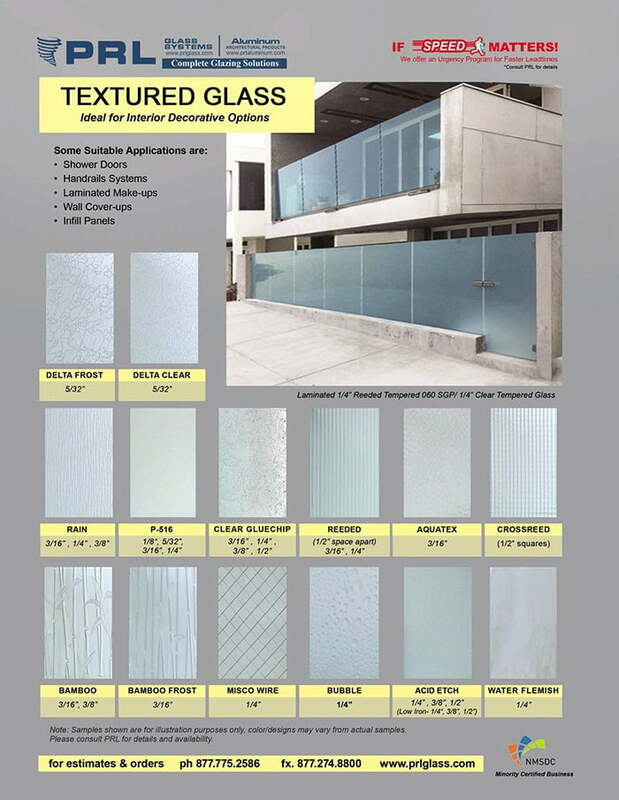 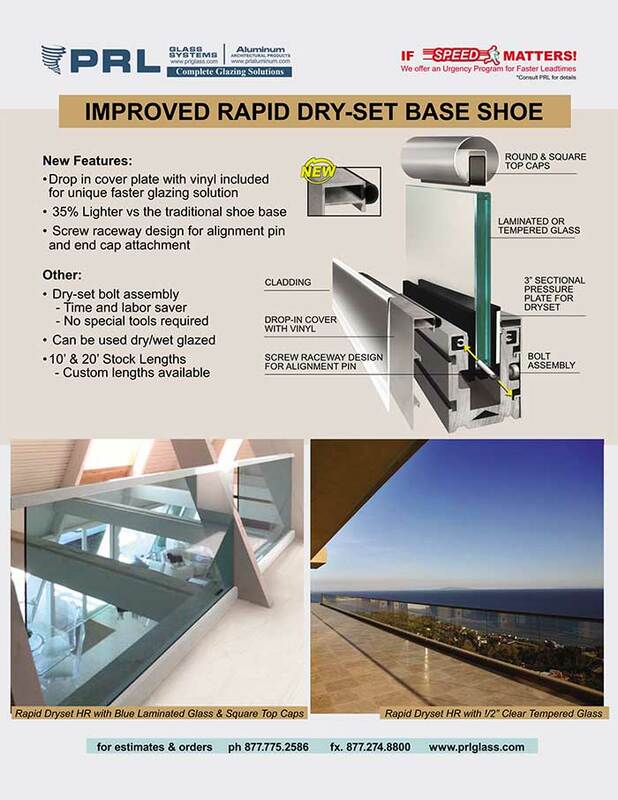 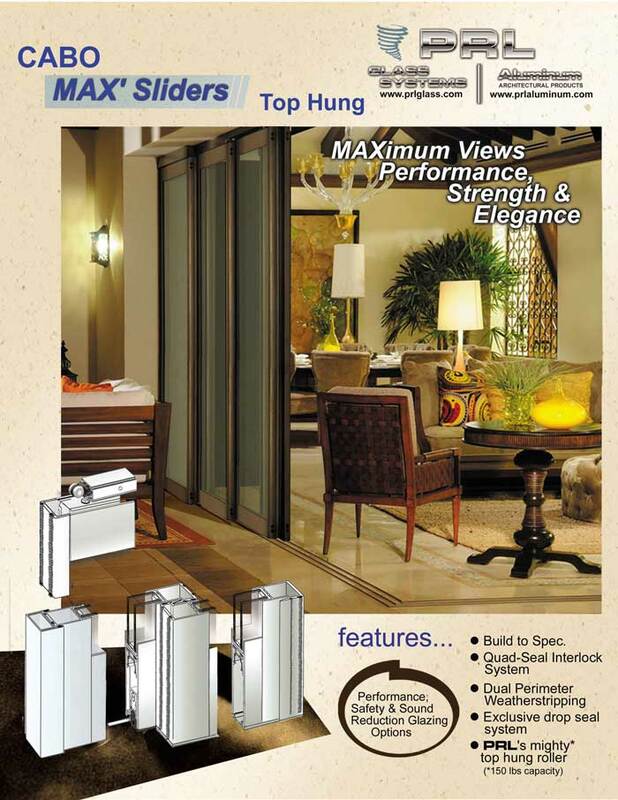 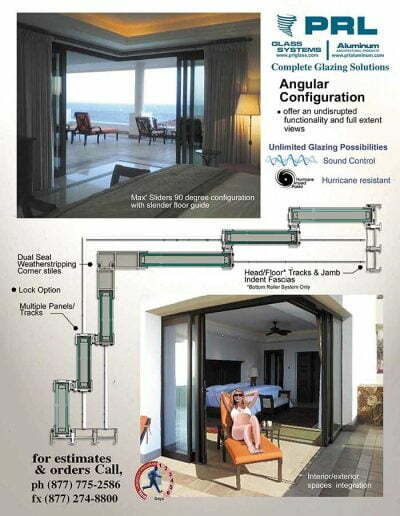 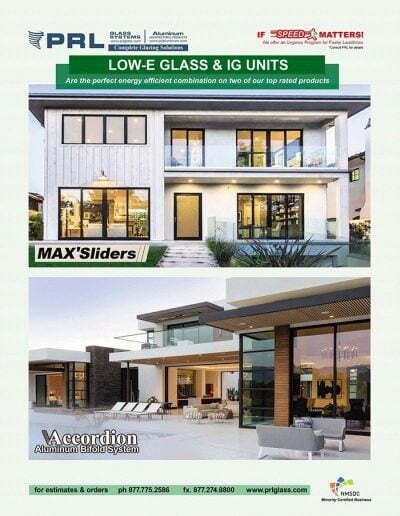 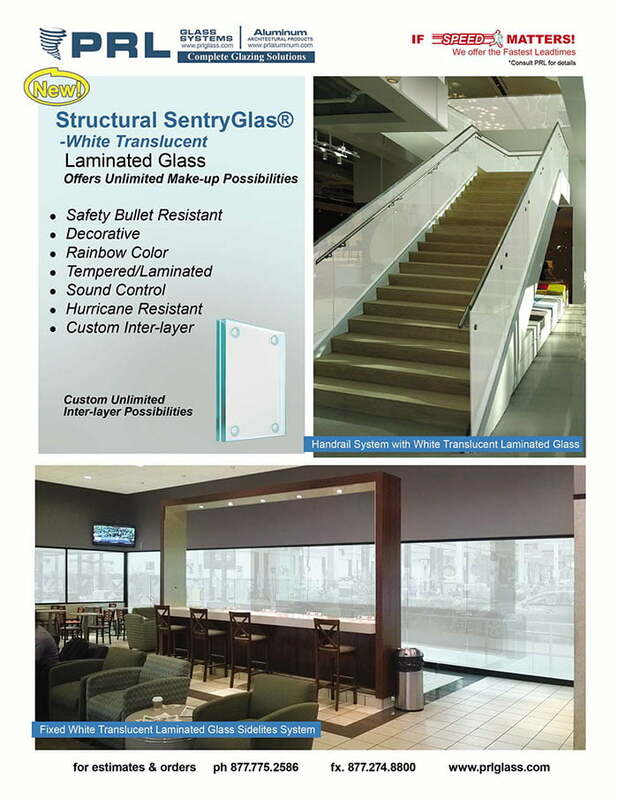 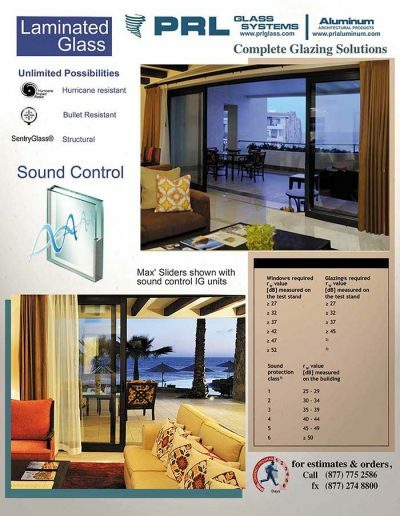 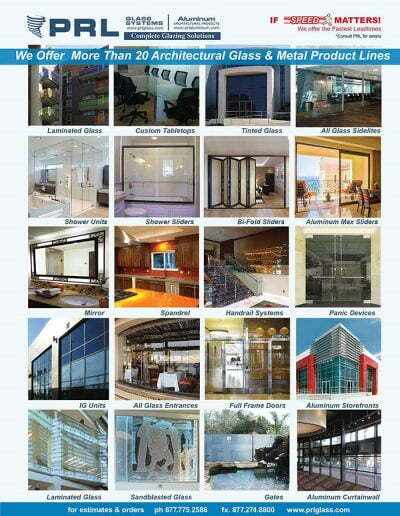 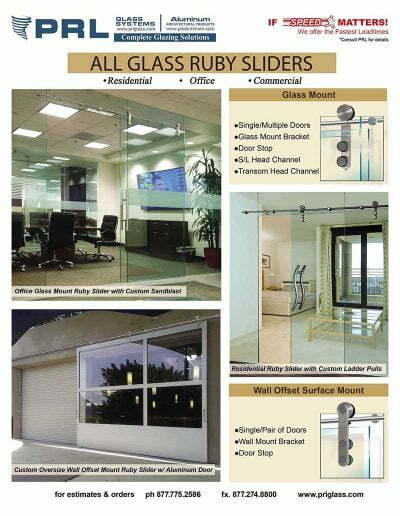 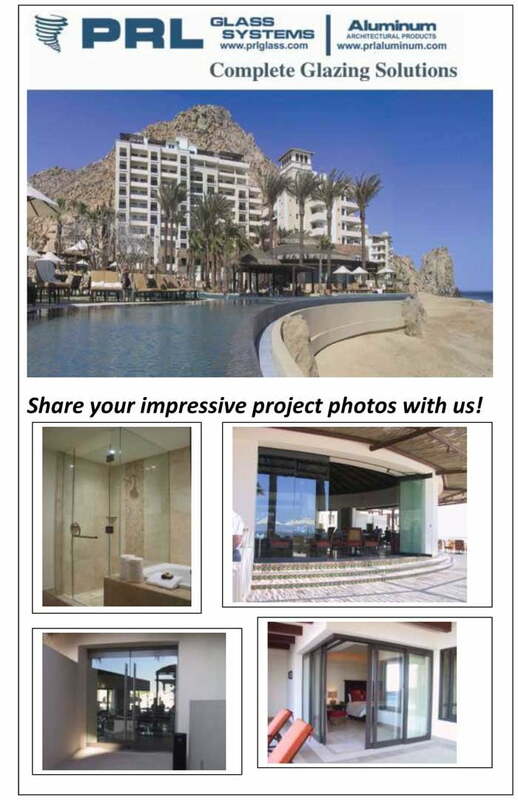 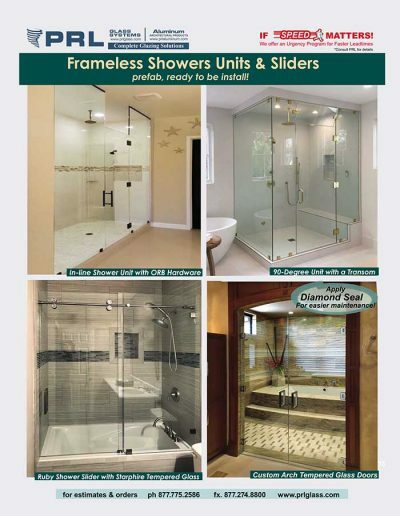 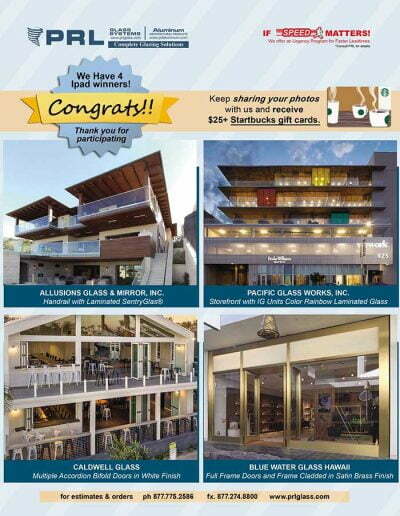 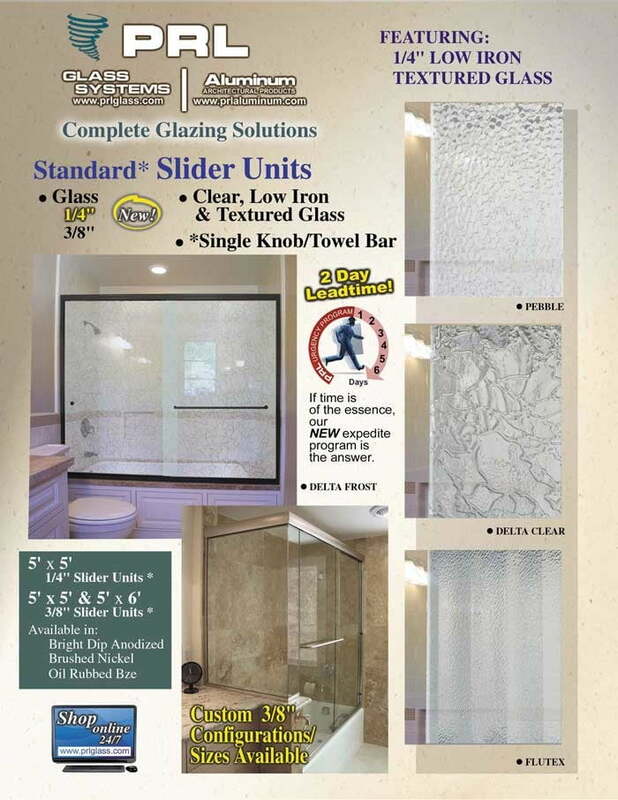 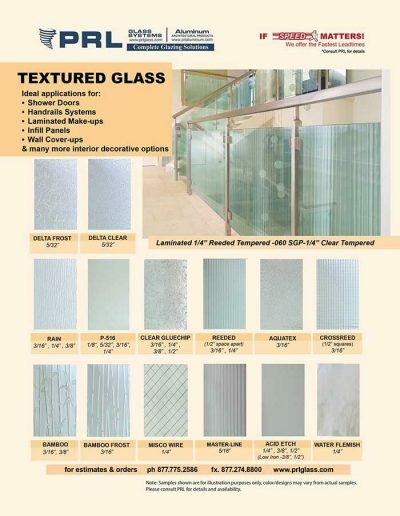 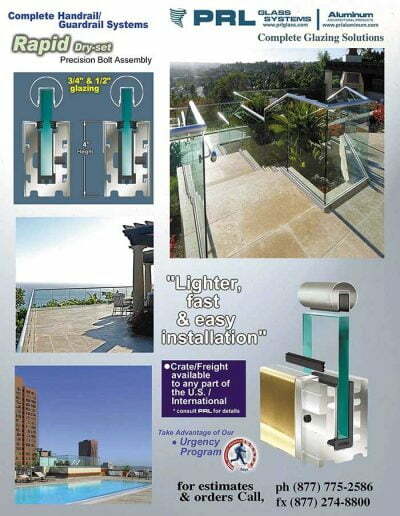 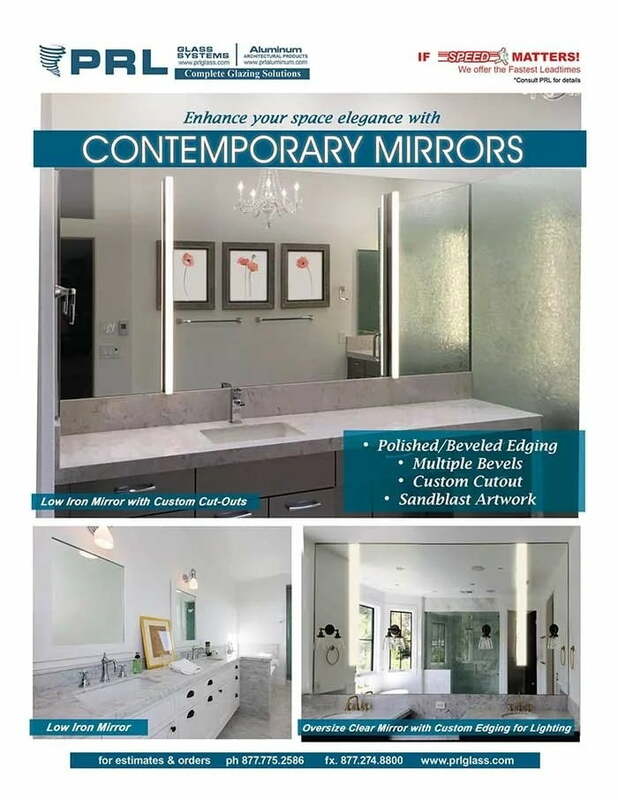 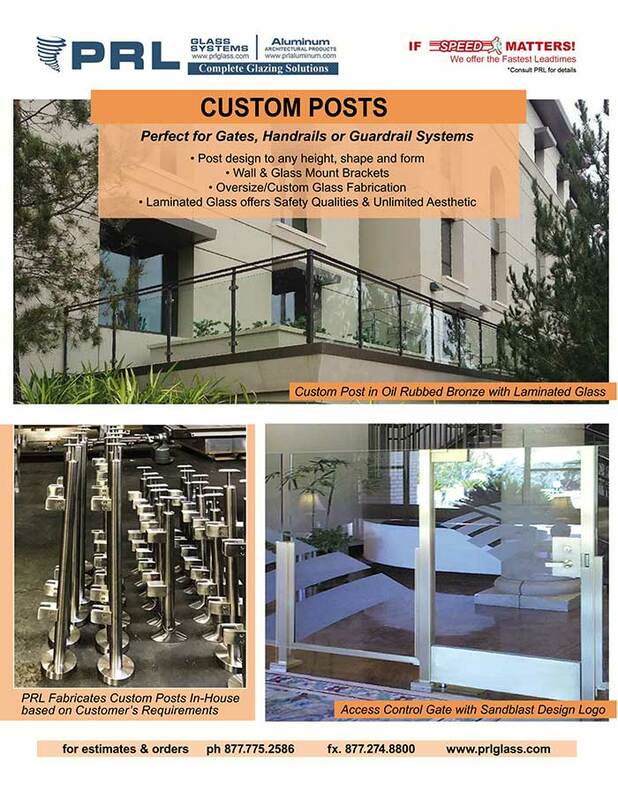 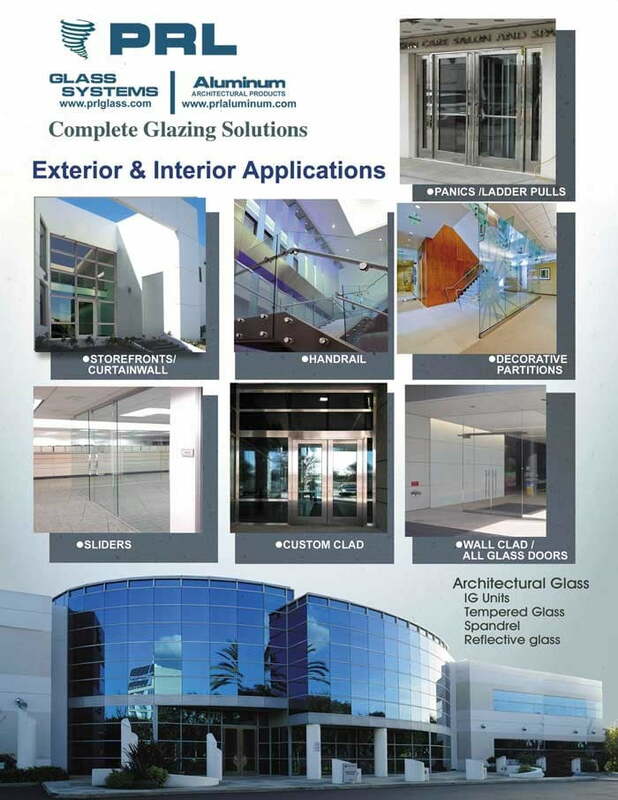 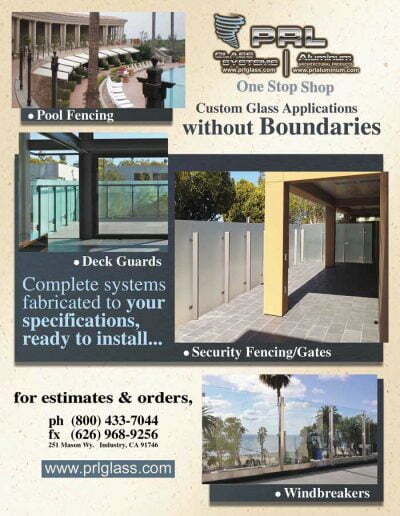 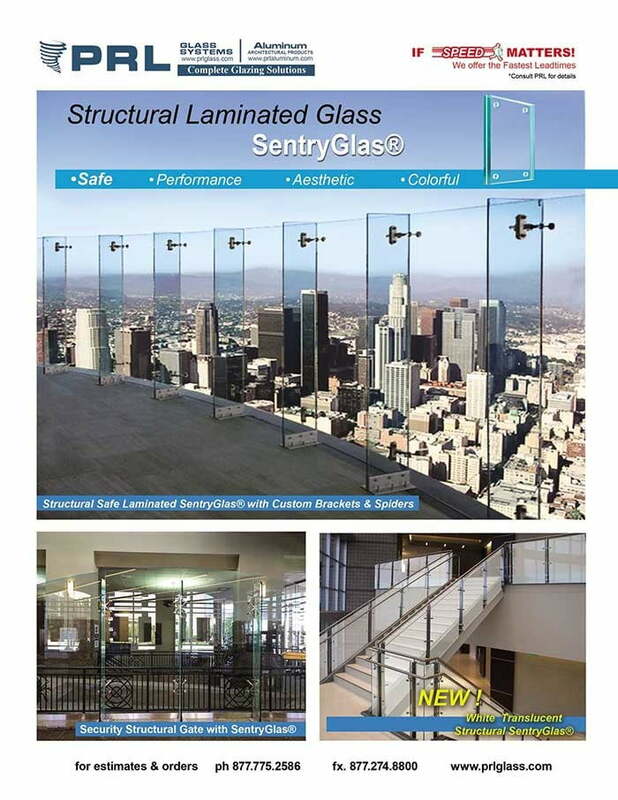 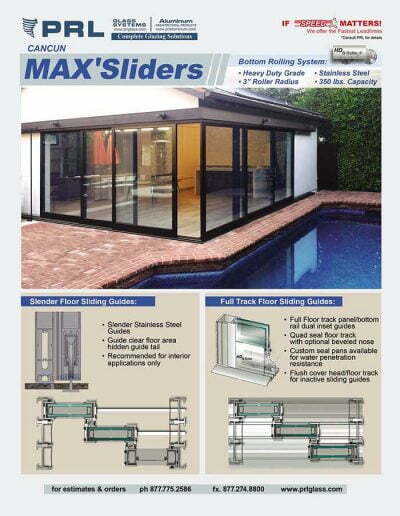 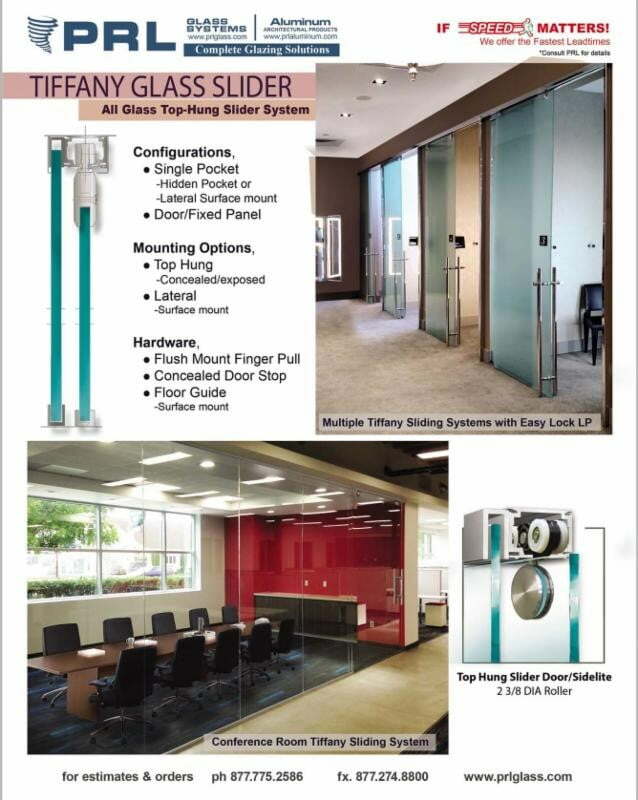 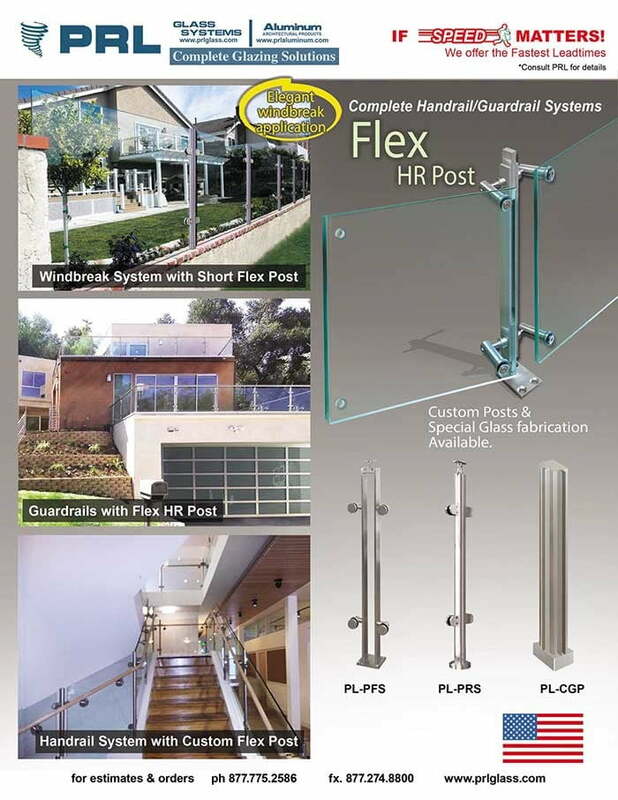 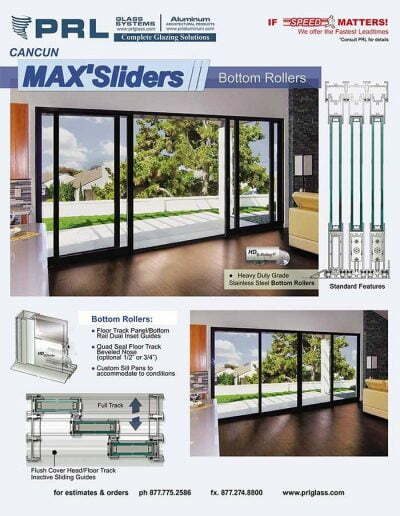 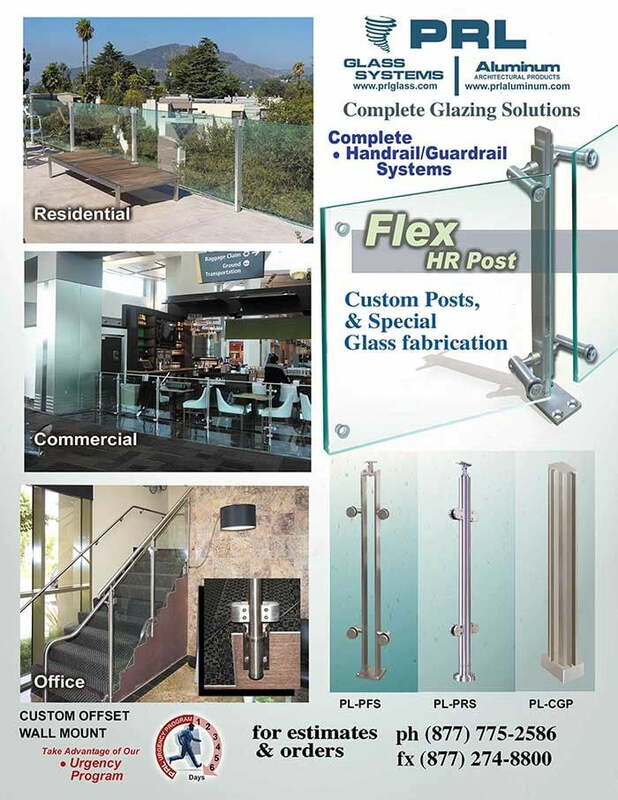 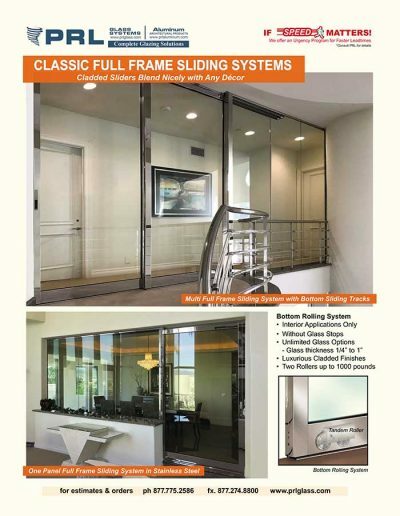 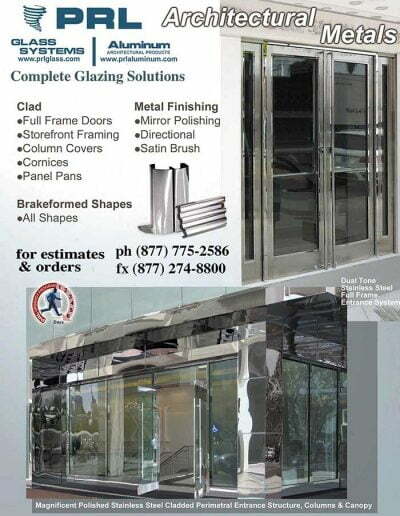 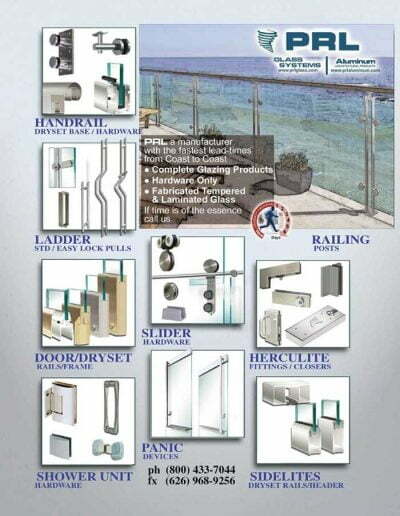 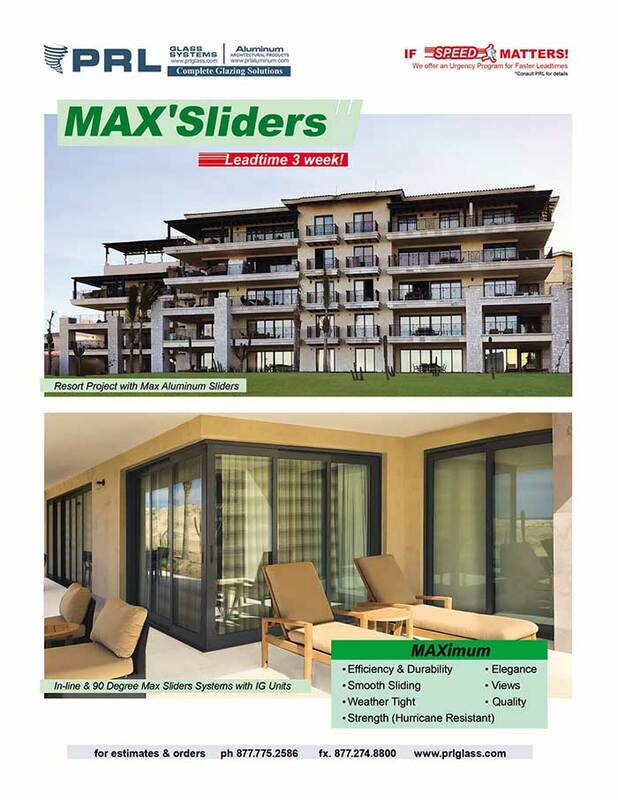 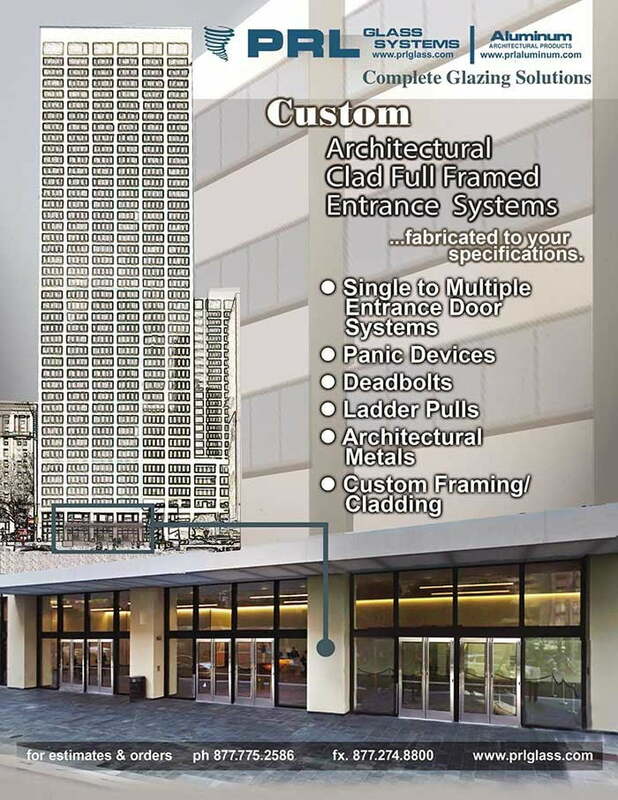 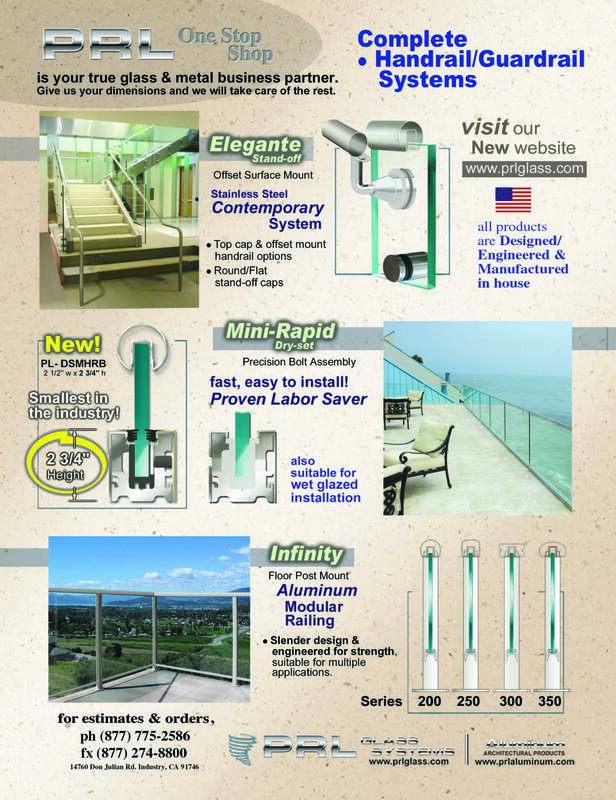 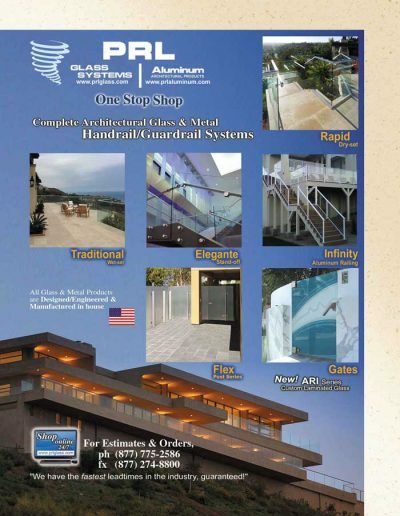 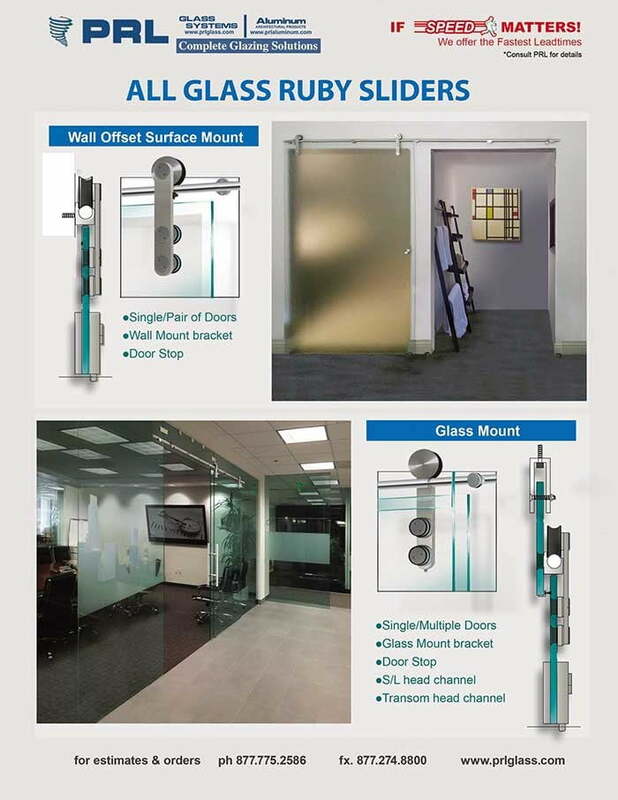 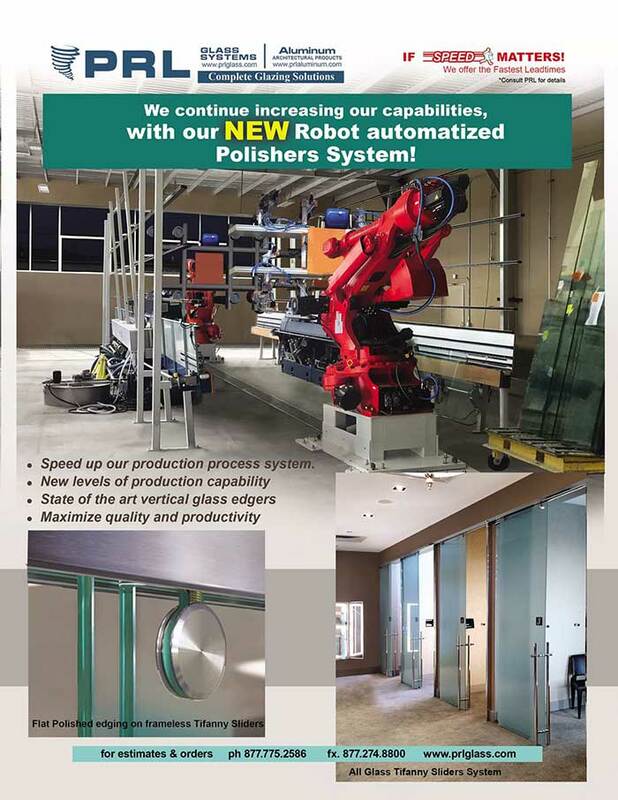 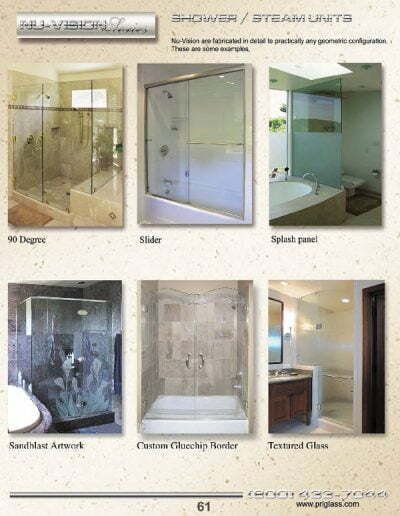 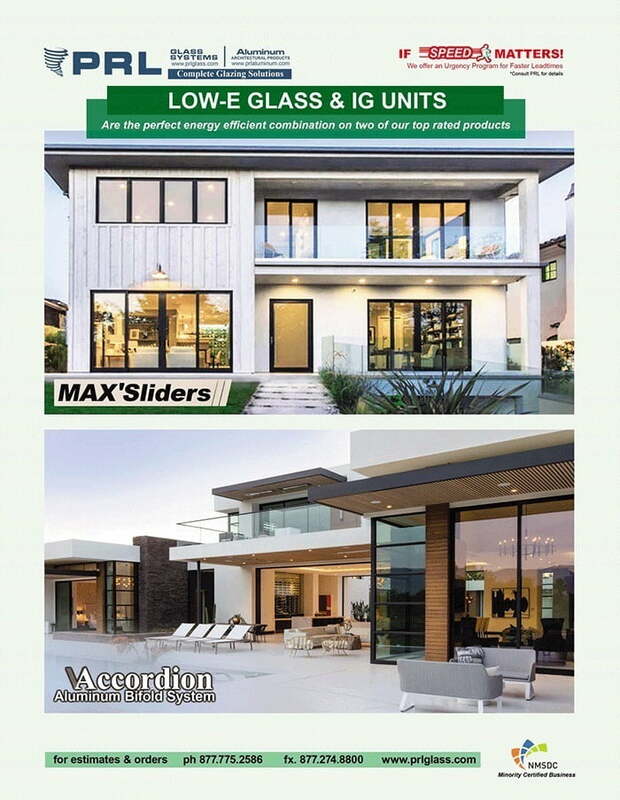 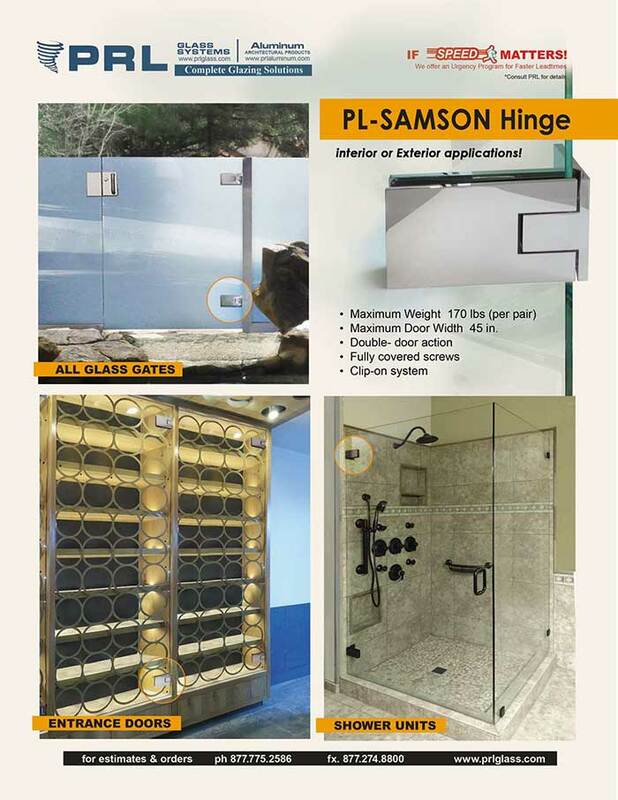 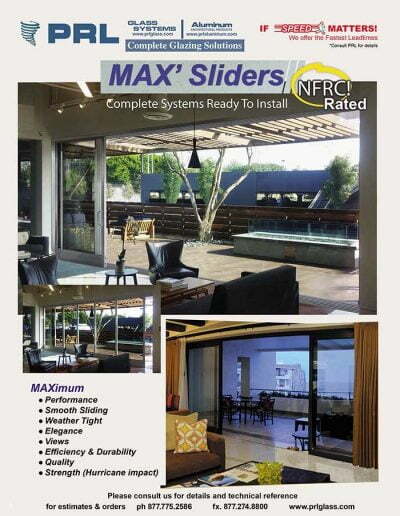 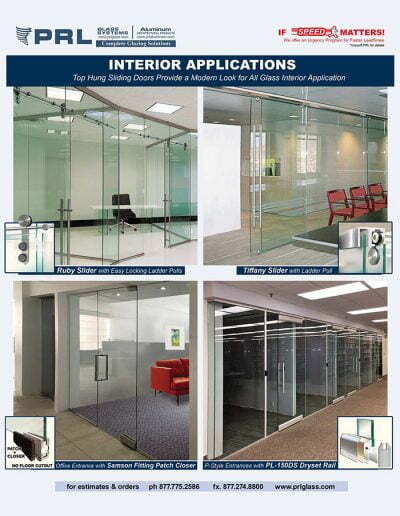 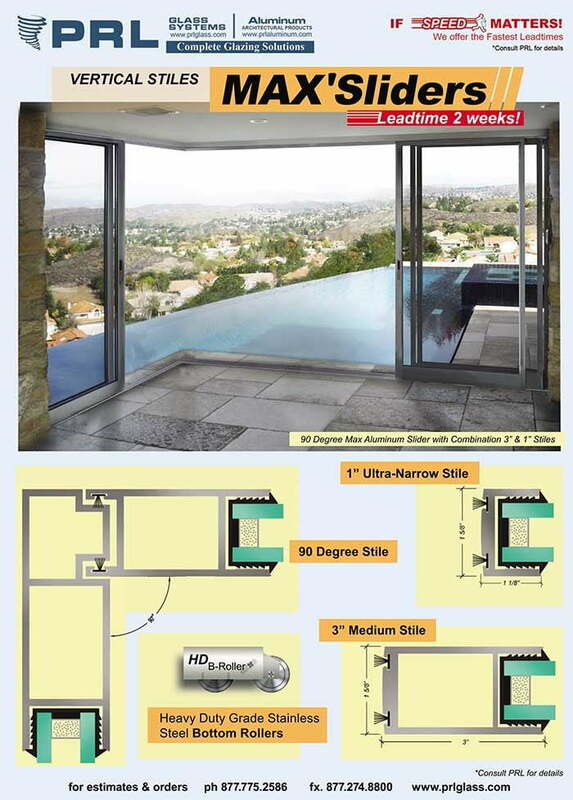 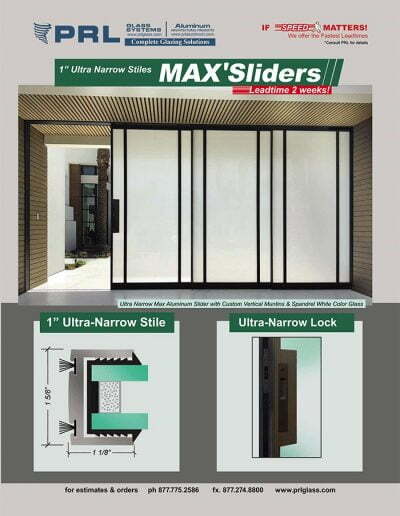 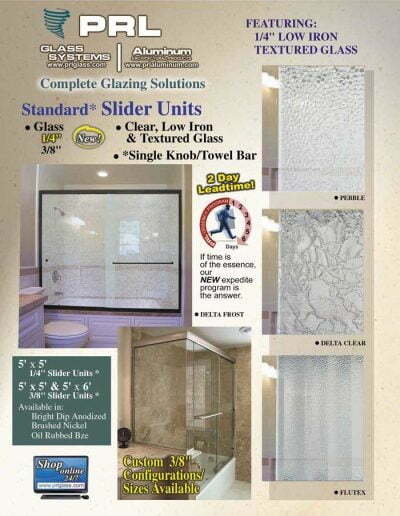 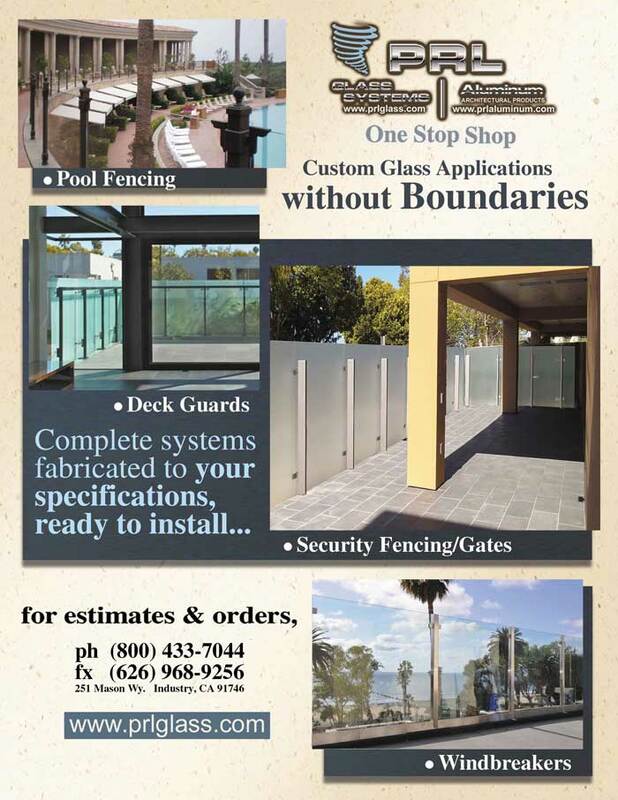 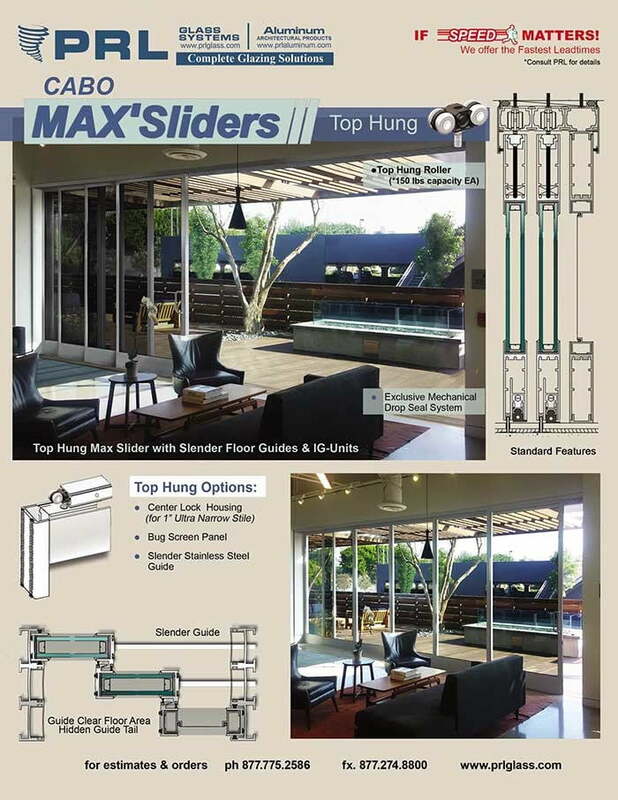 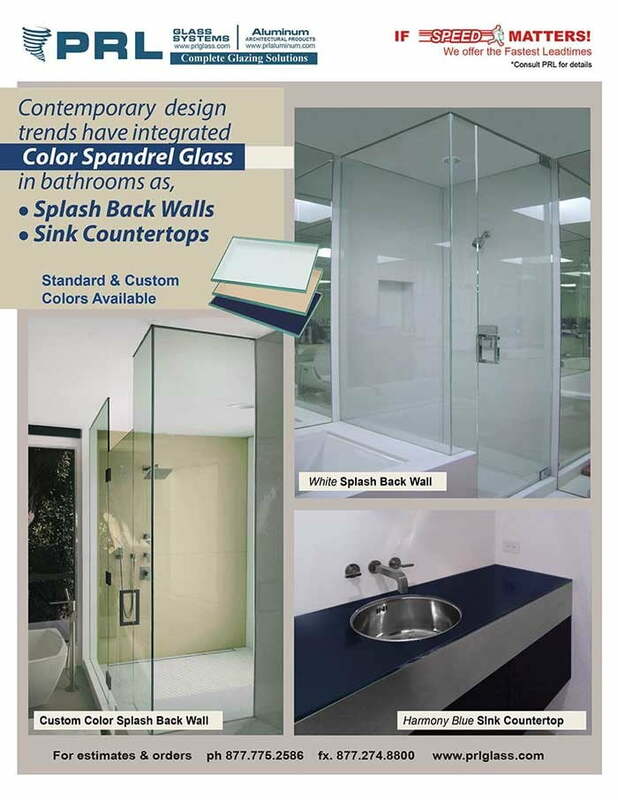 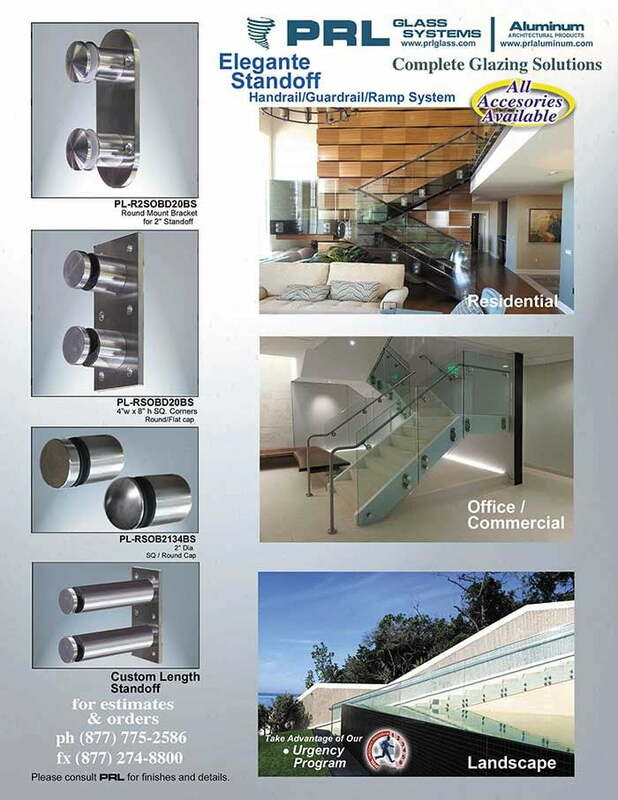 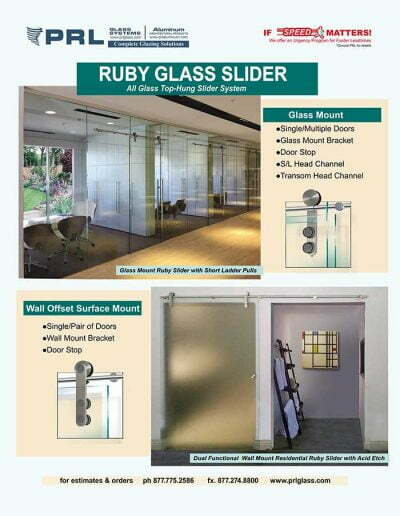 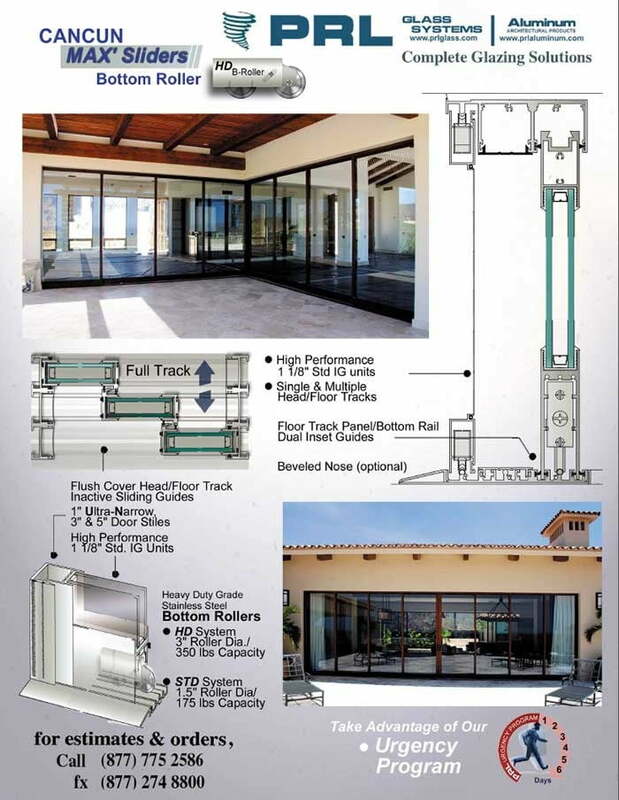 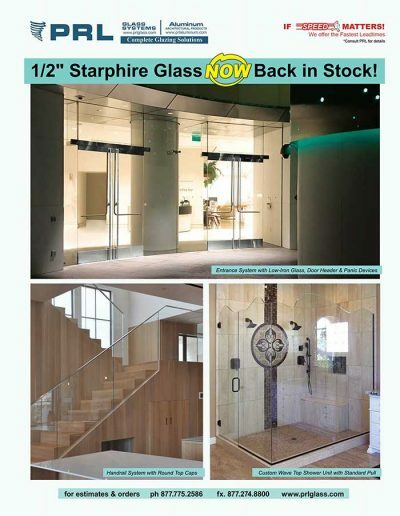 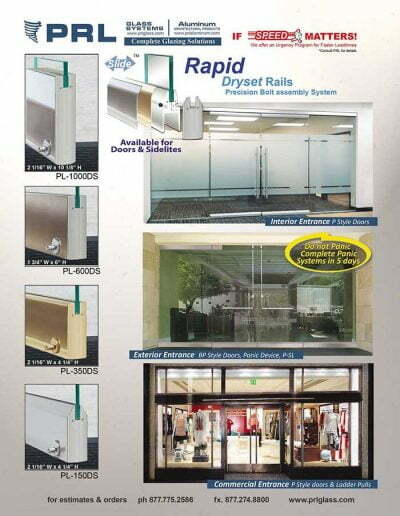 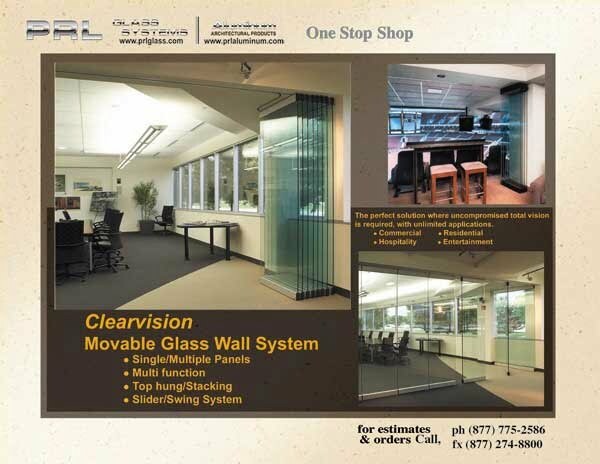 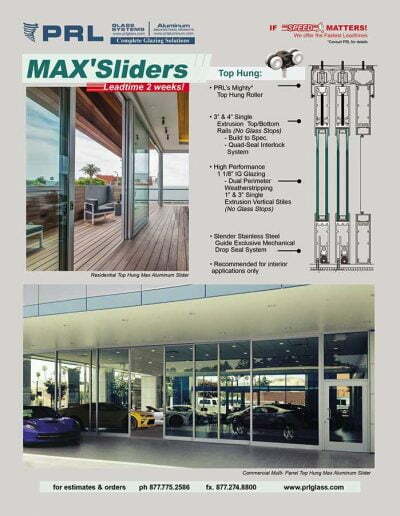 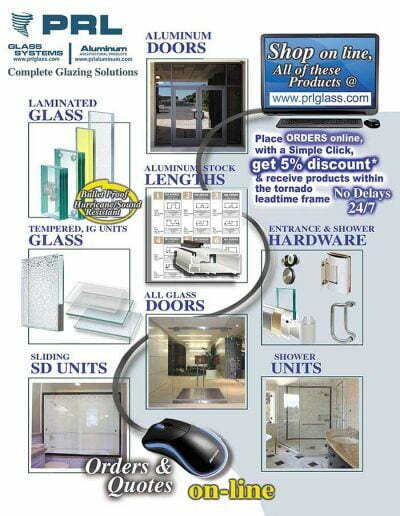 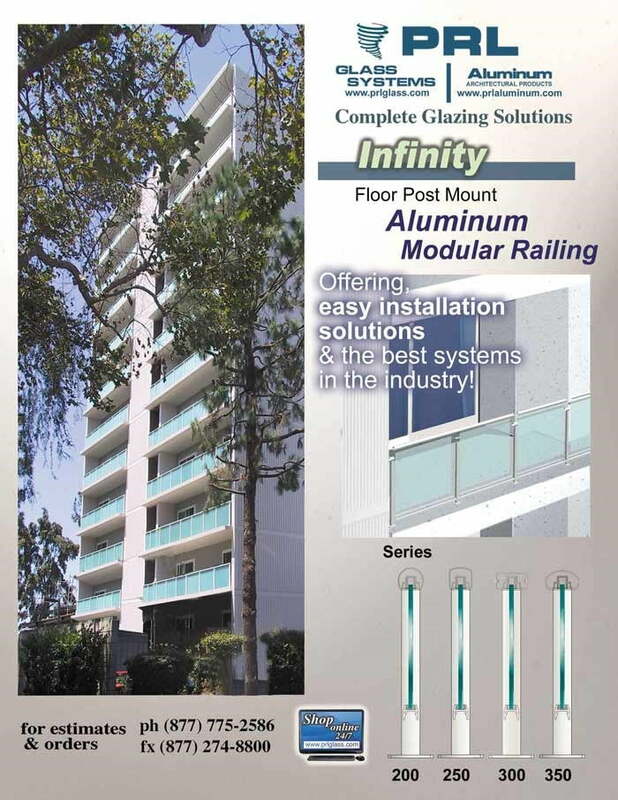 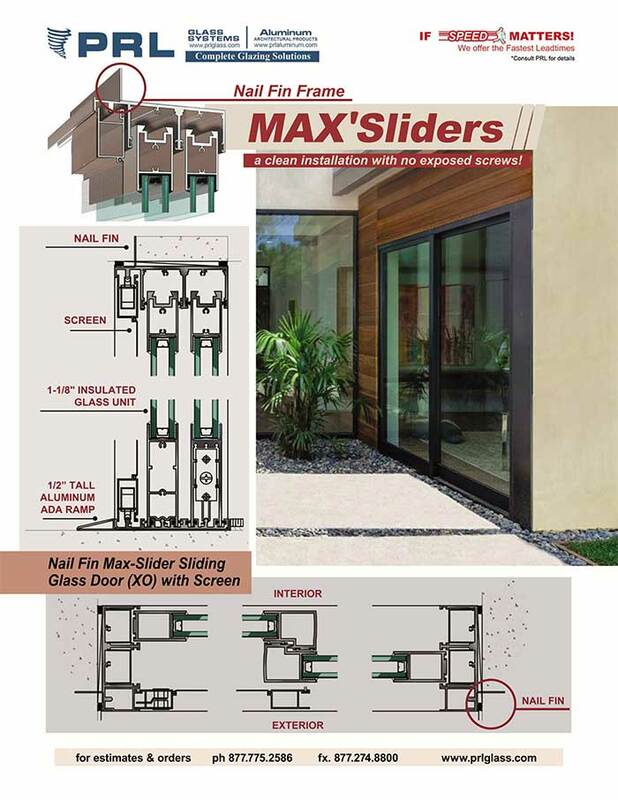 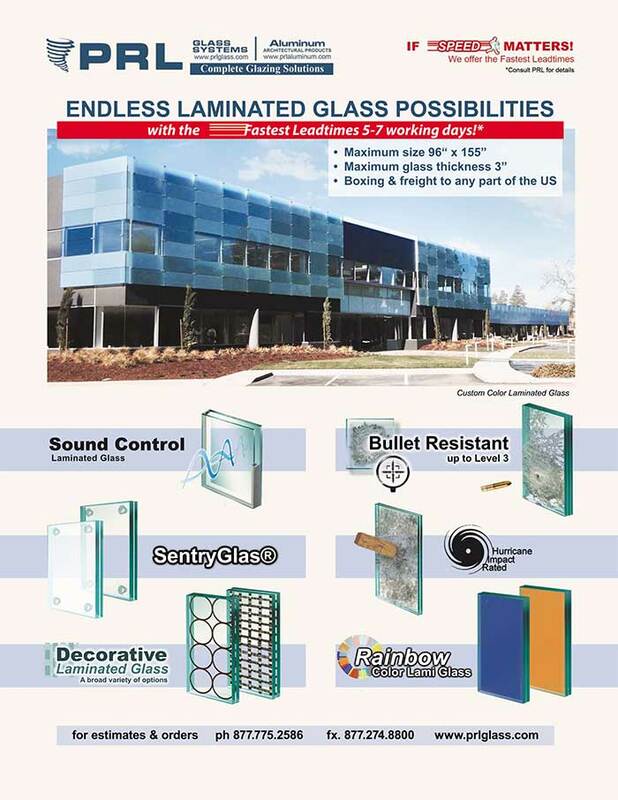 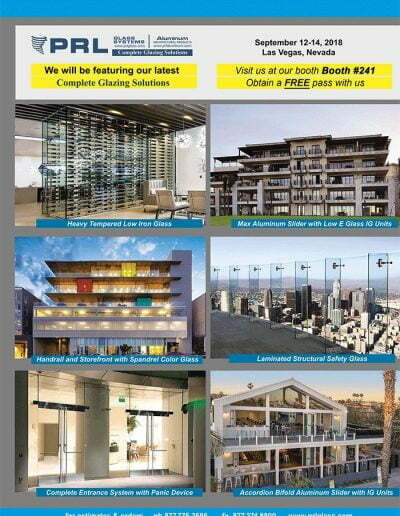 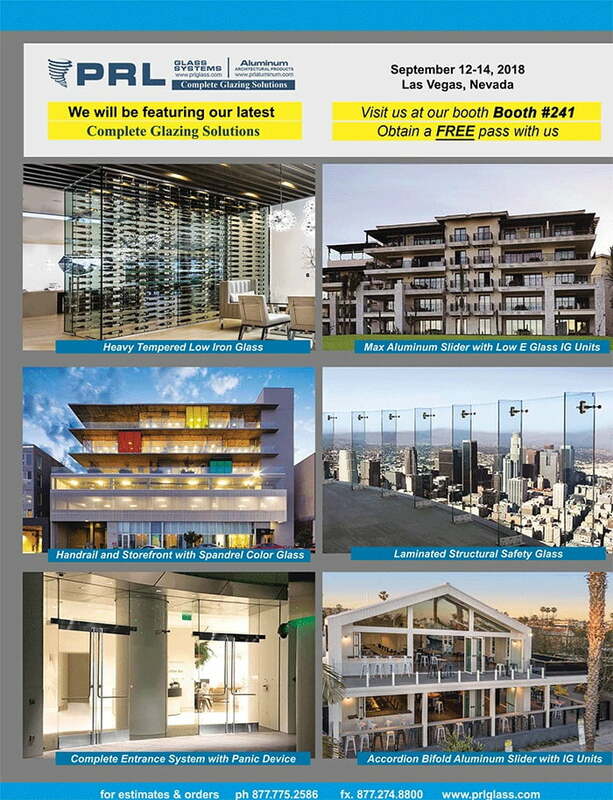 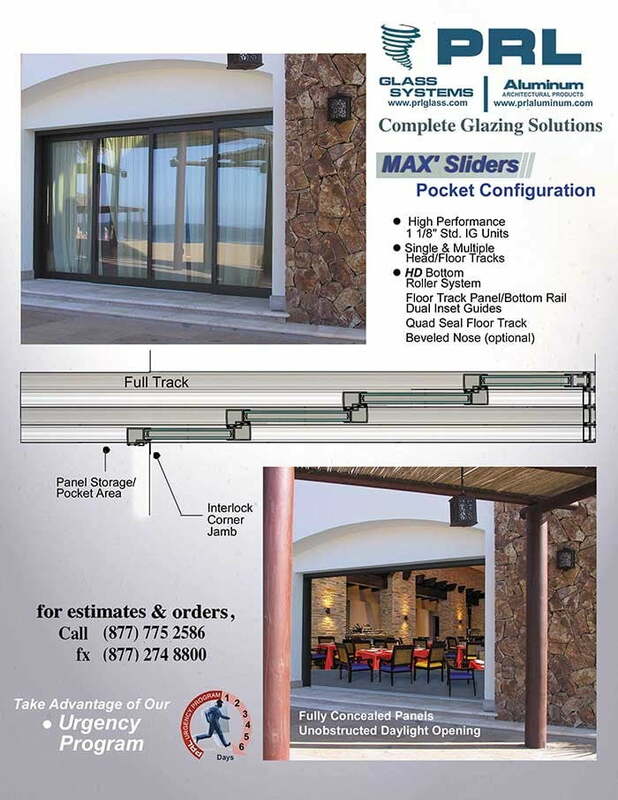 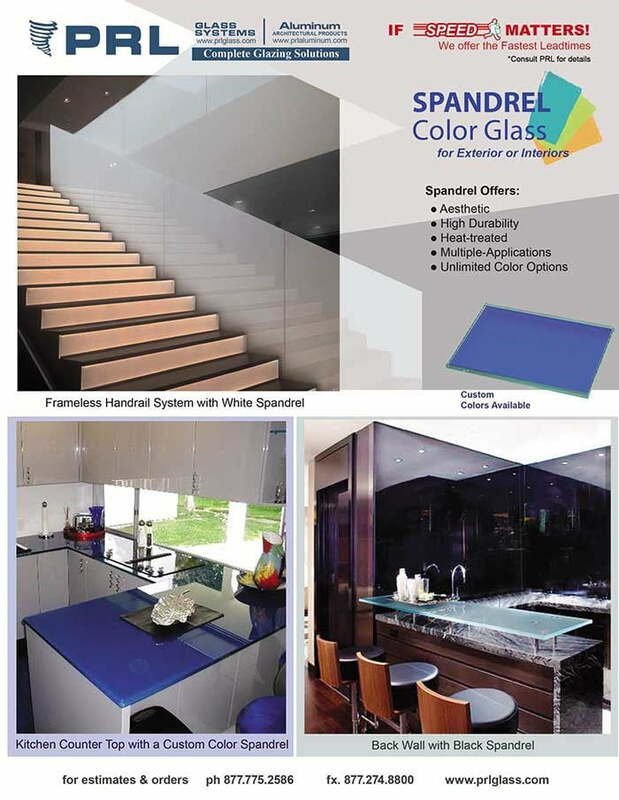 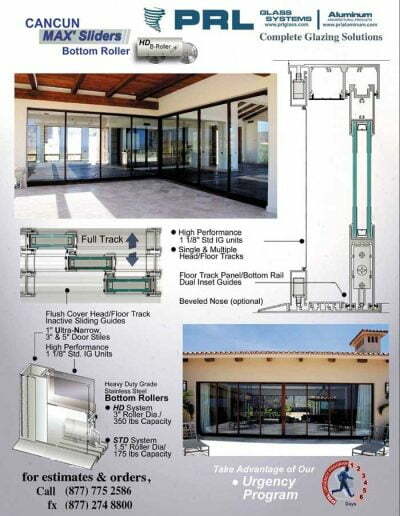 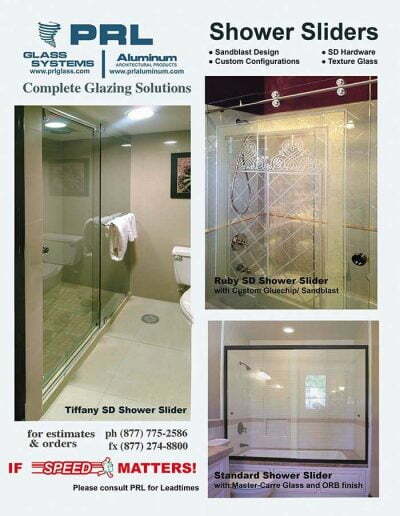 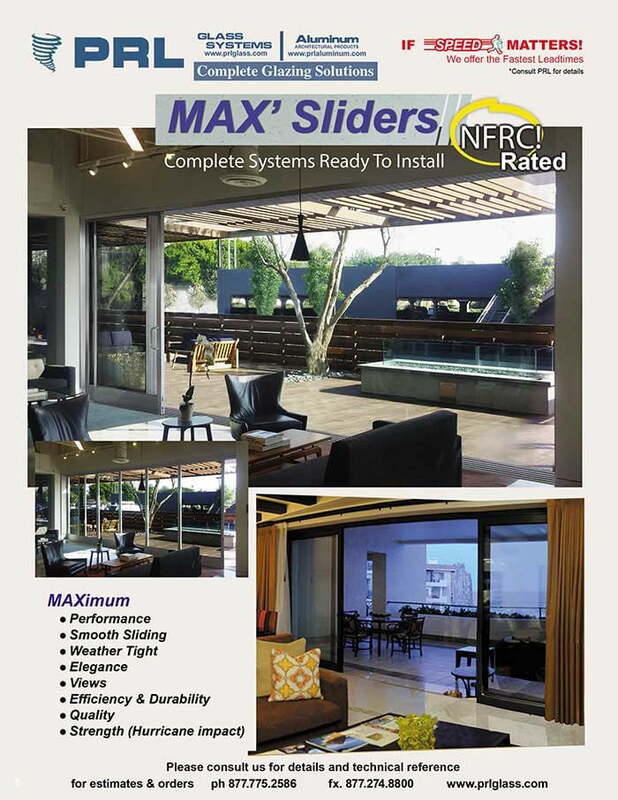 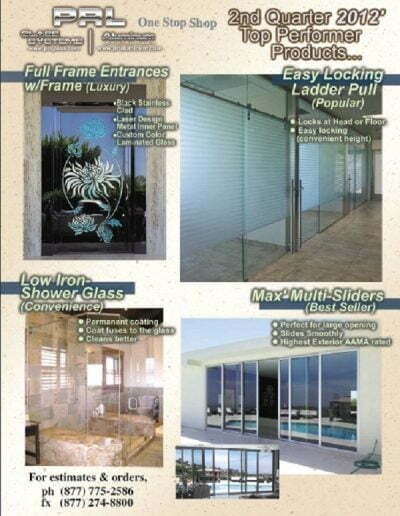 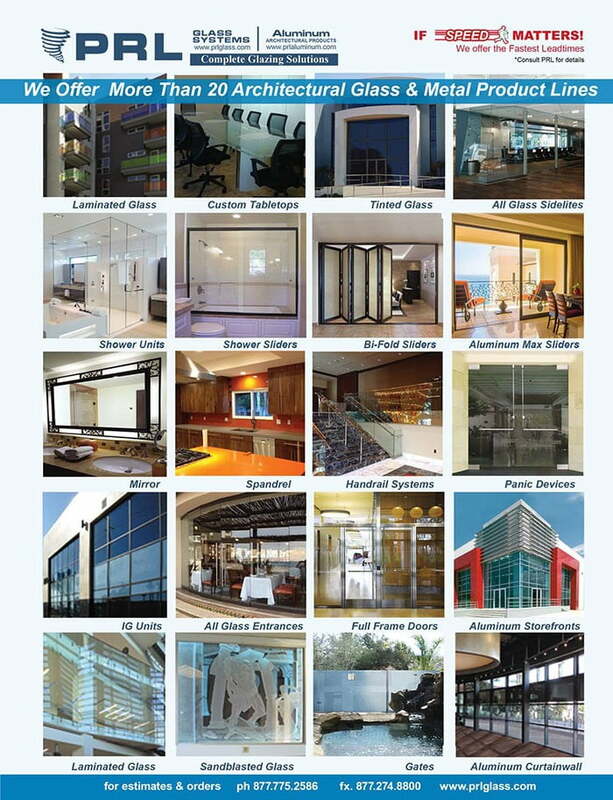 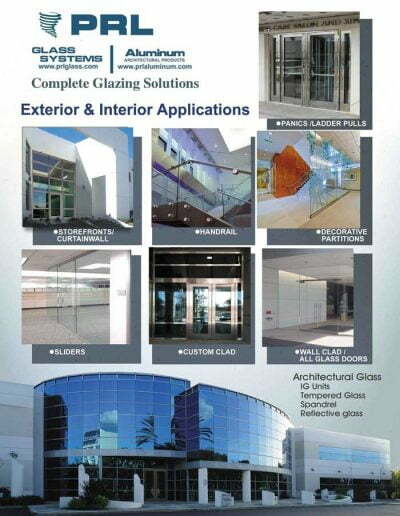 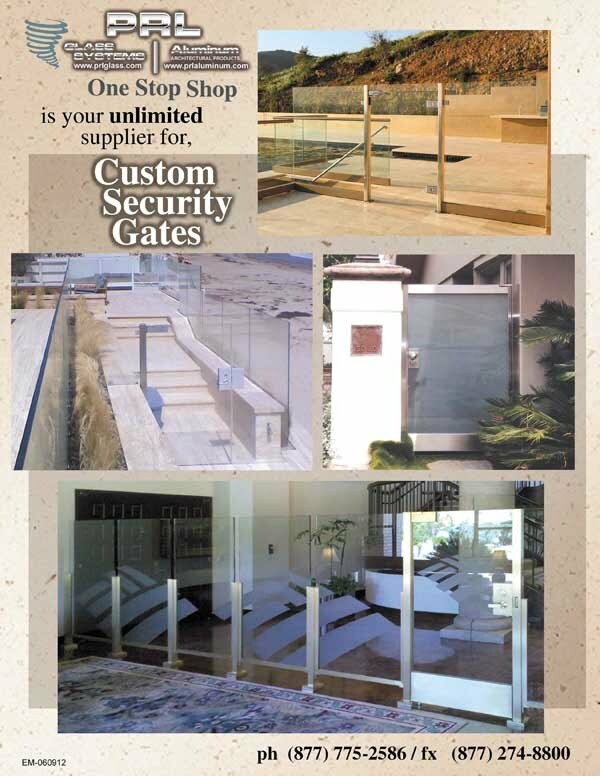 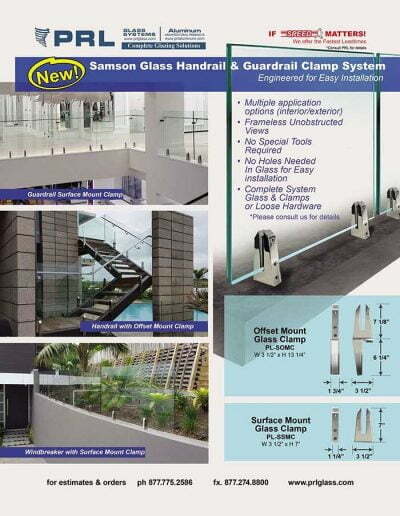 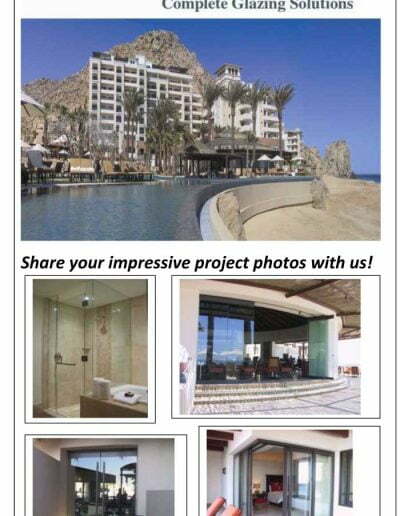 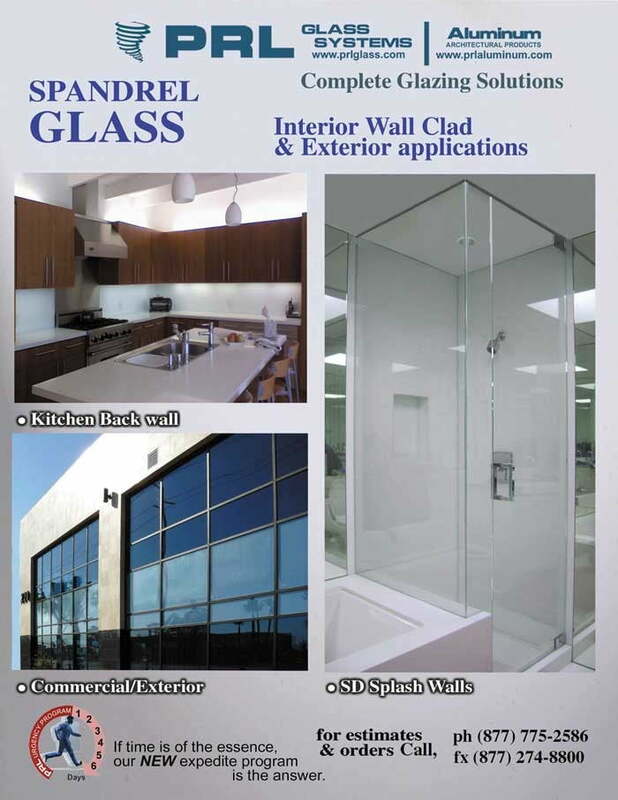 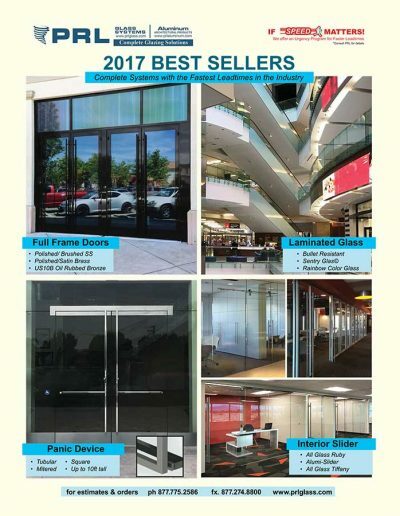 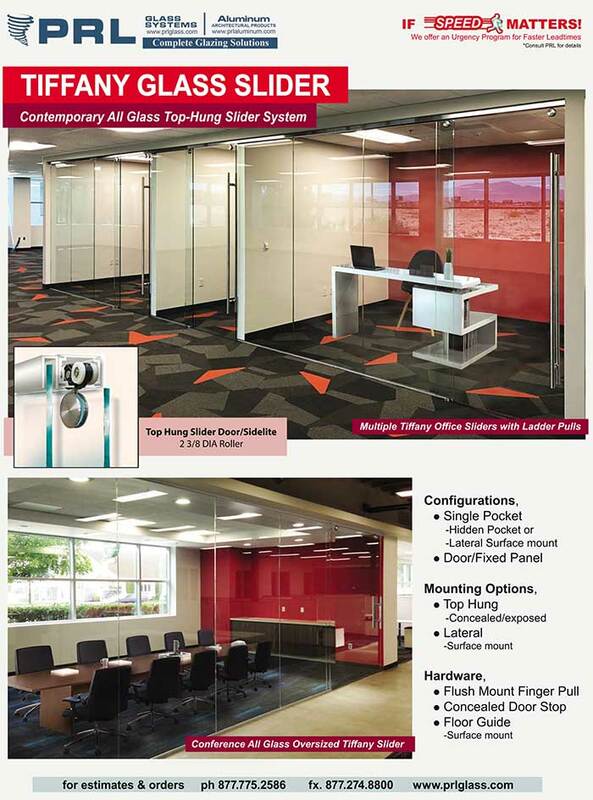 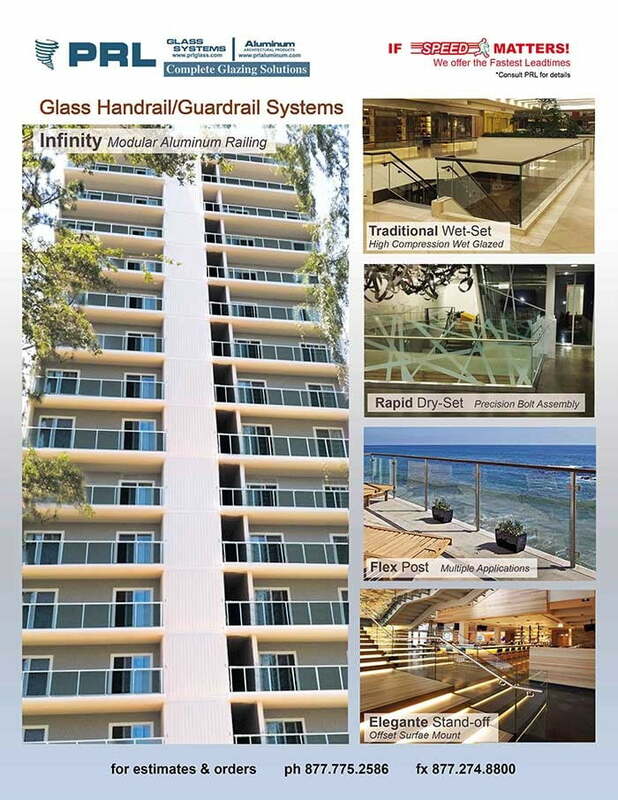 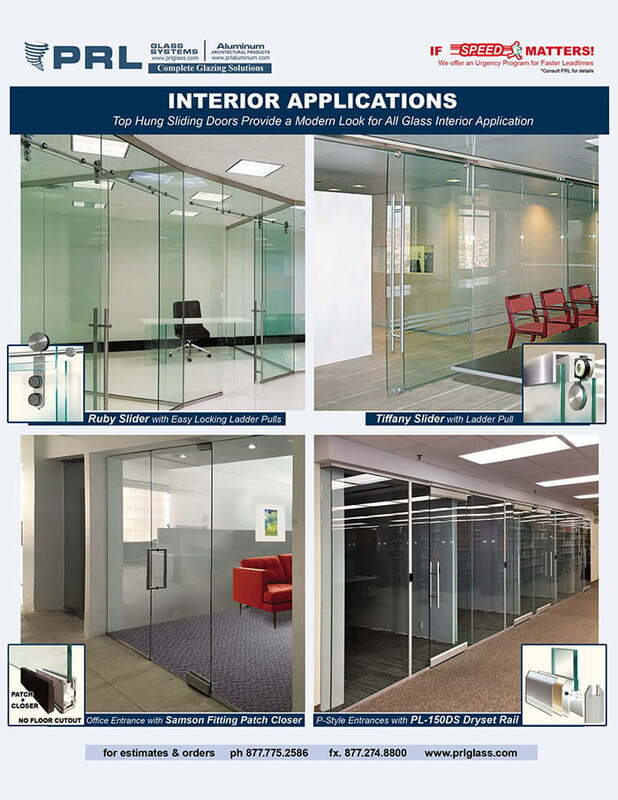 You can choose from our wide variety of glass and aluminum storefront systems and product lines such as aluminum doors, all glass doors, mall front sliders, glass curtain wall systems, Cancun bottom rolling or Cabo top hung exterior sliding doors and handrail systems. 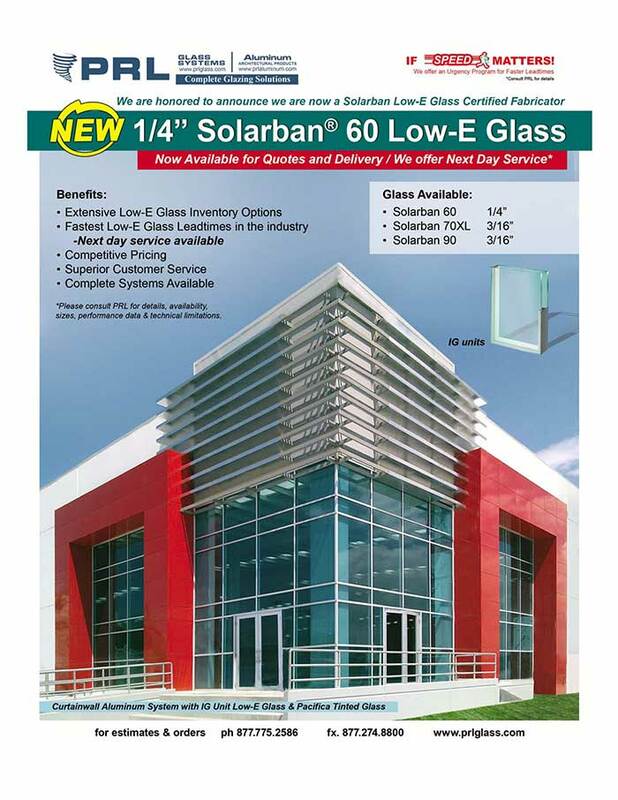 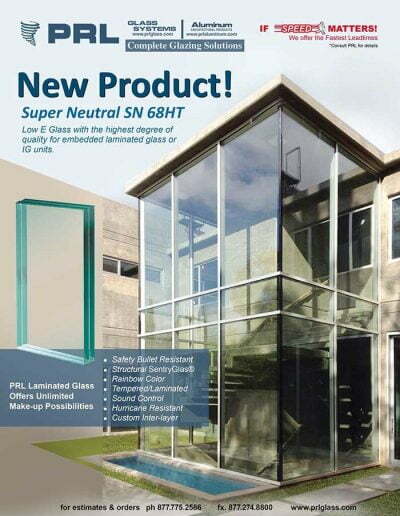 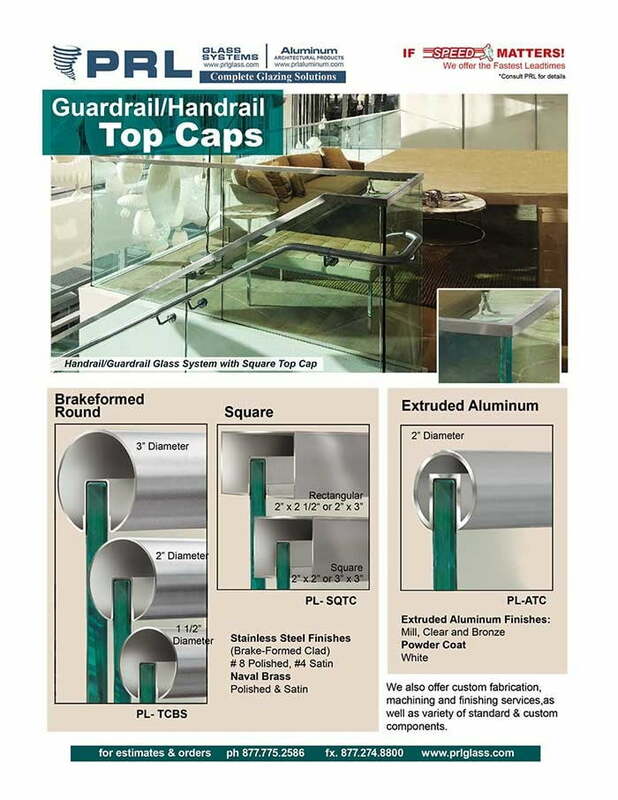 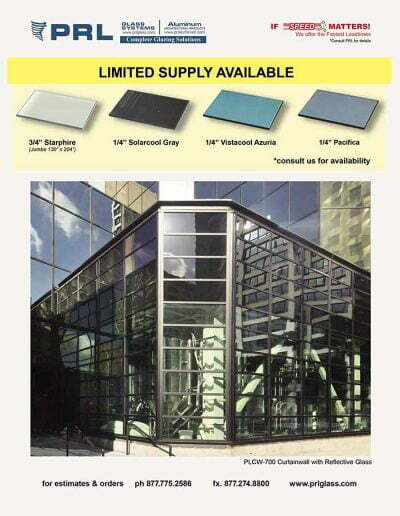 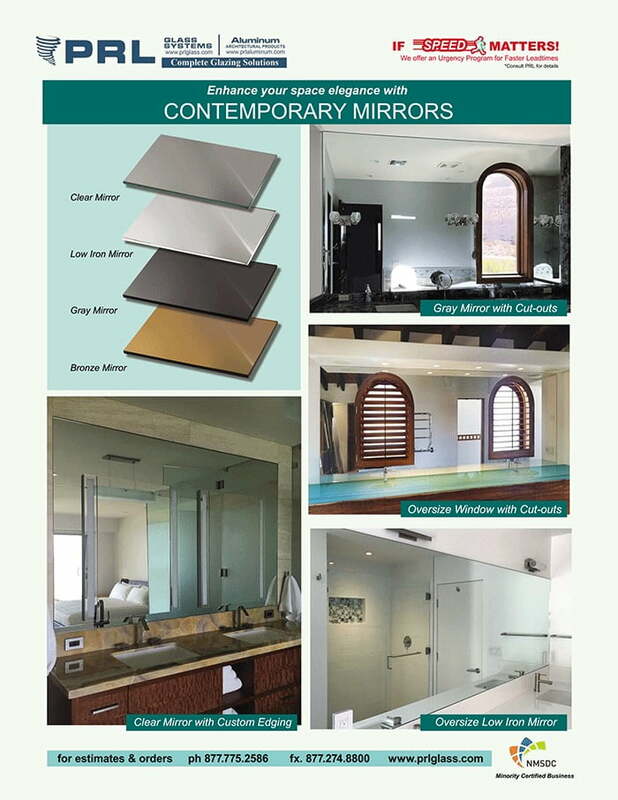 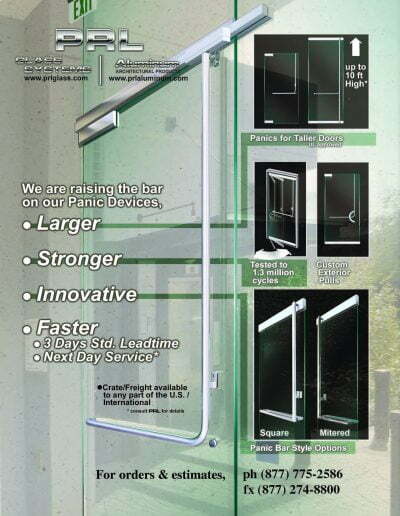 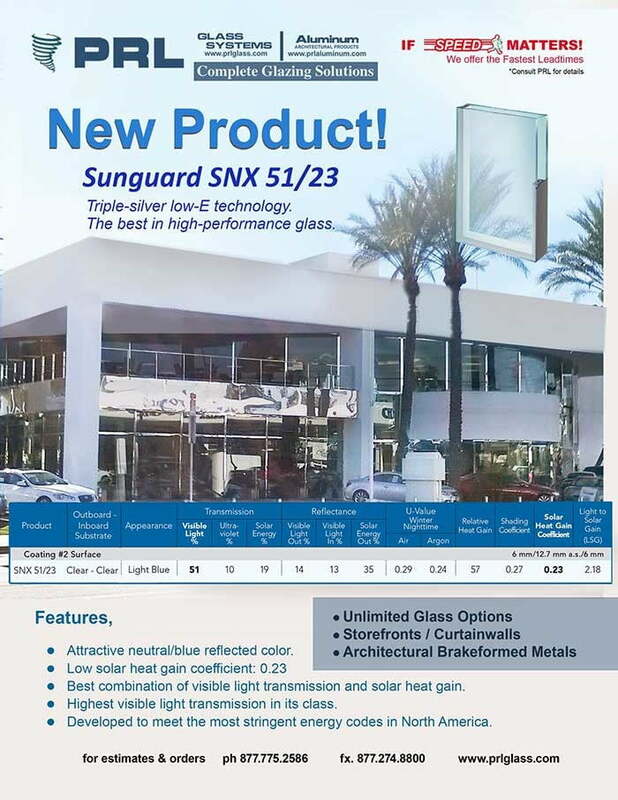 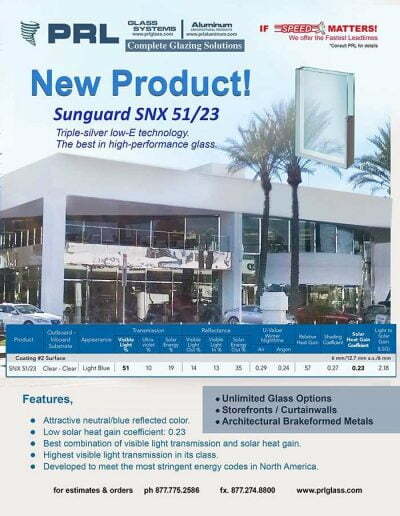 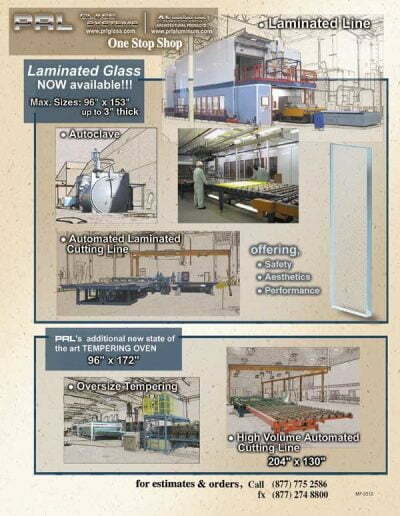 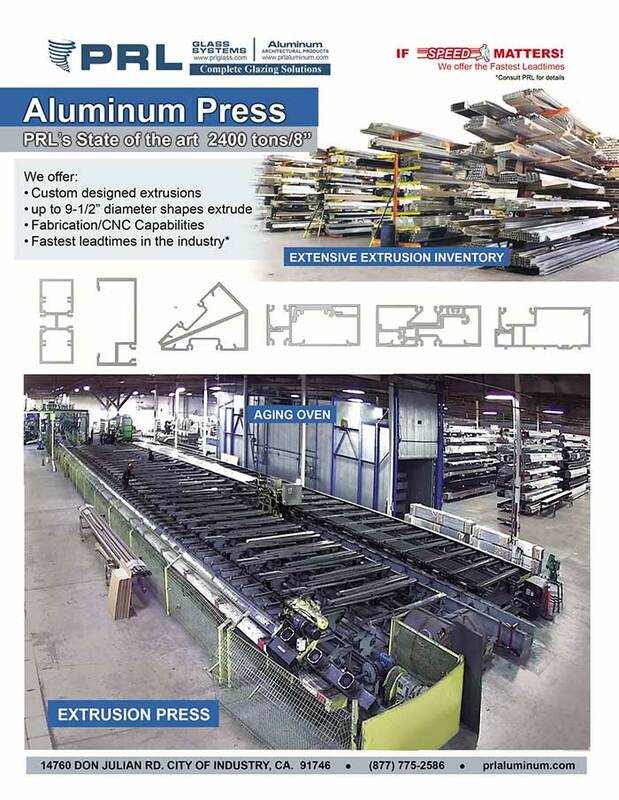 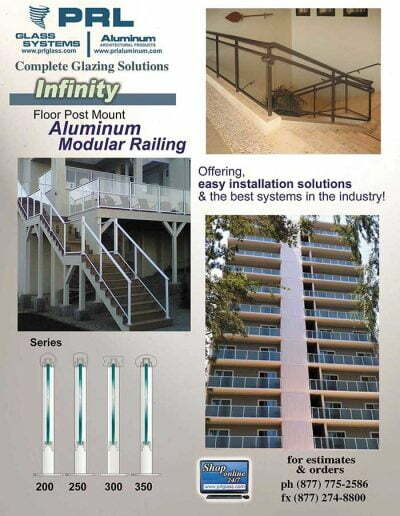 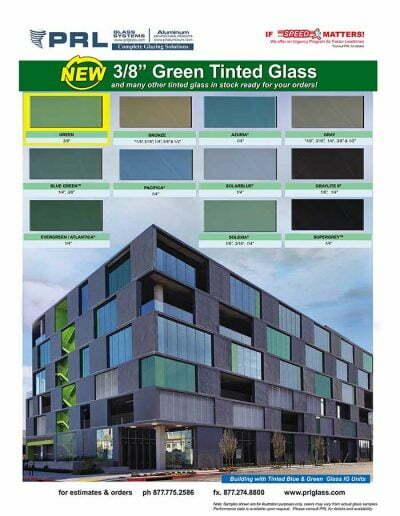 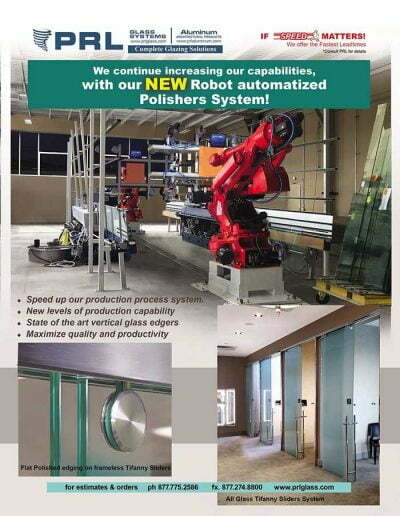 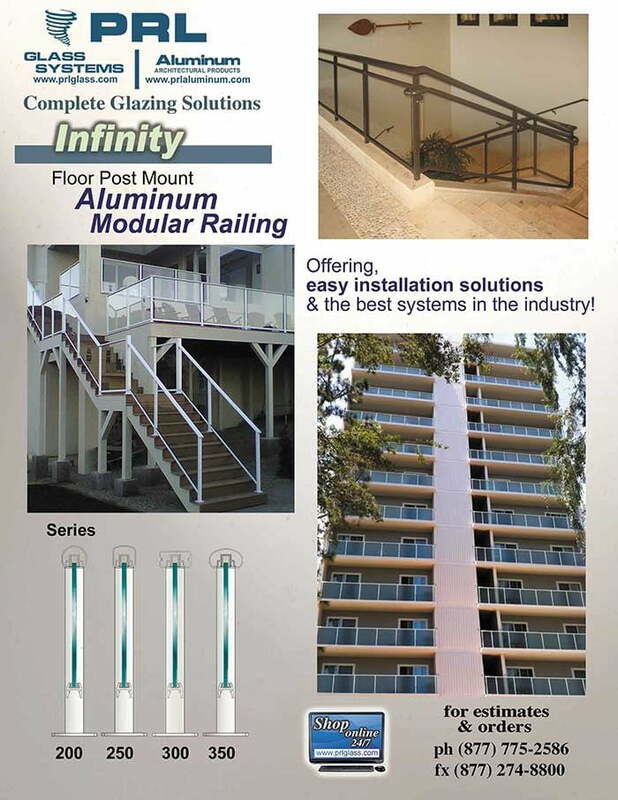 Combine your aluminum and glass for better pricing. 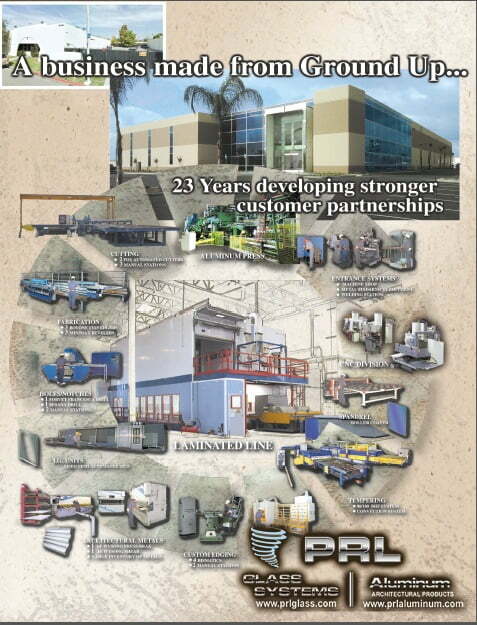 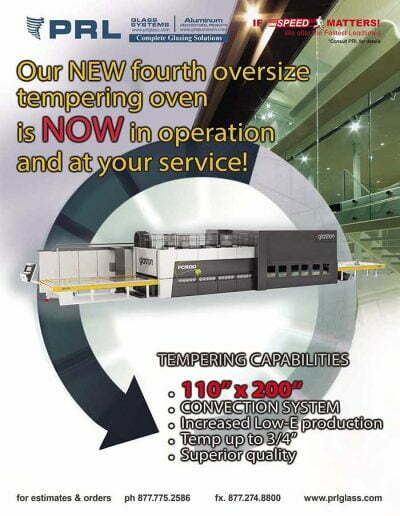 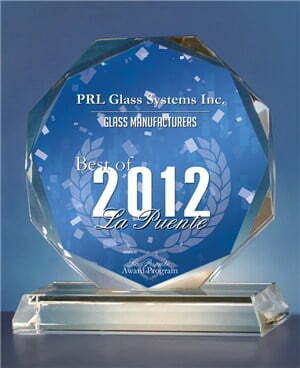 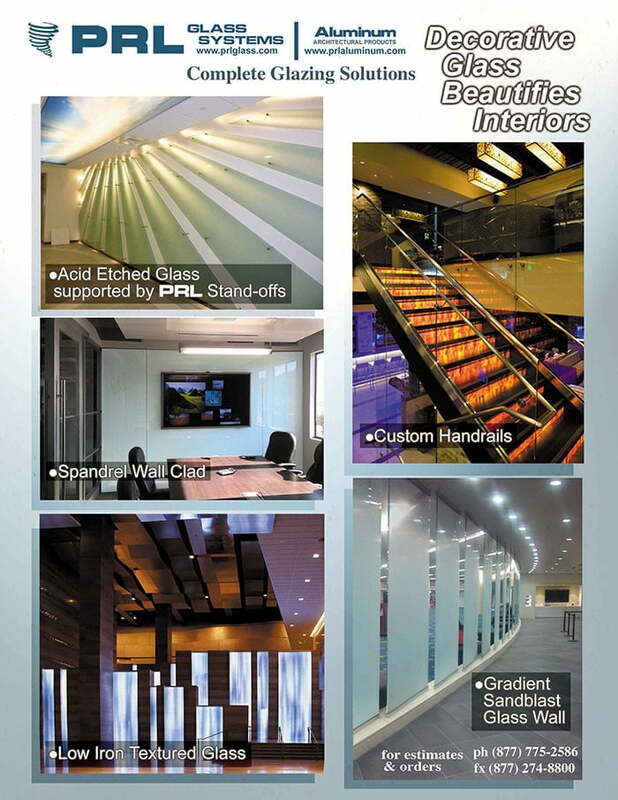 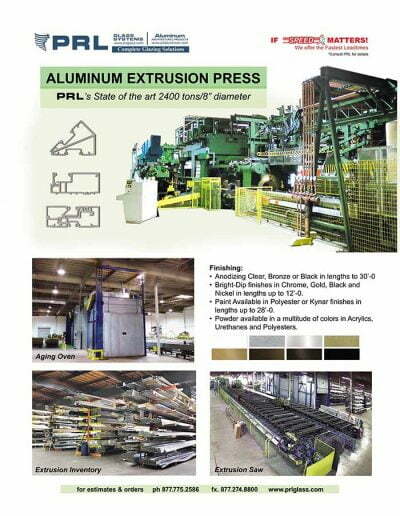 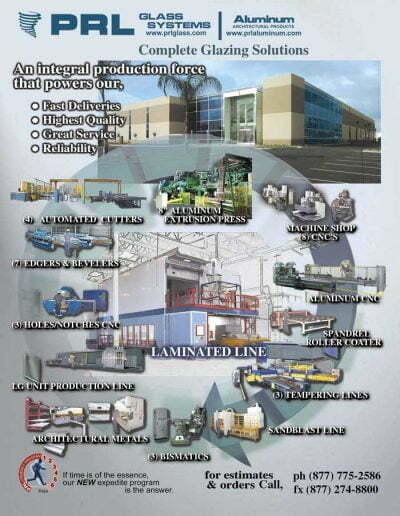 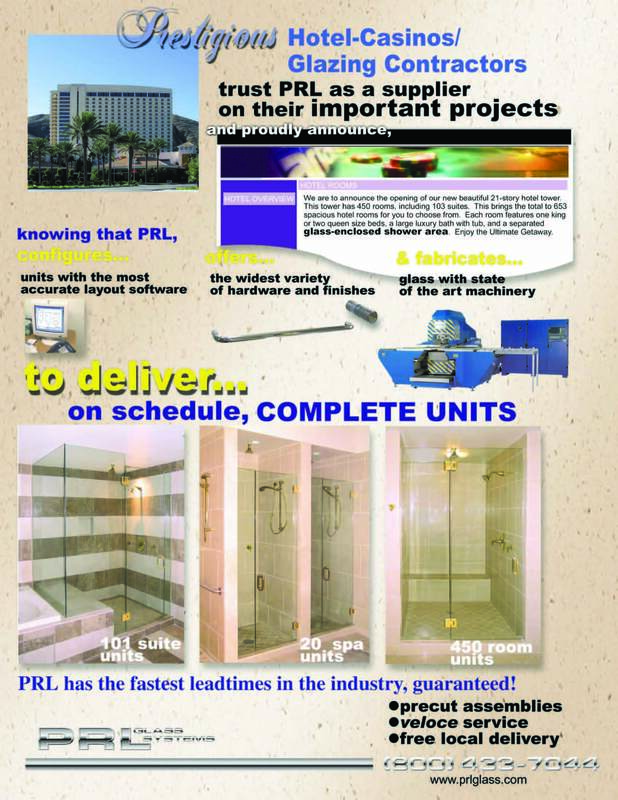 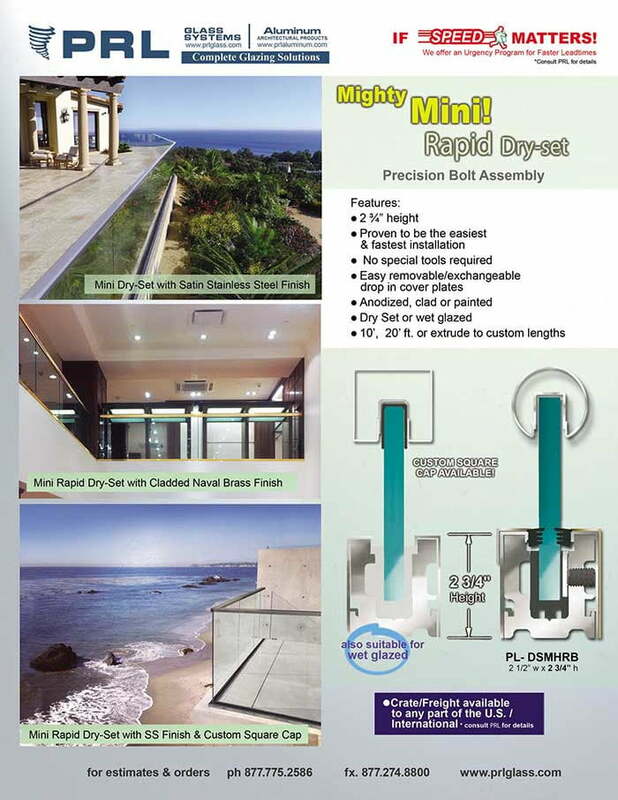 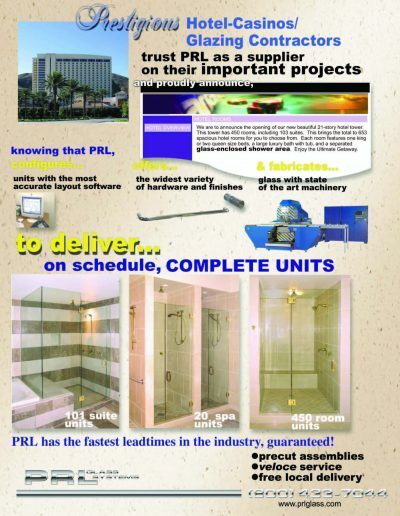 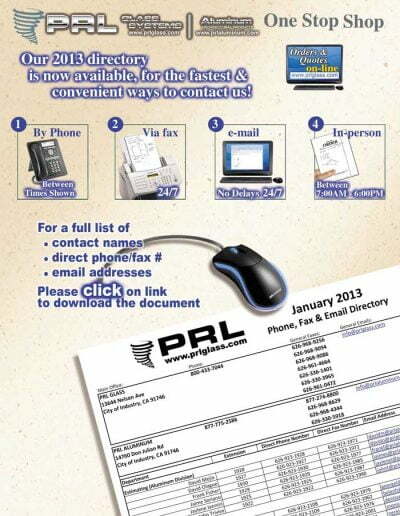 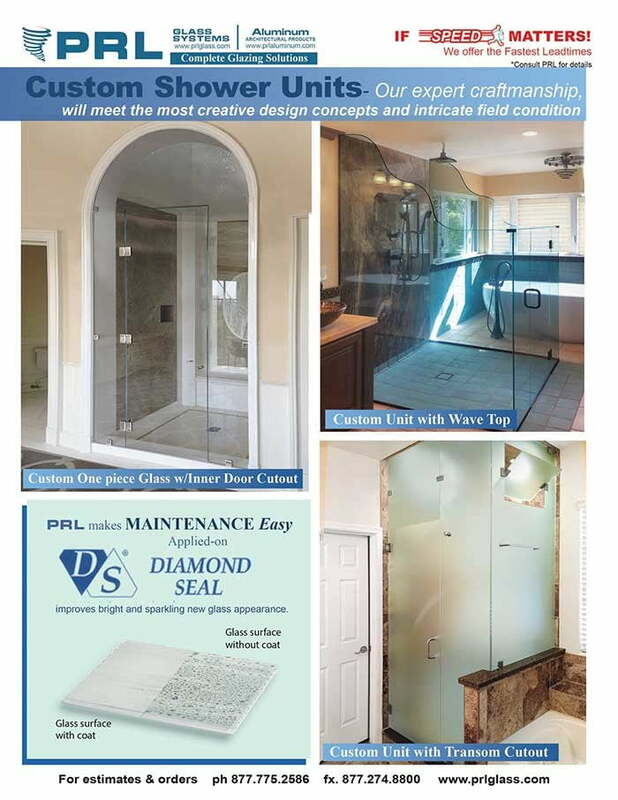 At PRL we are well known for providing custom systems and having the fastest production turn around in the industry. 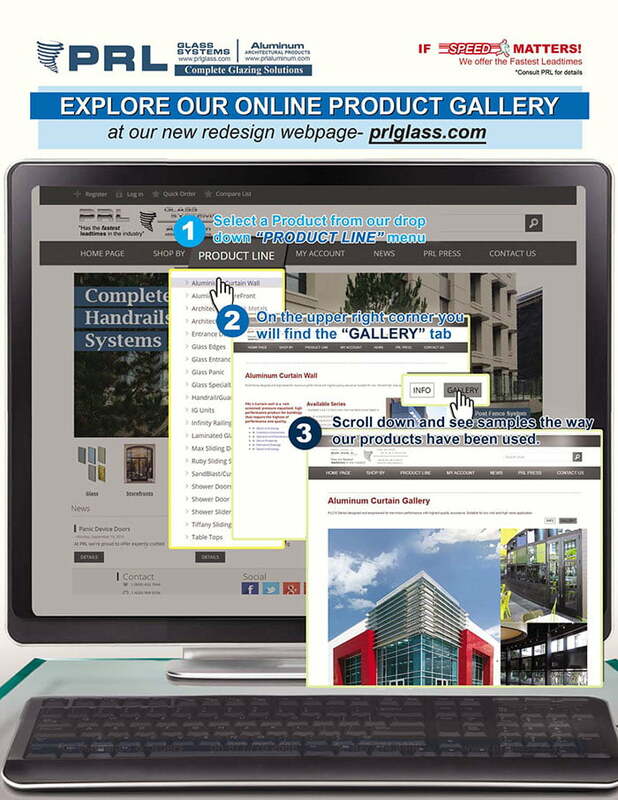 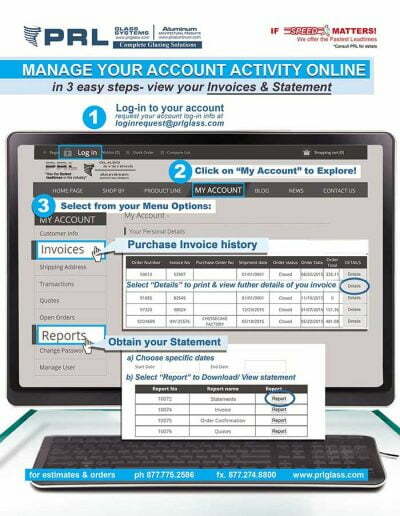 Envision your storefront system like the unlimited canvas it is. 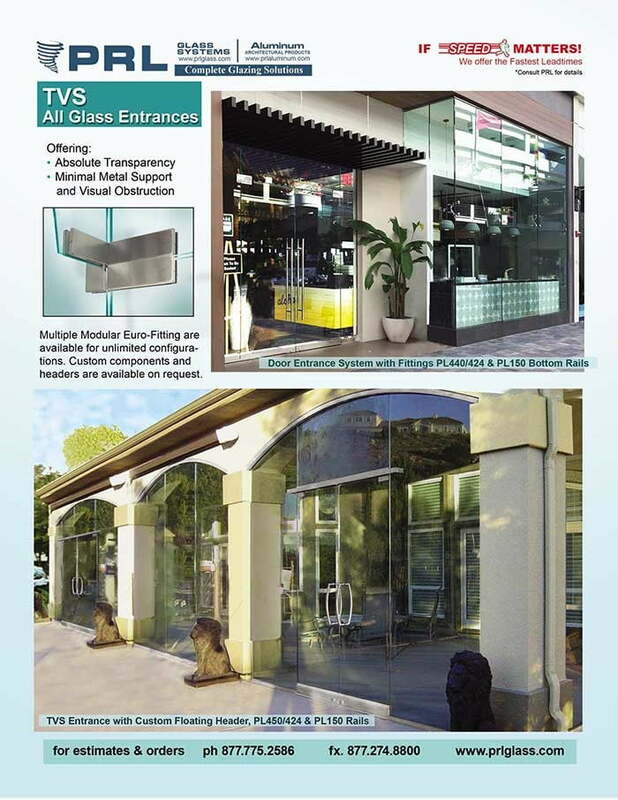 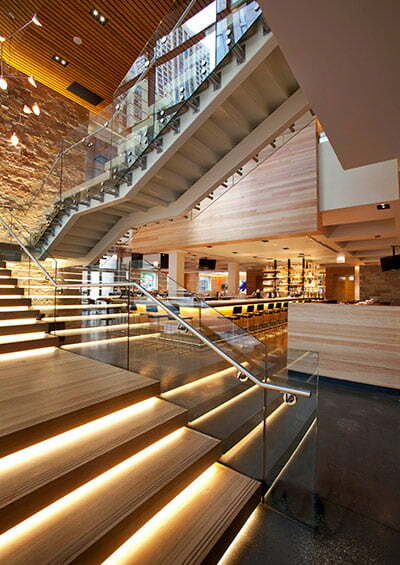 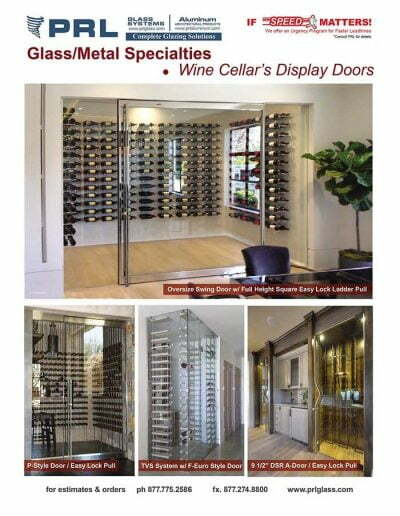 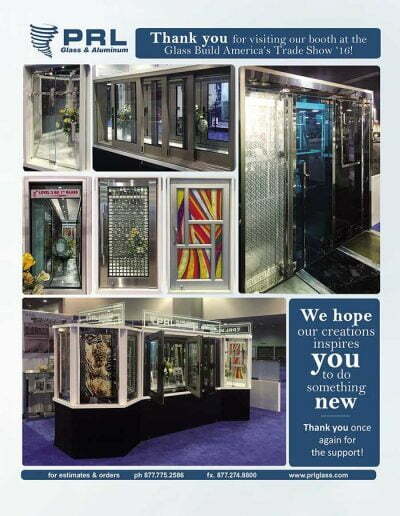 Turn your glass and aluminum storefront into an awe-inspiring passageway. 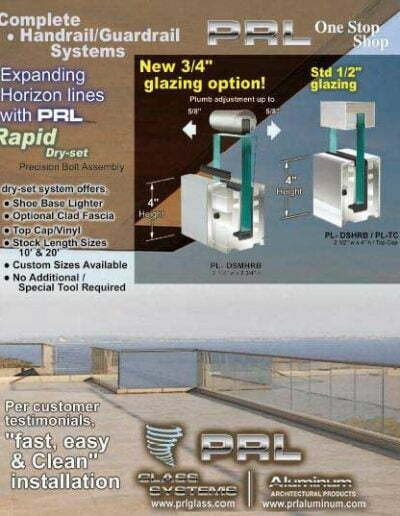 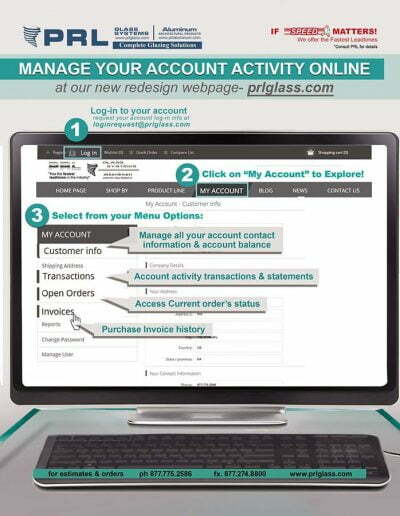 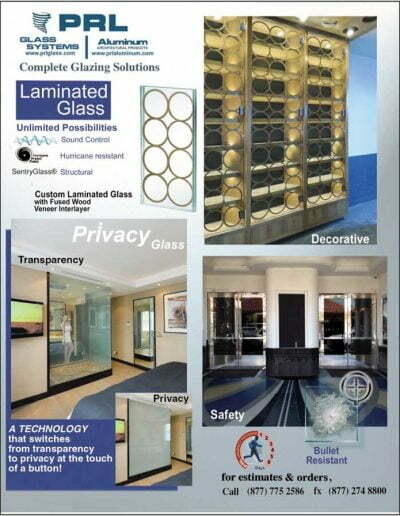 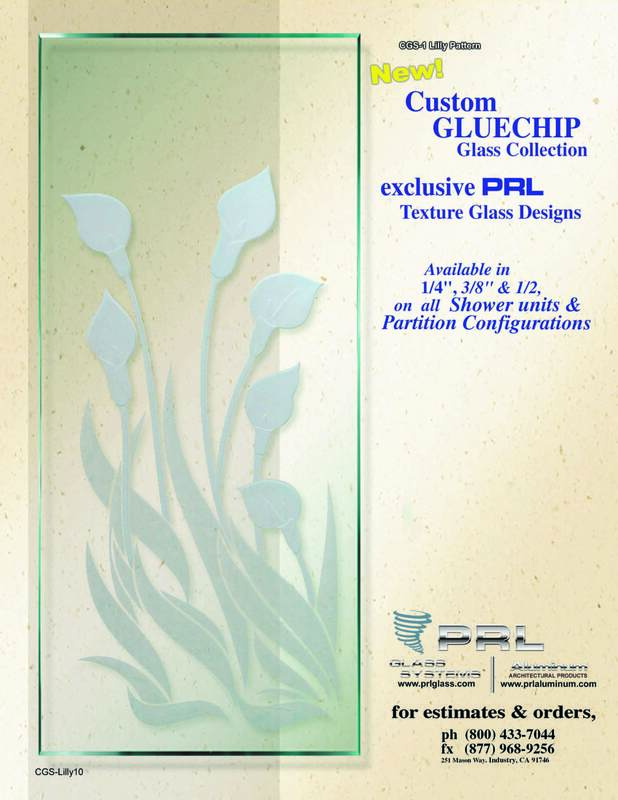 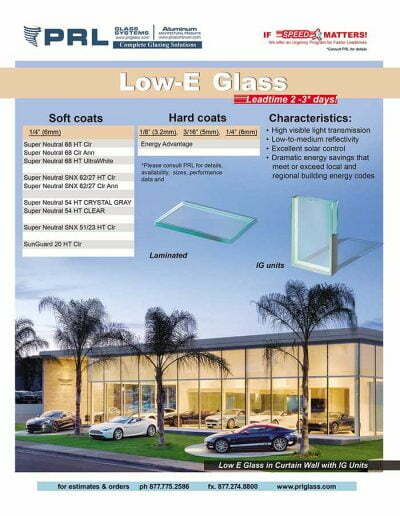 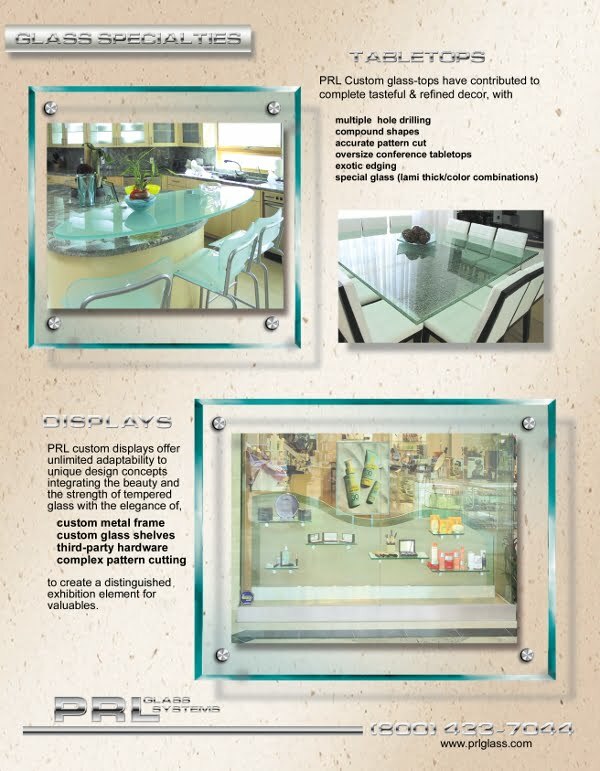 Customize it with PRL Glass & Aluminum! 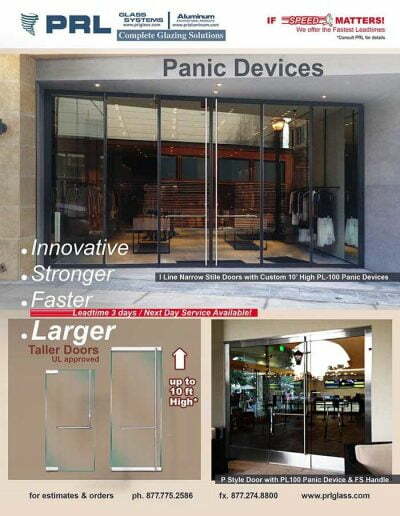 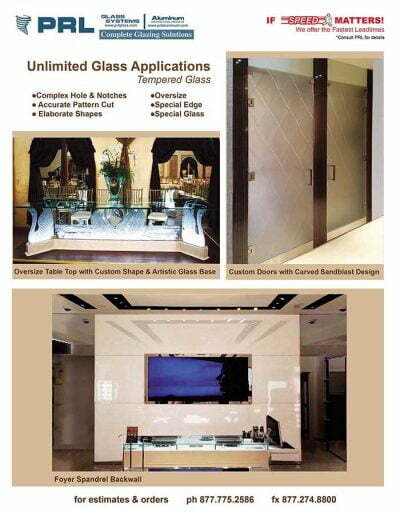 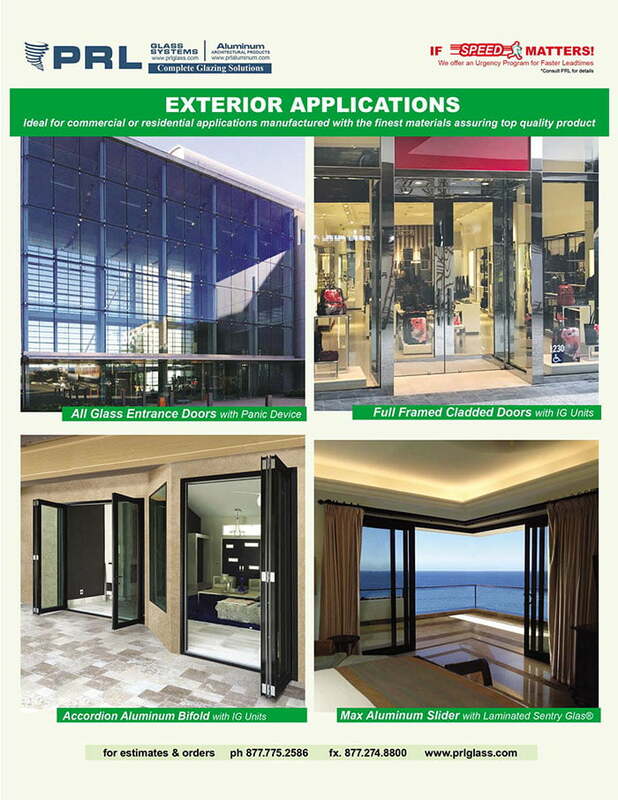 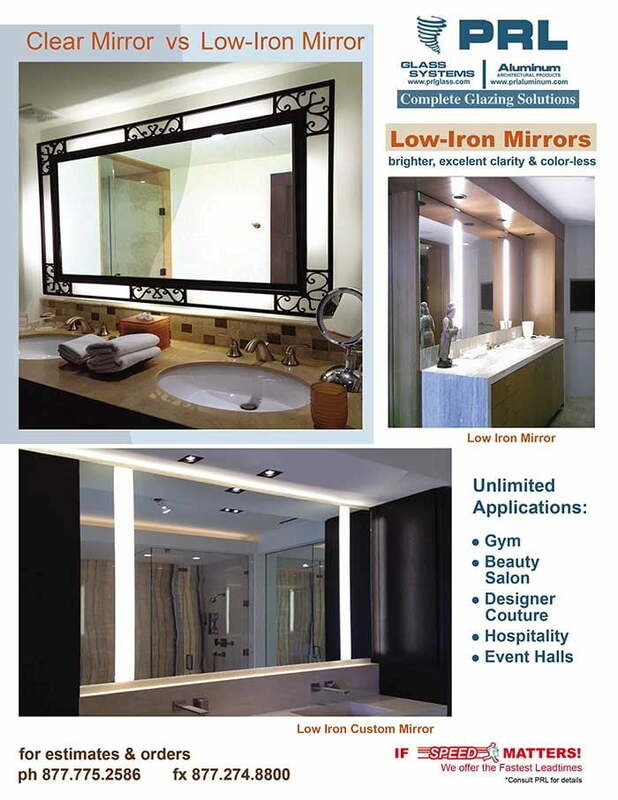 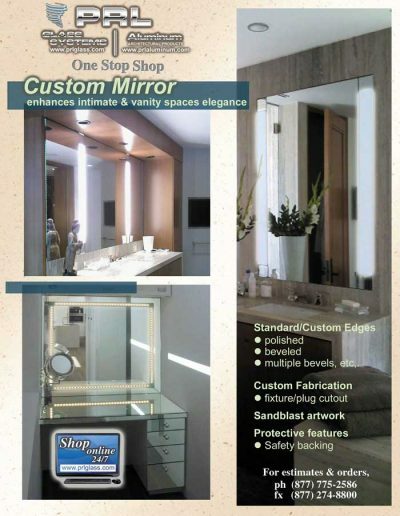 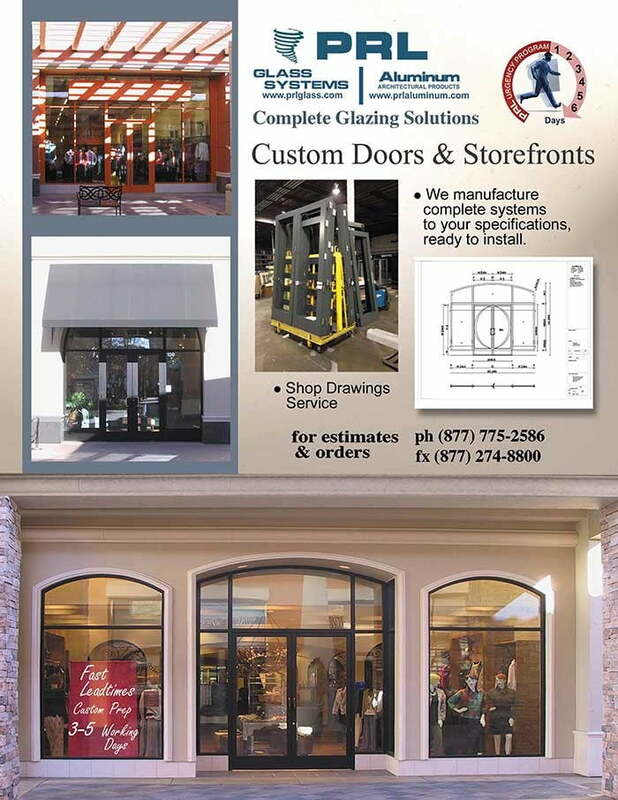 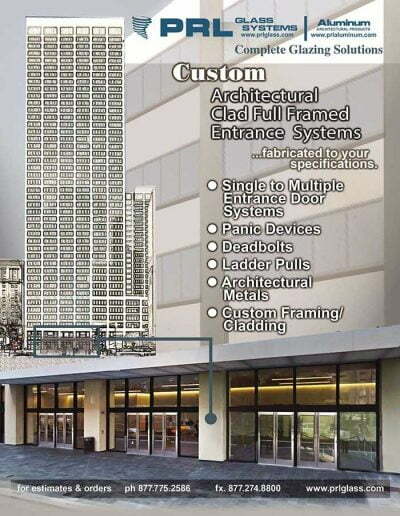 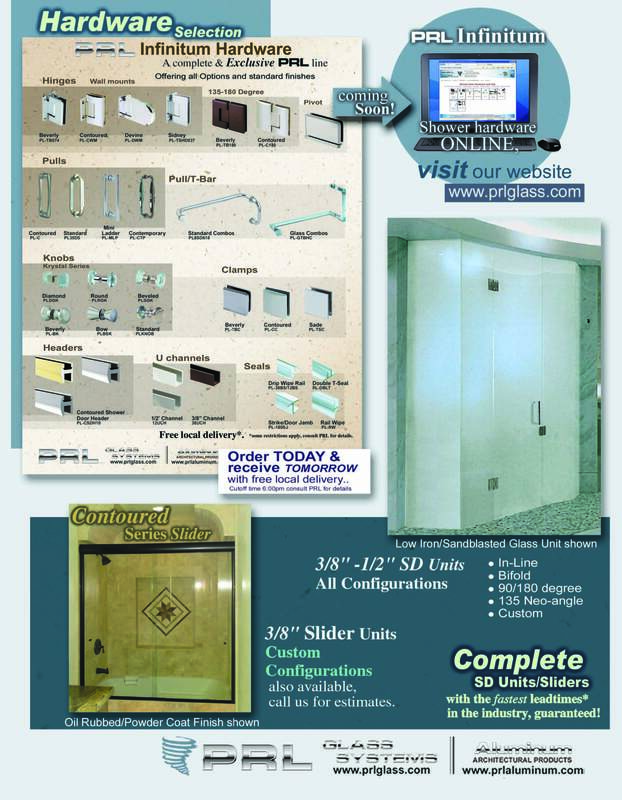 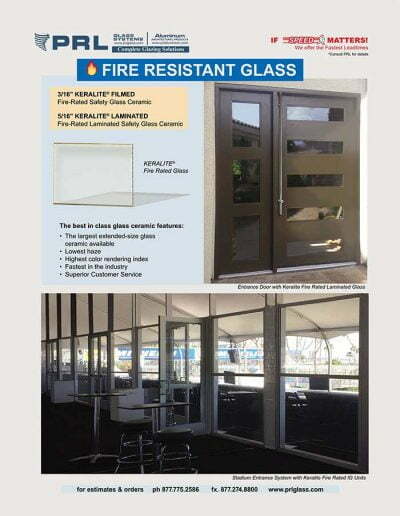 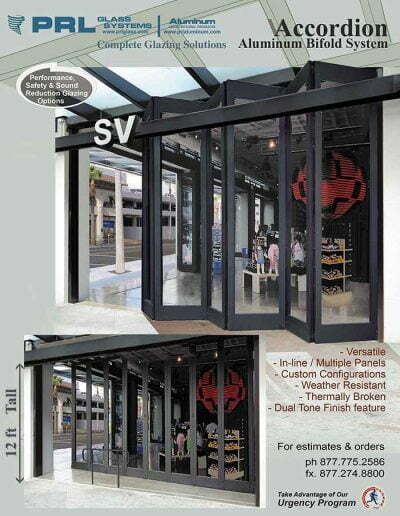 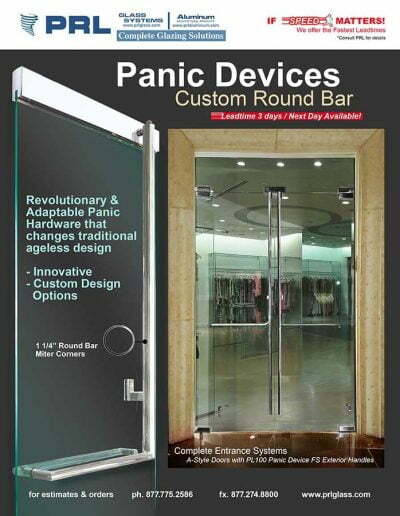 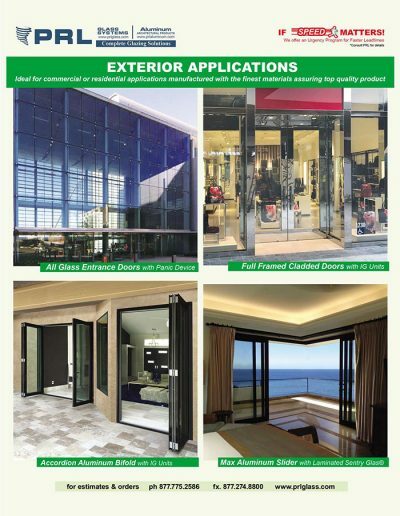 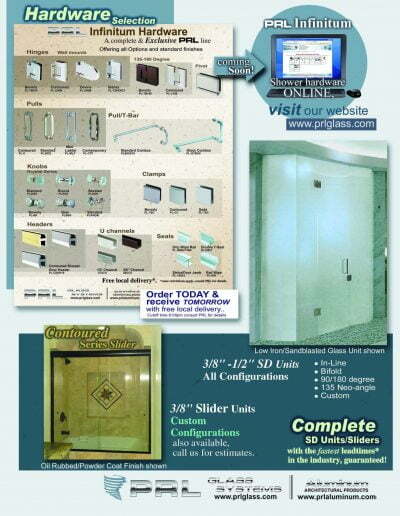 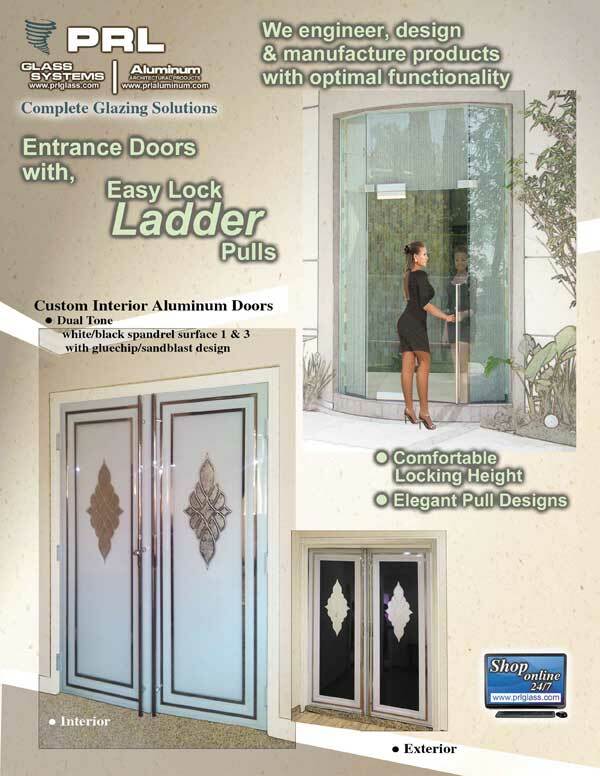 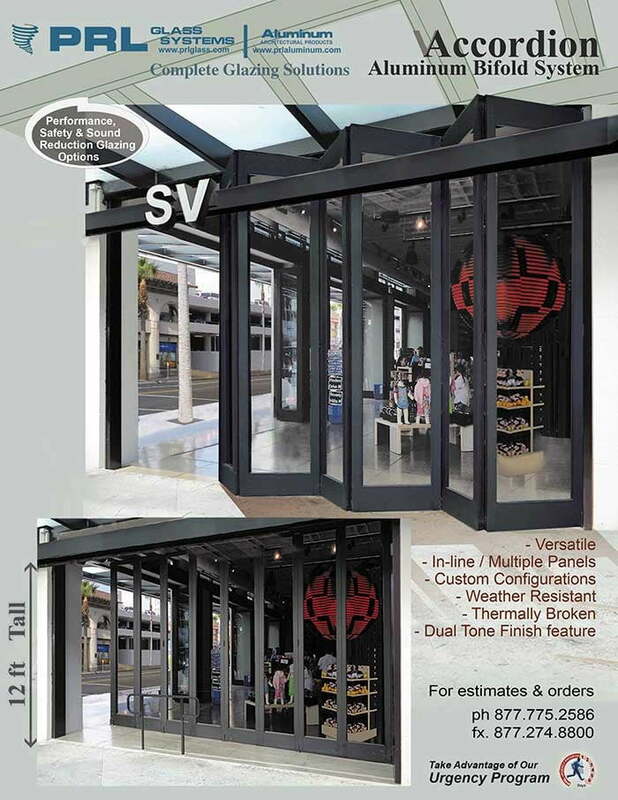 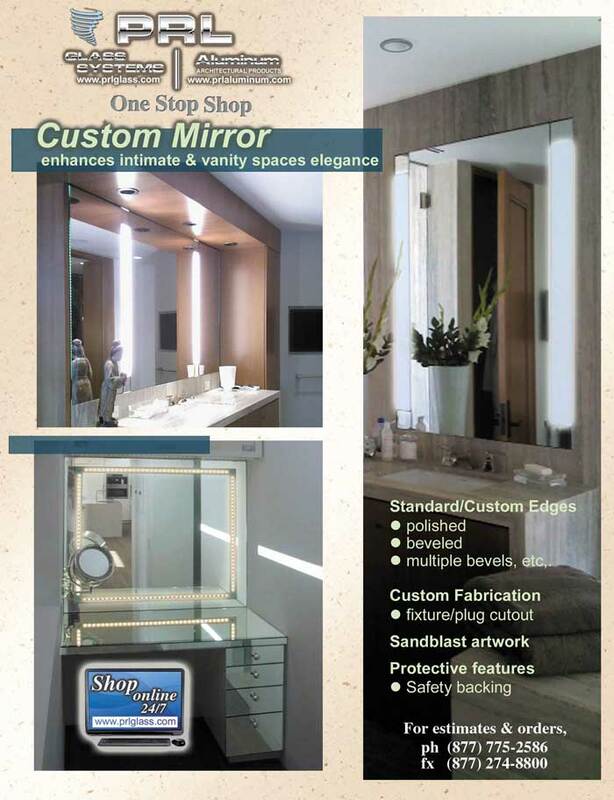 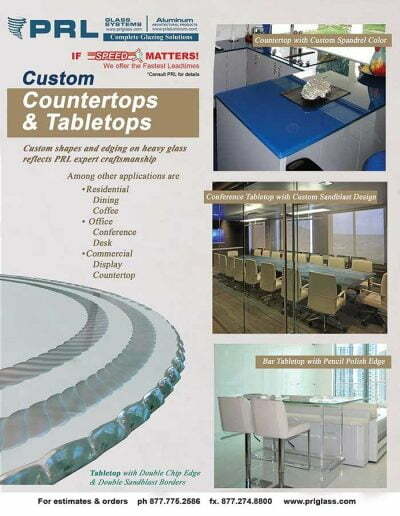 We can manufacture infinite custom ingress doors and storefronts. 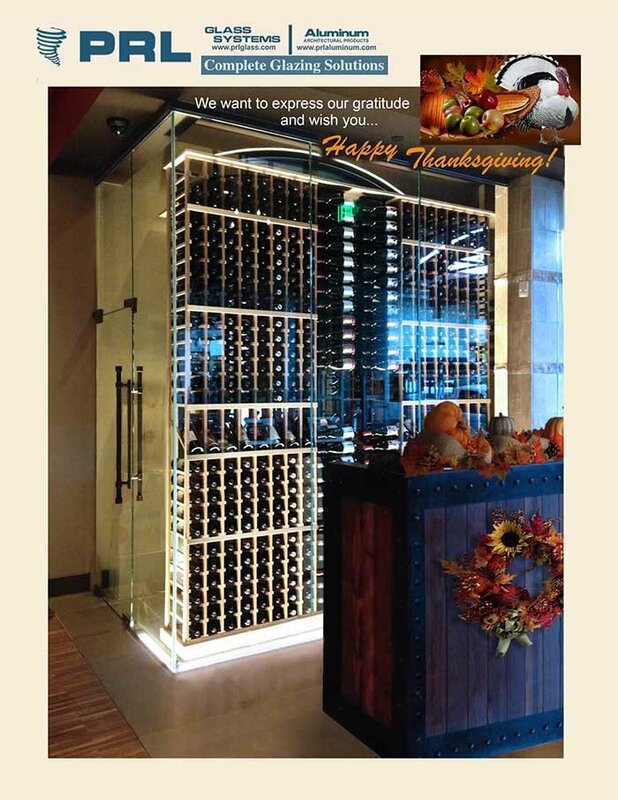 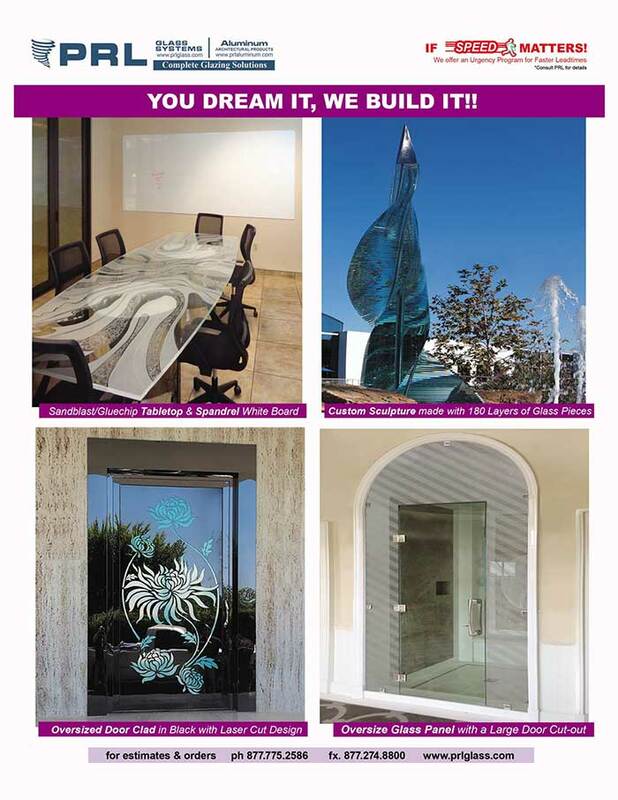 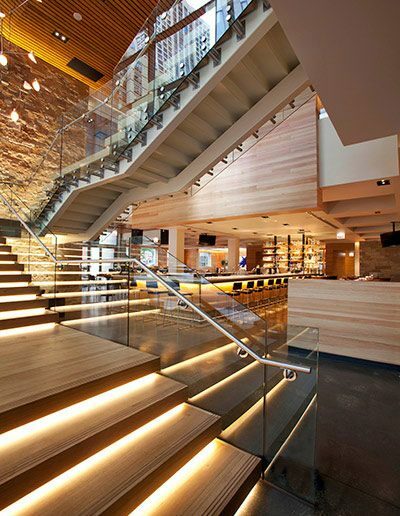 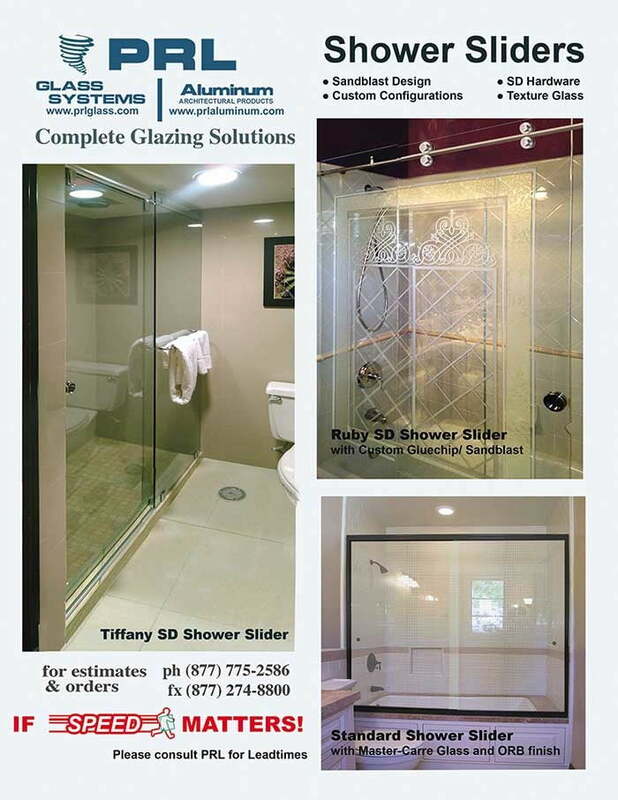 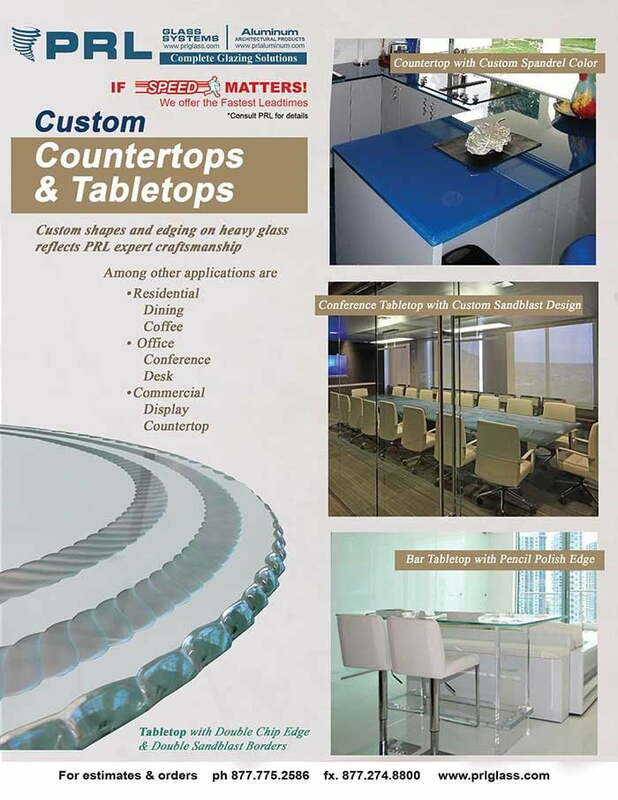 Whether your designs call for specialized glass panels, brake metal, or aluminum extrusions, we can make your dreams come true. 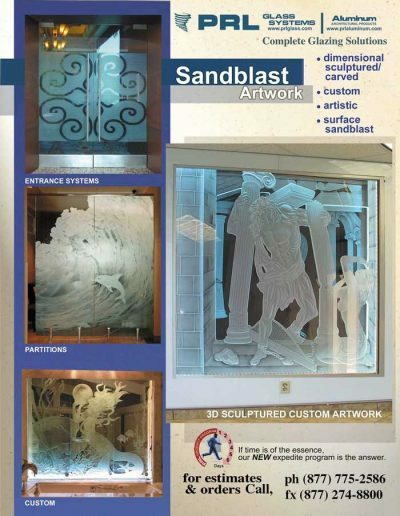 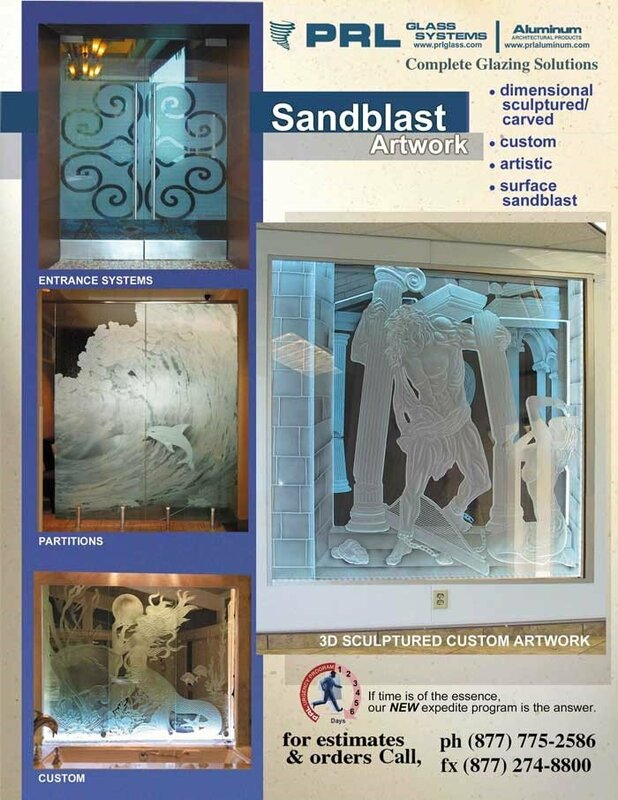 We can produce a limitless array of custom sandblasted images, laminated inlays, cladded facias, curved transoms and more. Be the envy of all and design a head-turning threshold with us. Offering six series of center and offset glazed systems, our framing options can accommodate a wide array of glass and aluminum storefront designs. 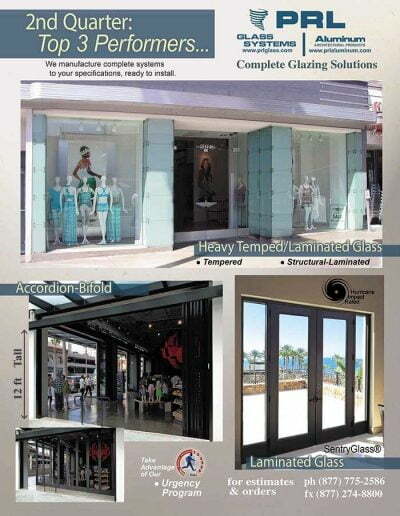 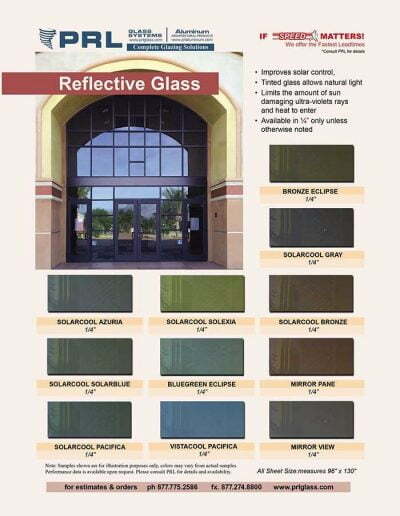 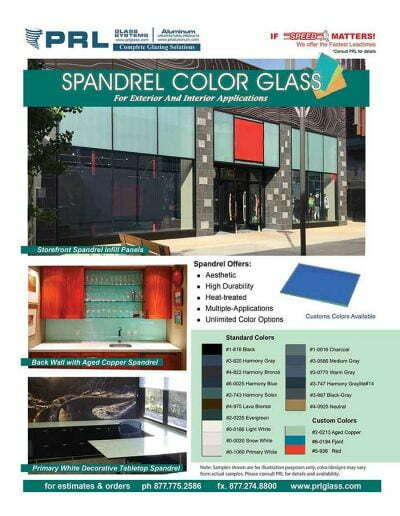 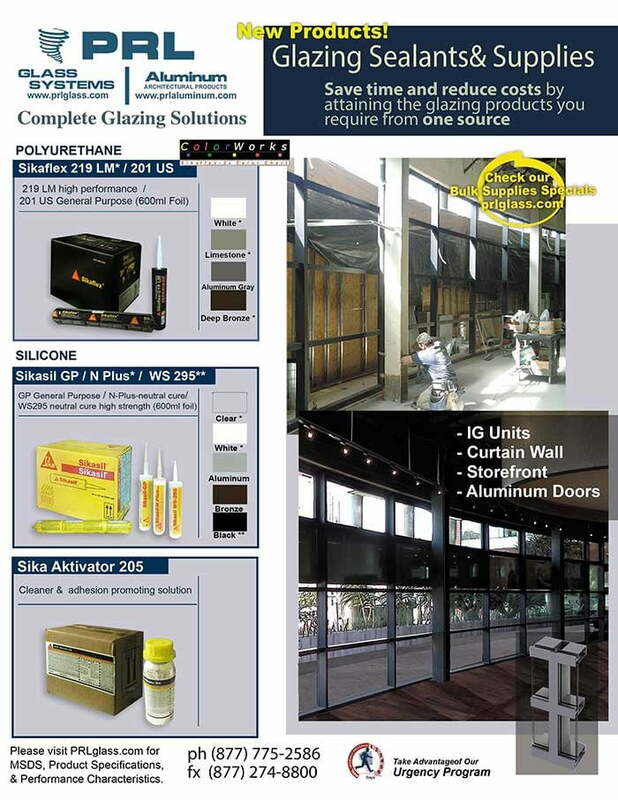 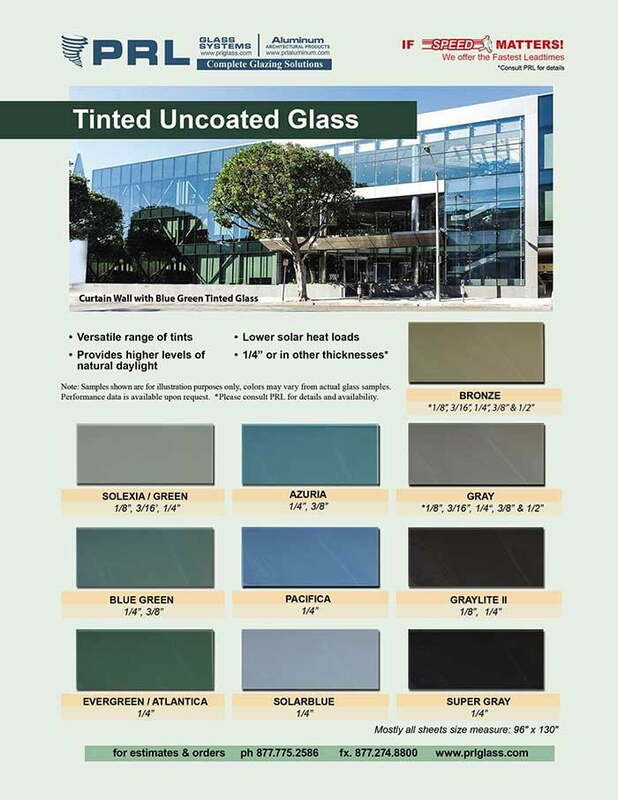 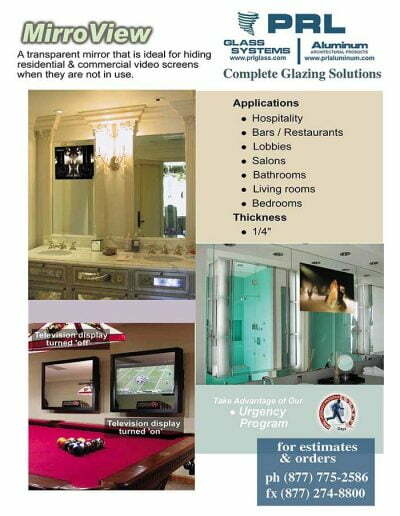 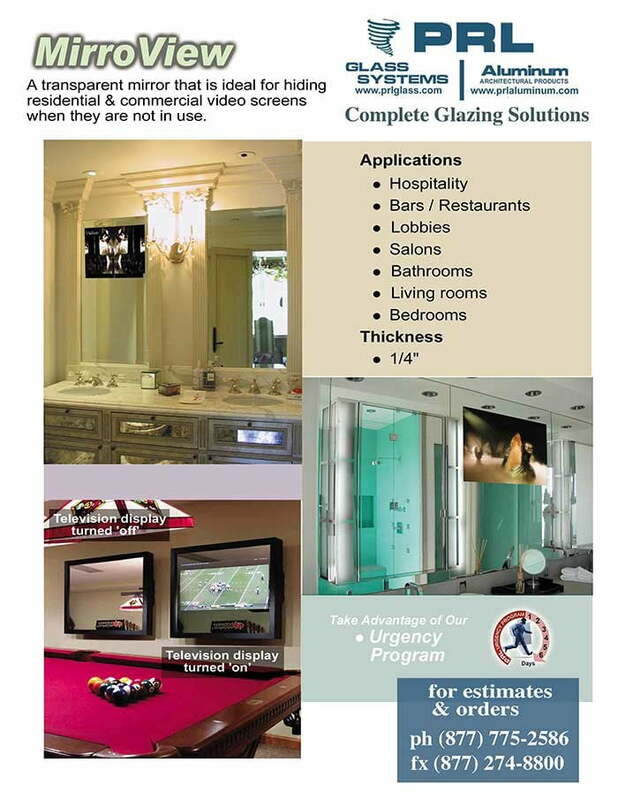 Manufactured for exterior and interior commercial, industrial and residential applications, you can count on our storefront glazing series. 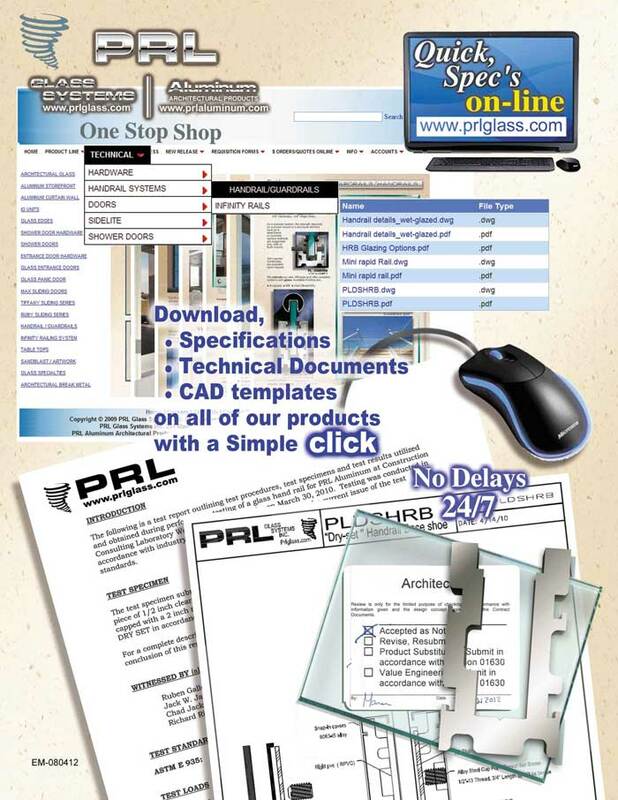 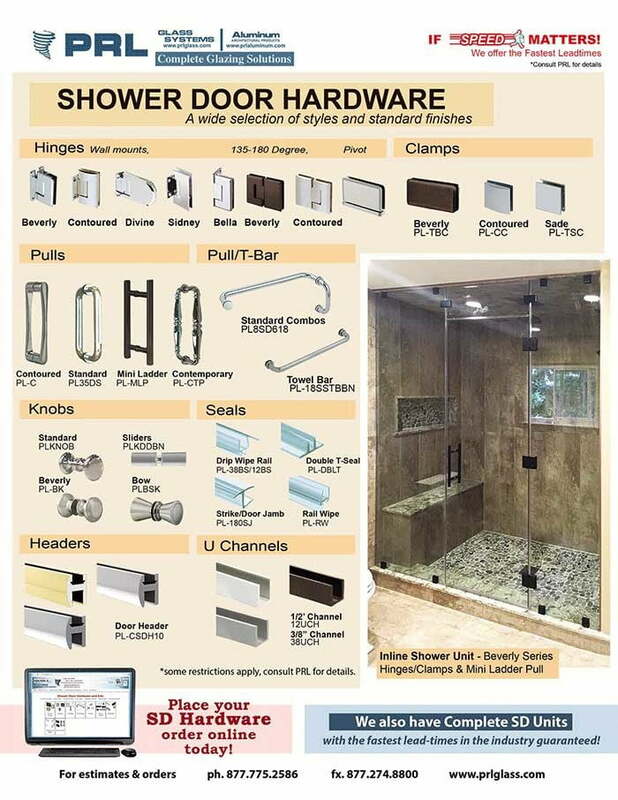 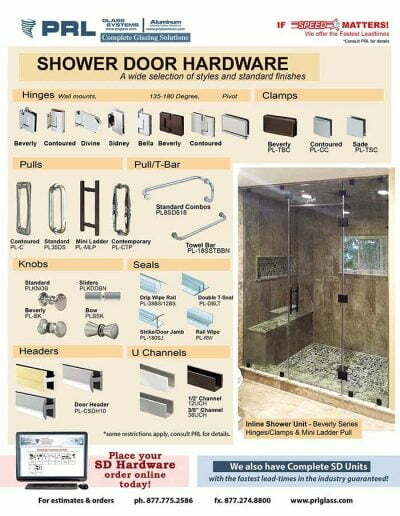 Just like any good tradesperson needs the right tools for the job, so do contractors, specifiers and installers. 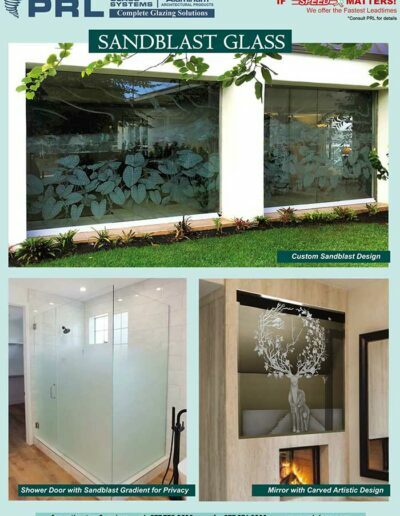 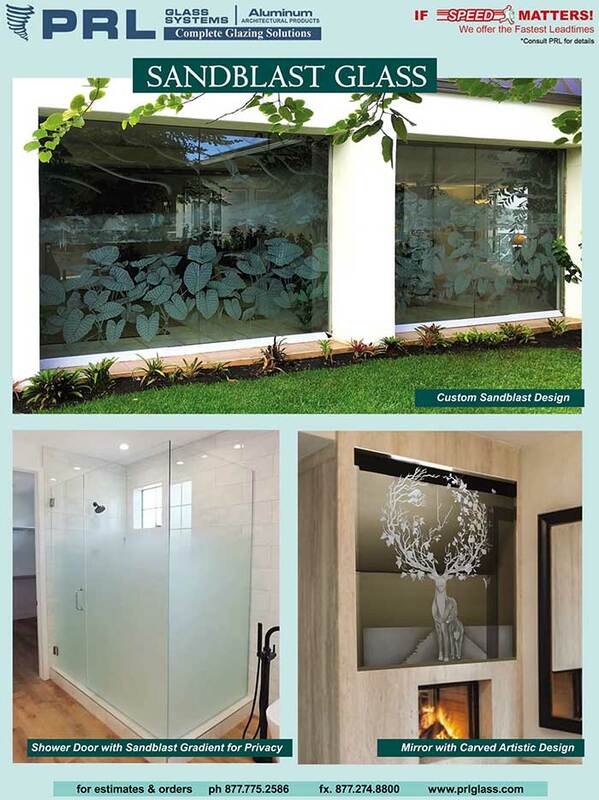 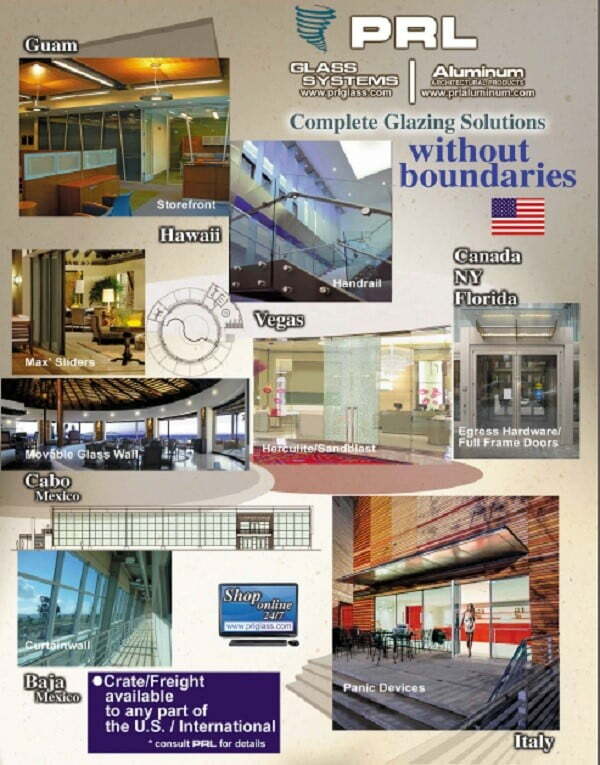 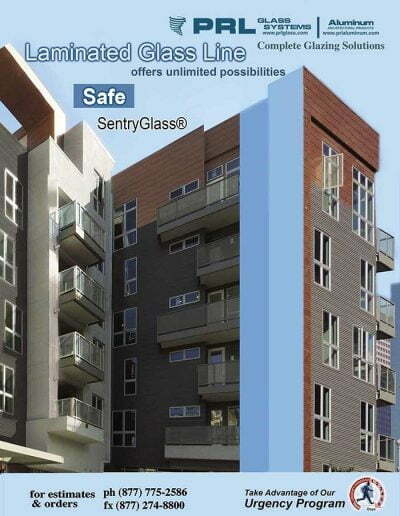 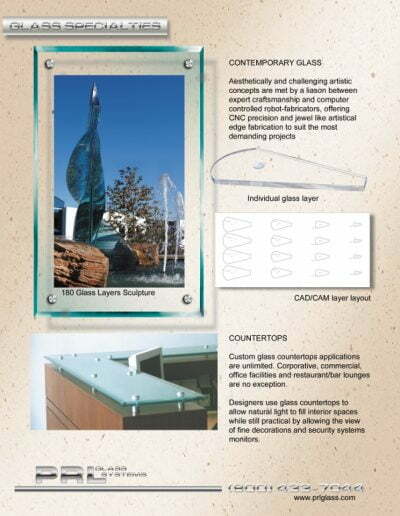 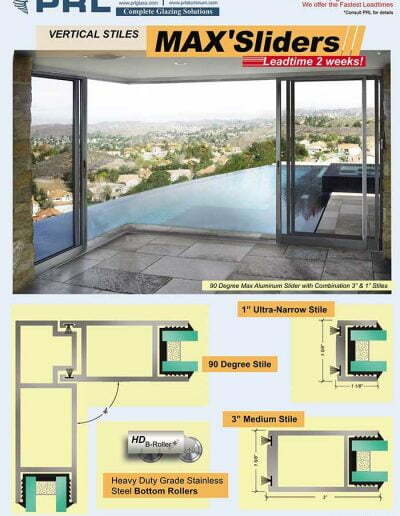 That’s why our center and offset glazed systems offer design flexibility. 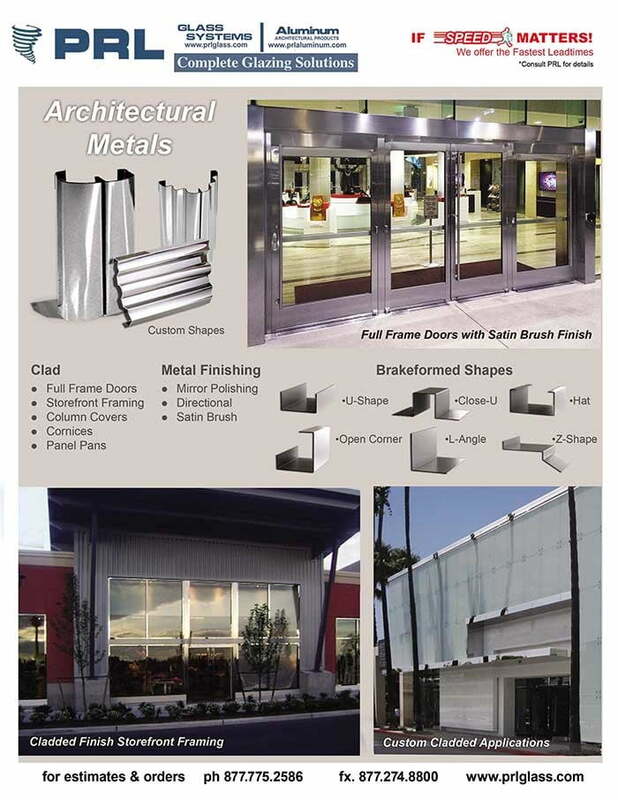 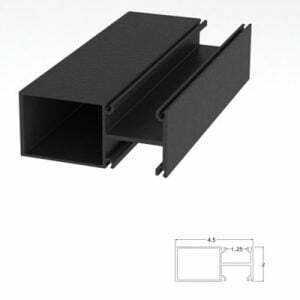 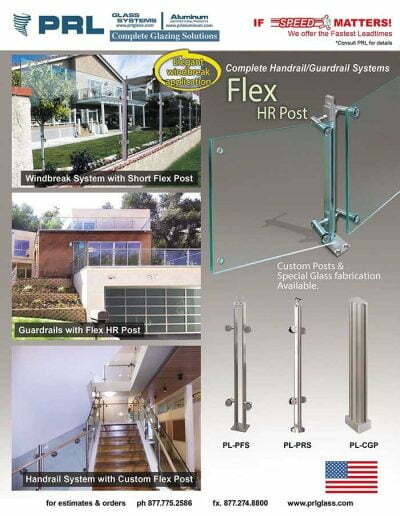 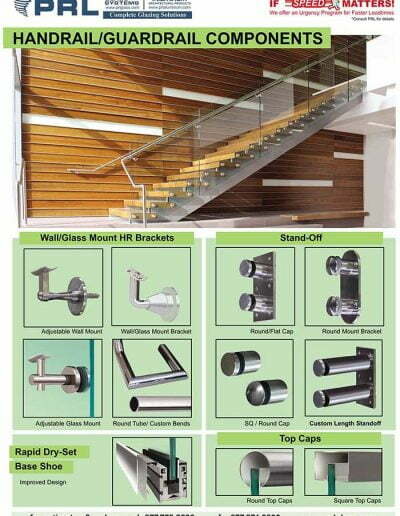 Manufactured to be compatible with a large assortment of our entrance doors, glass types, hardware and handles, these storefront framing components can meet virtually any architectural specification.